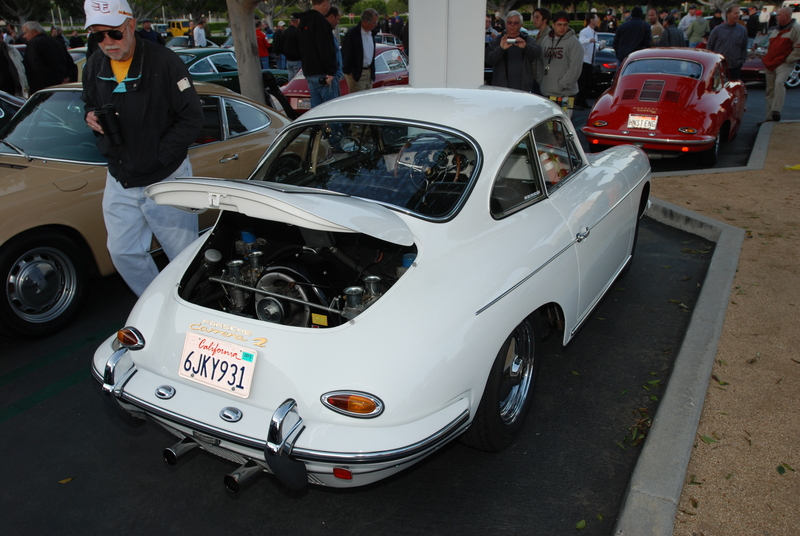 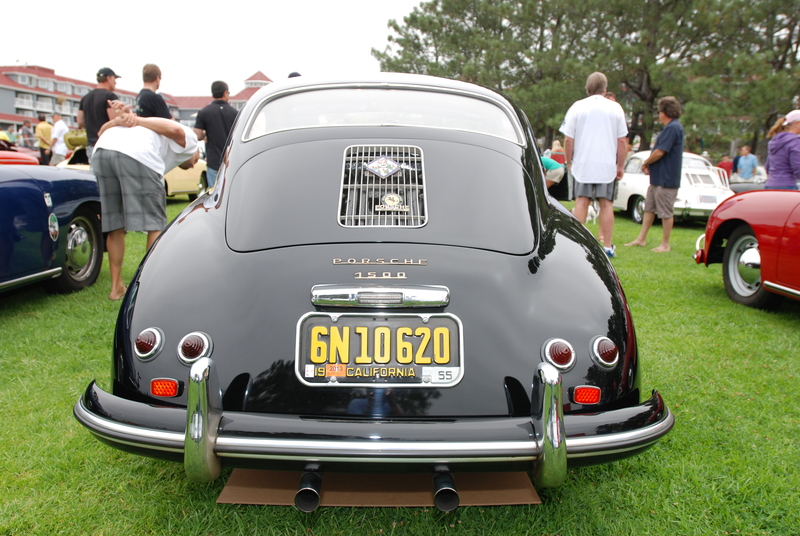 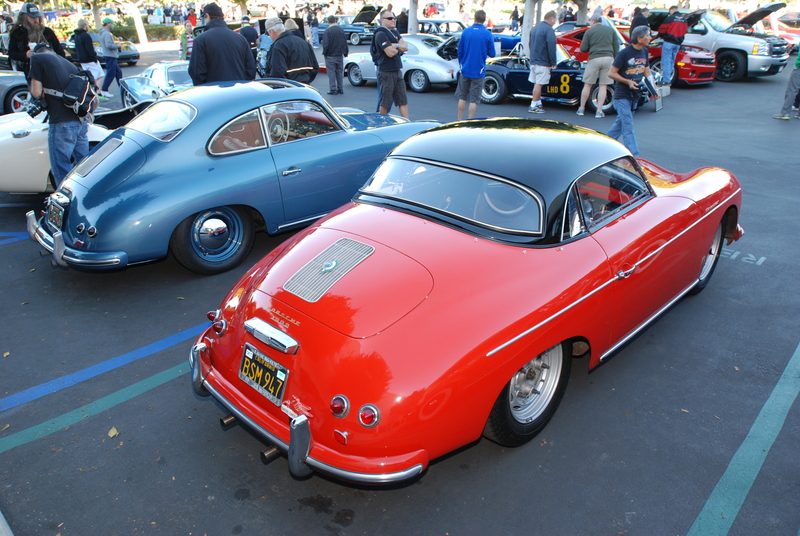 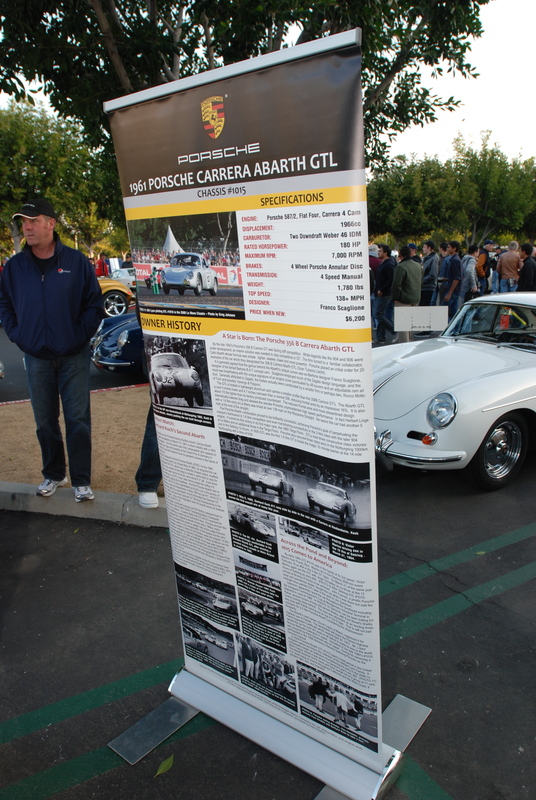 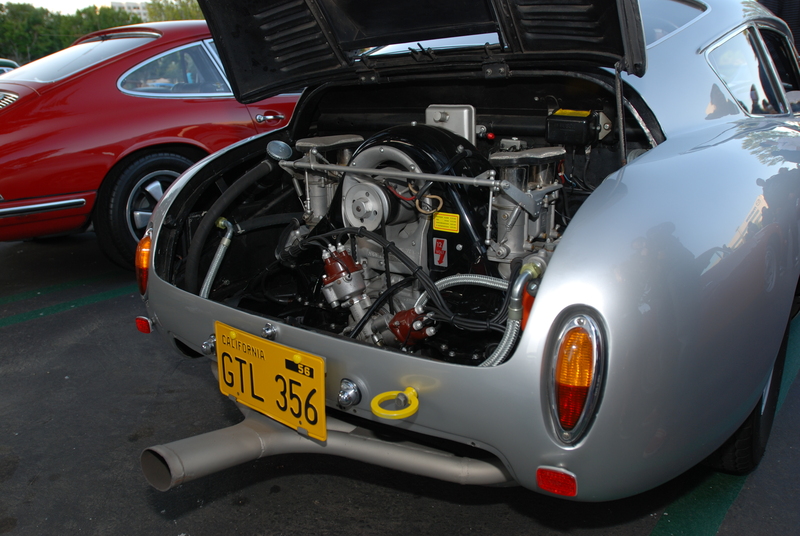 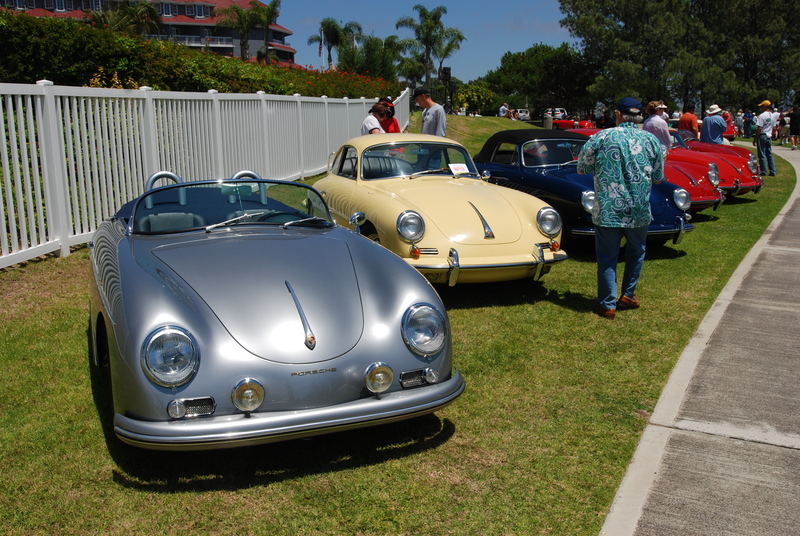 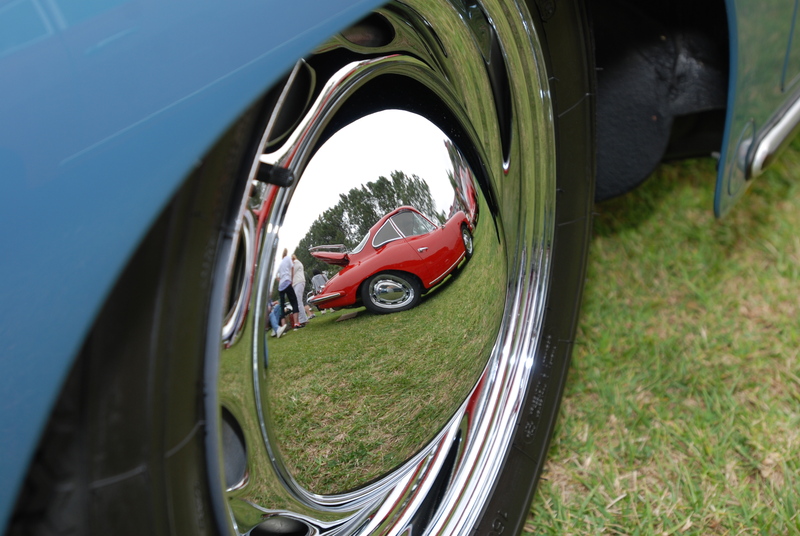 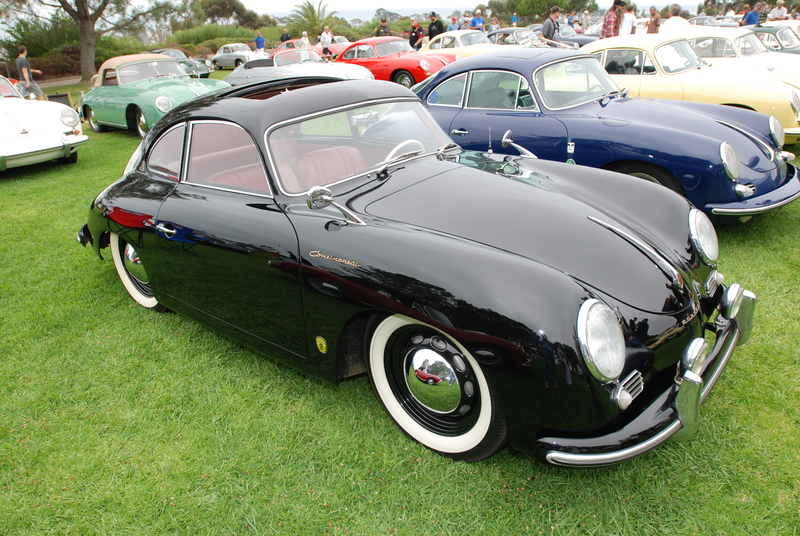 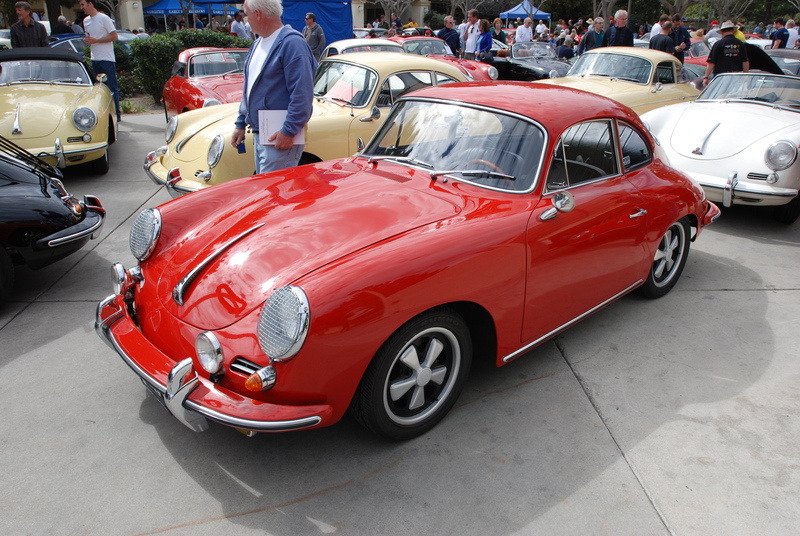 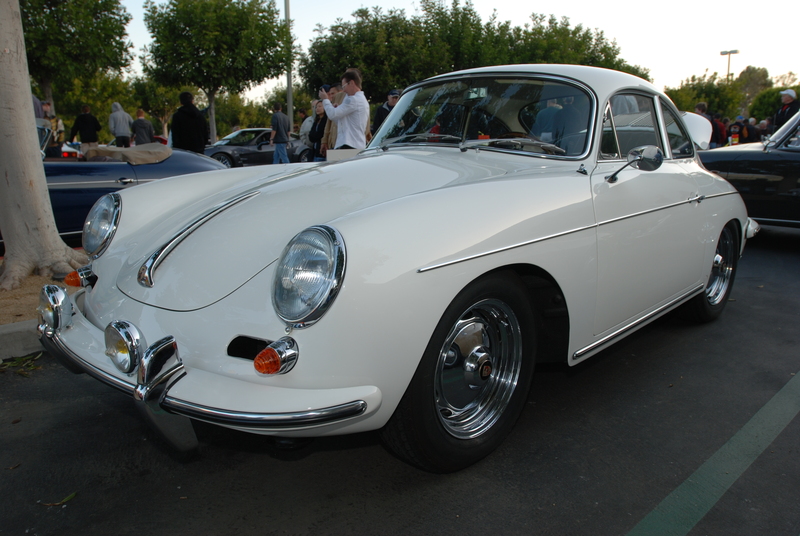 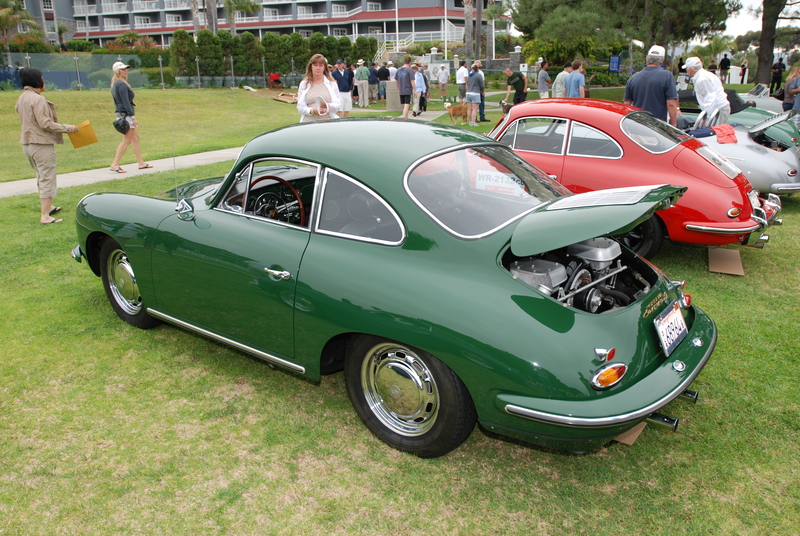 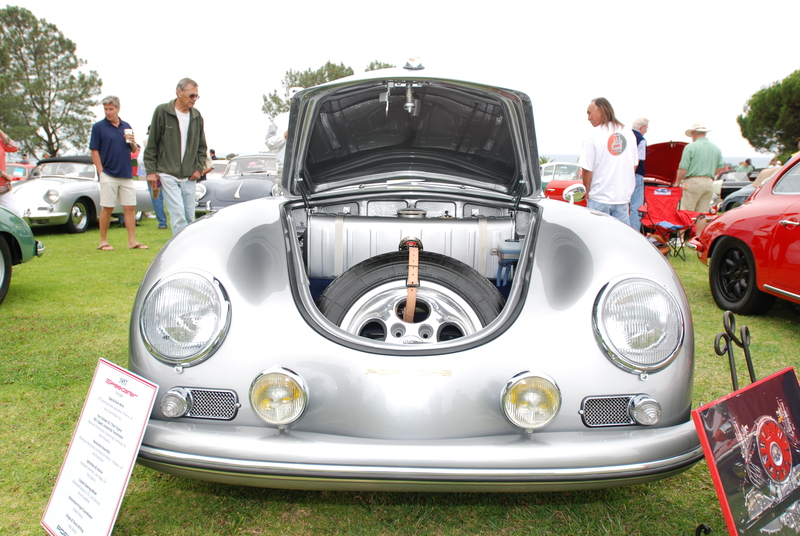 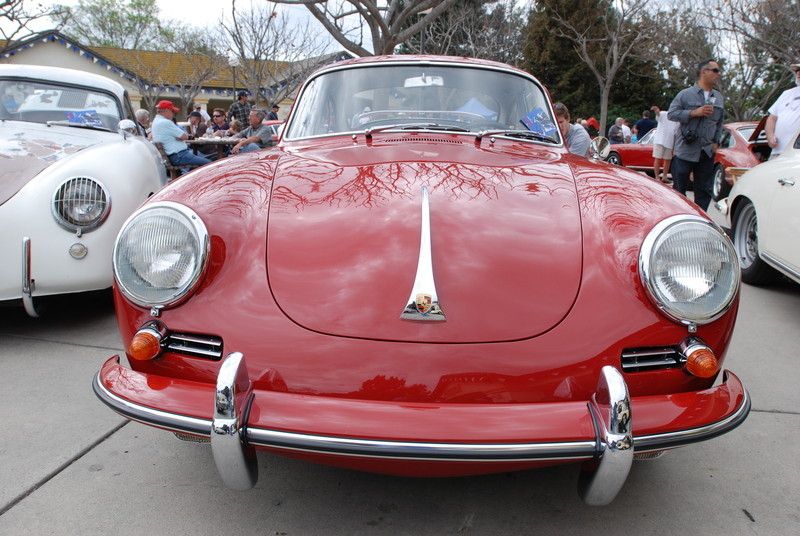 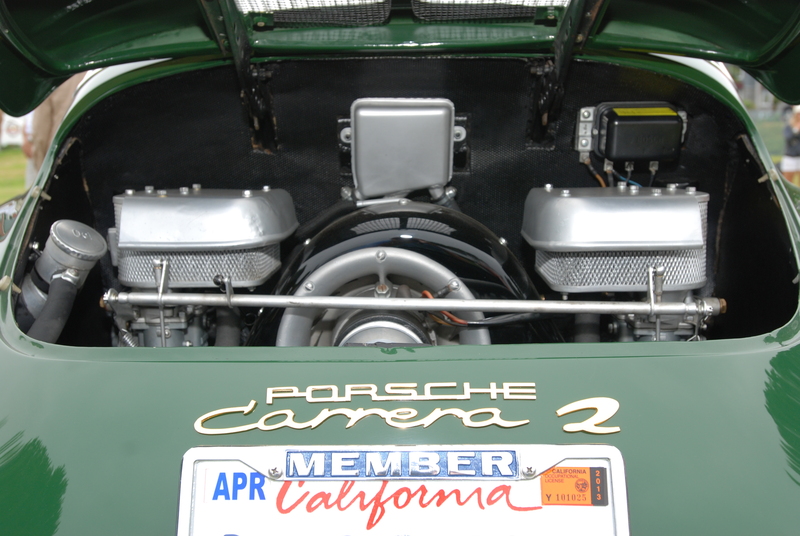 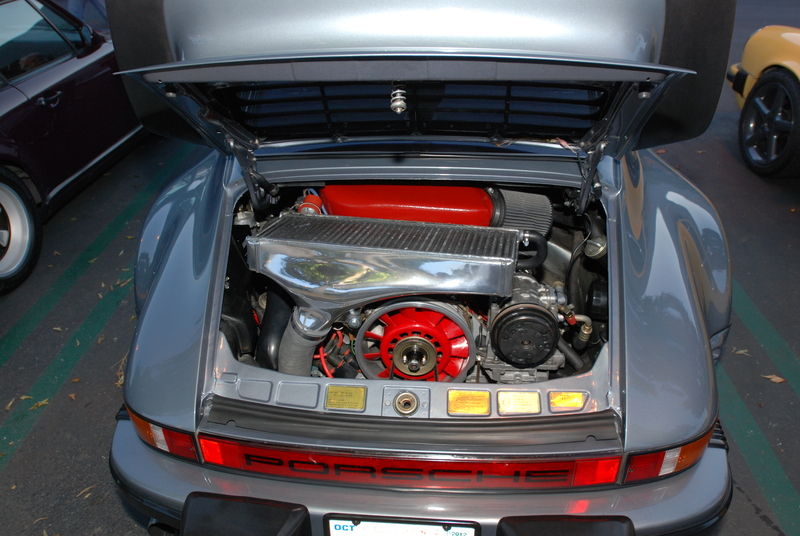 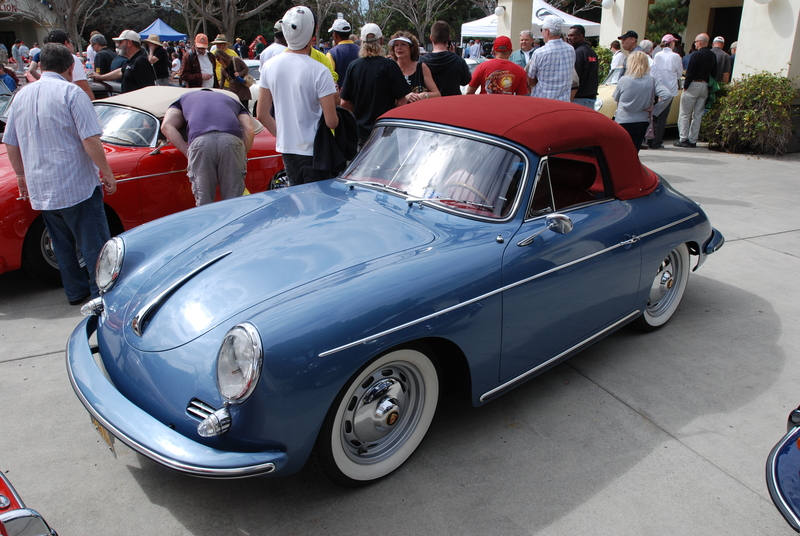 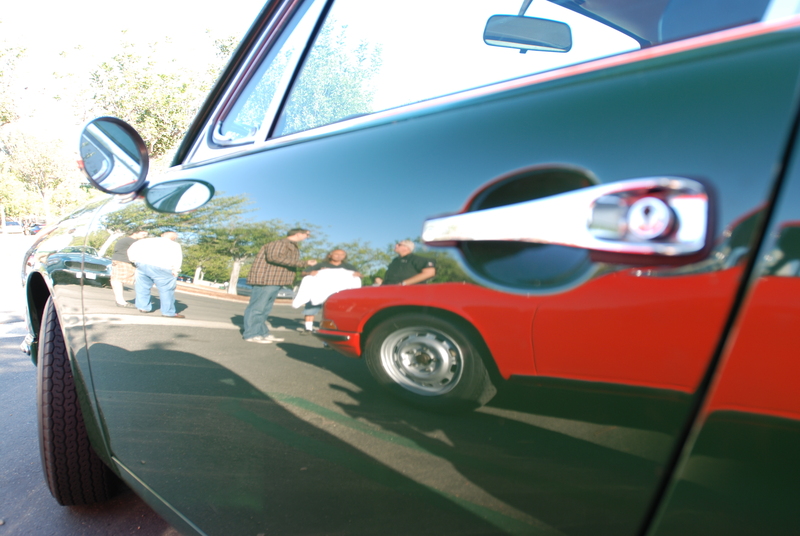 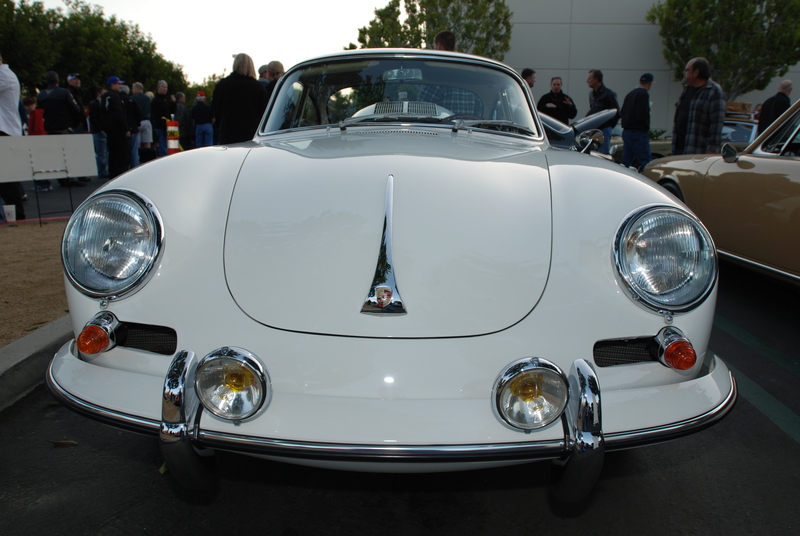 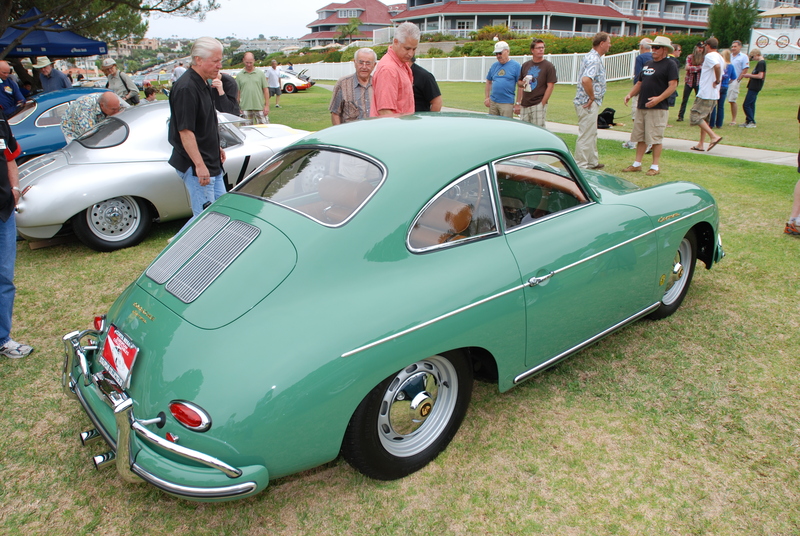 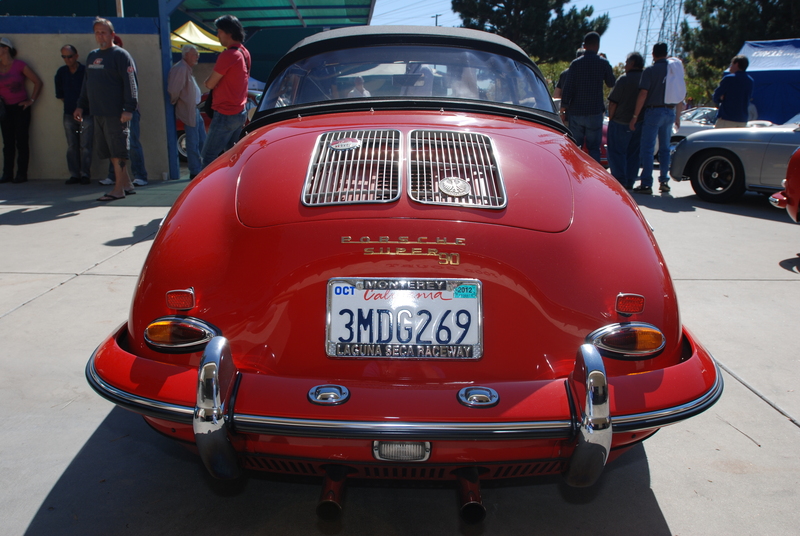 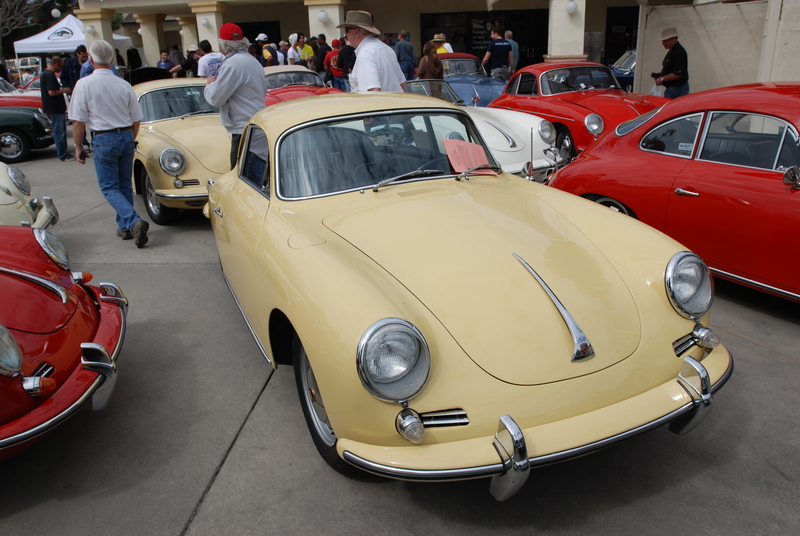 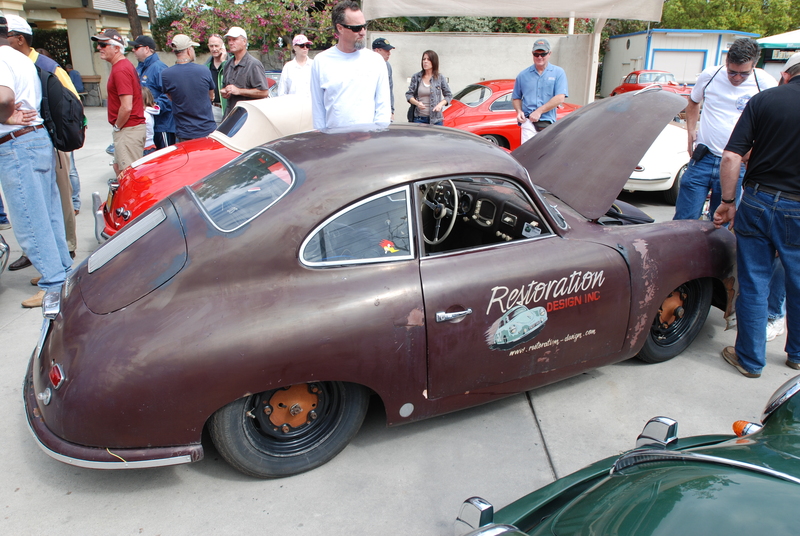 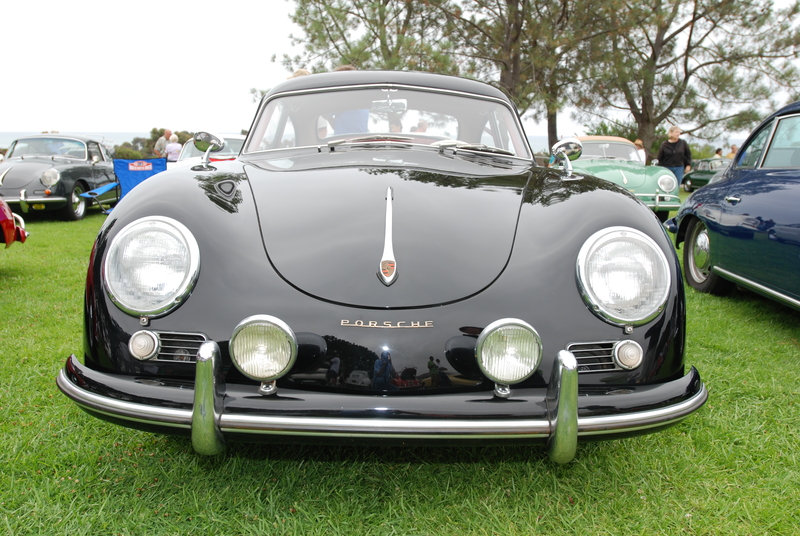 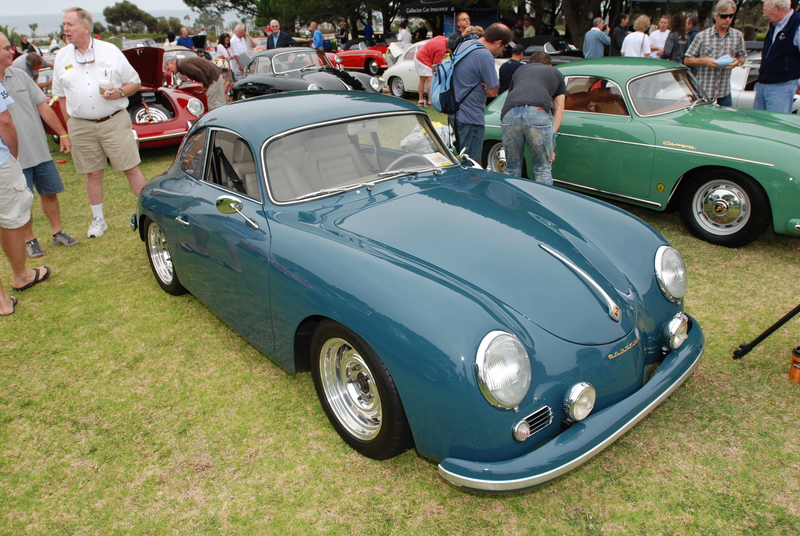 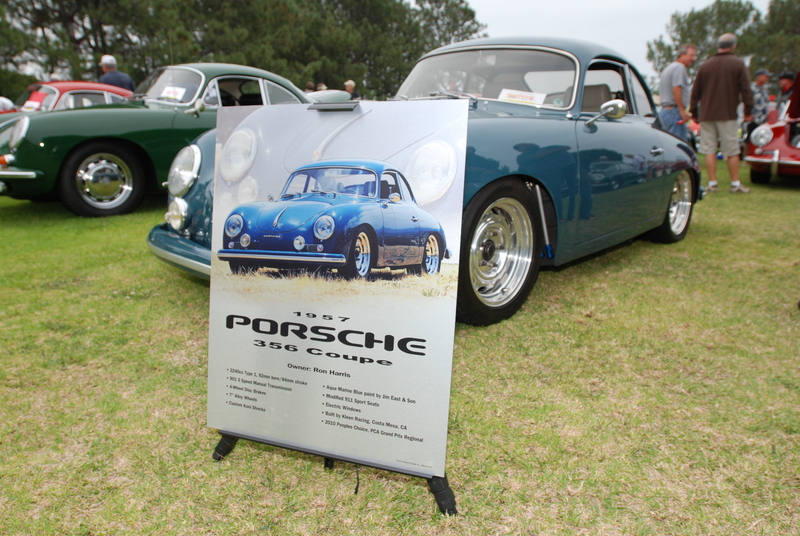 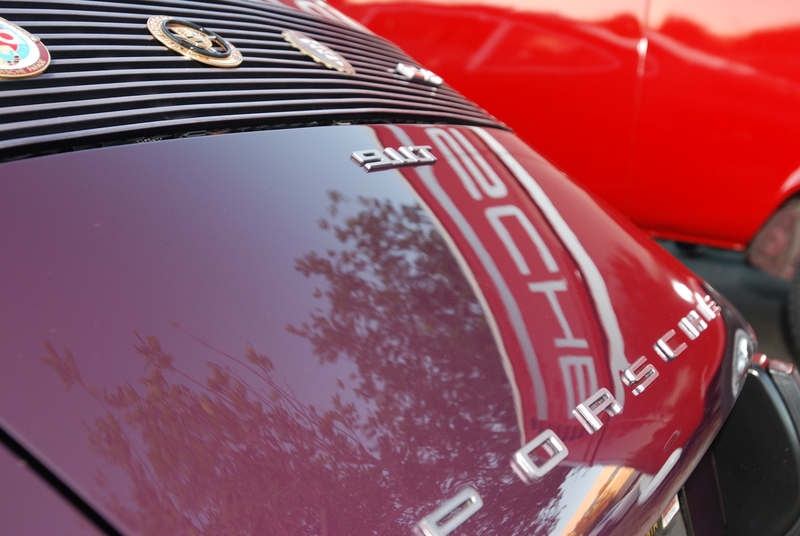 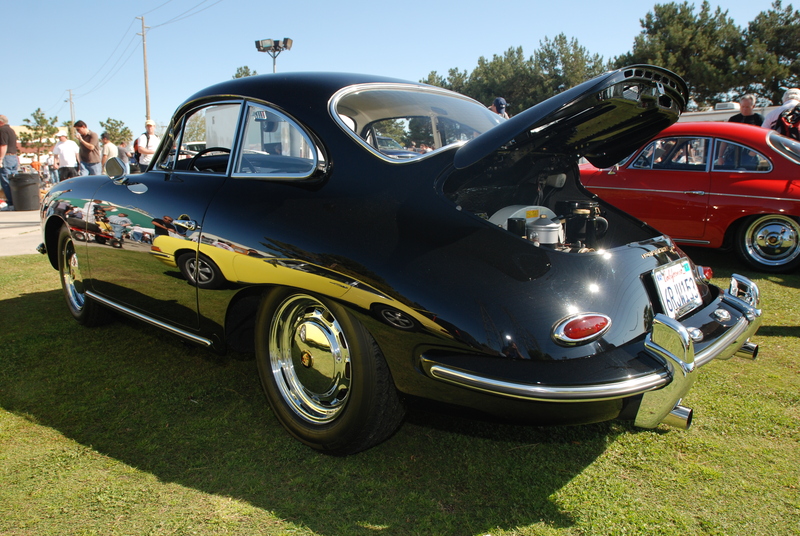 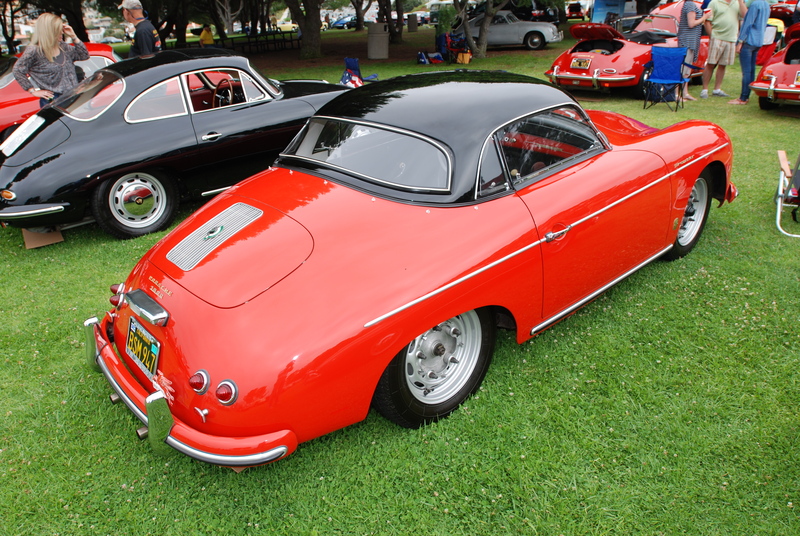 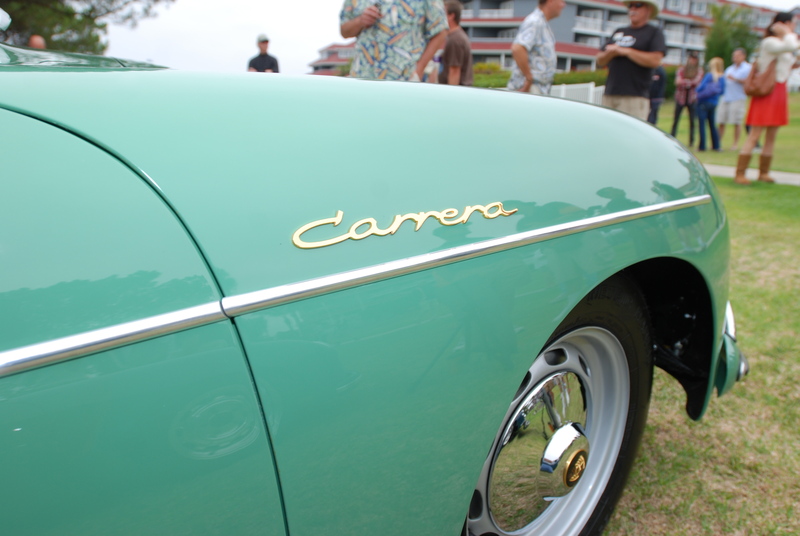 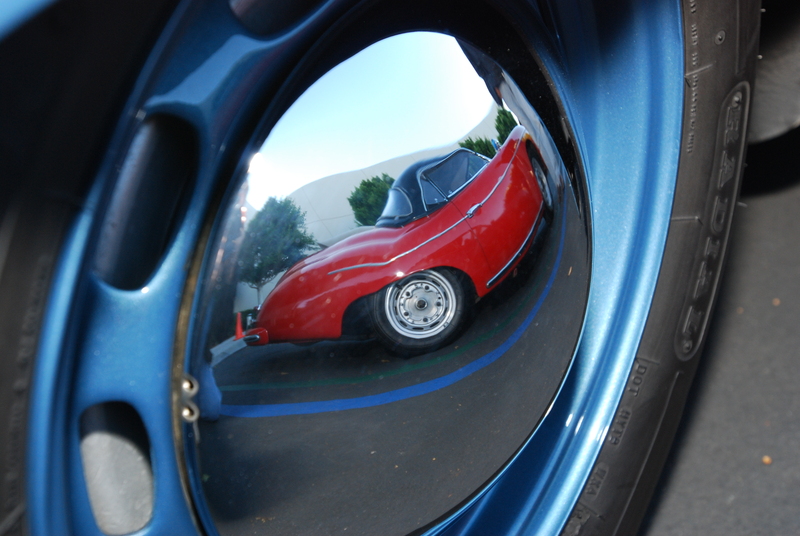 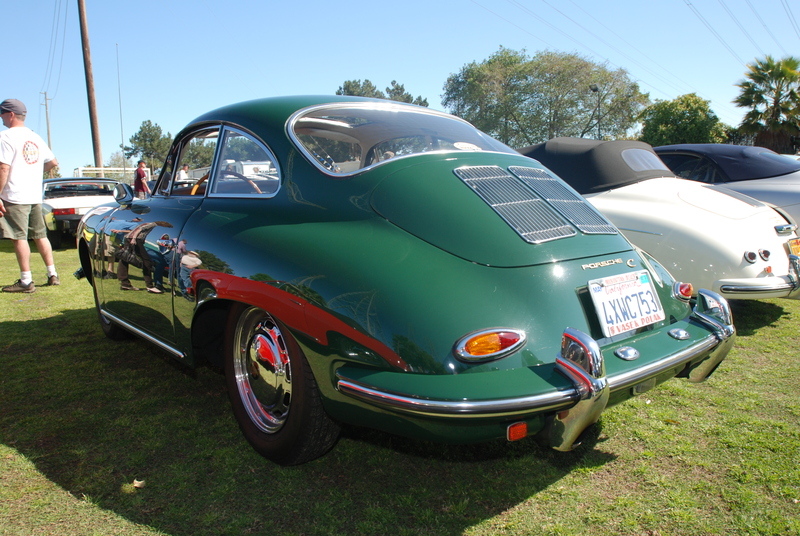 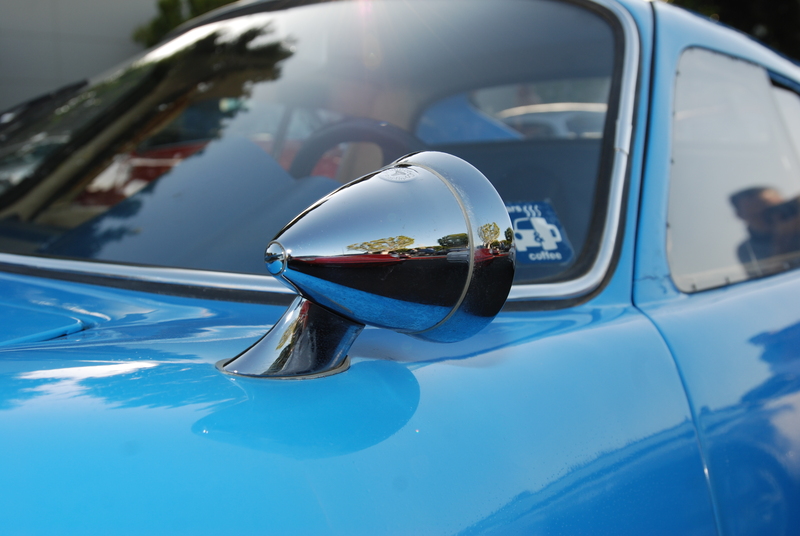 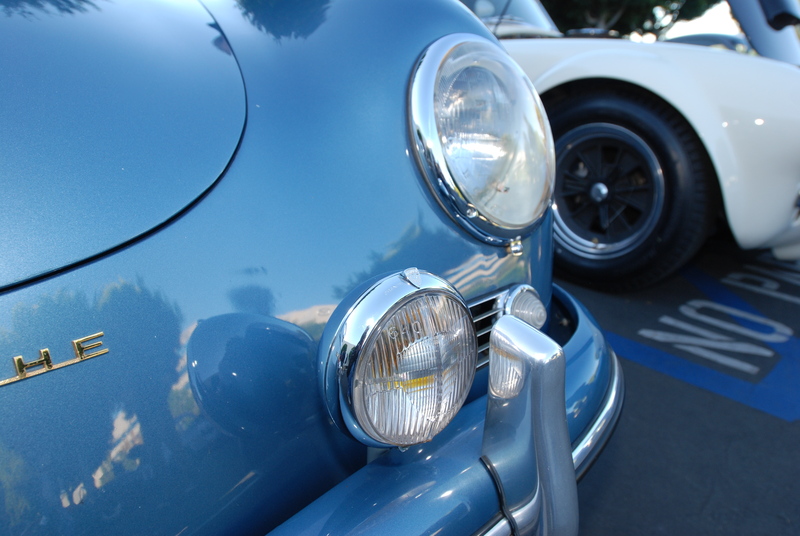 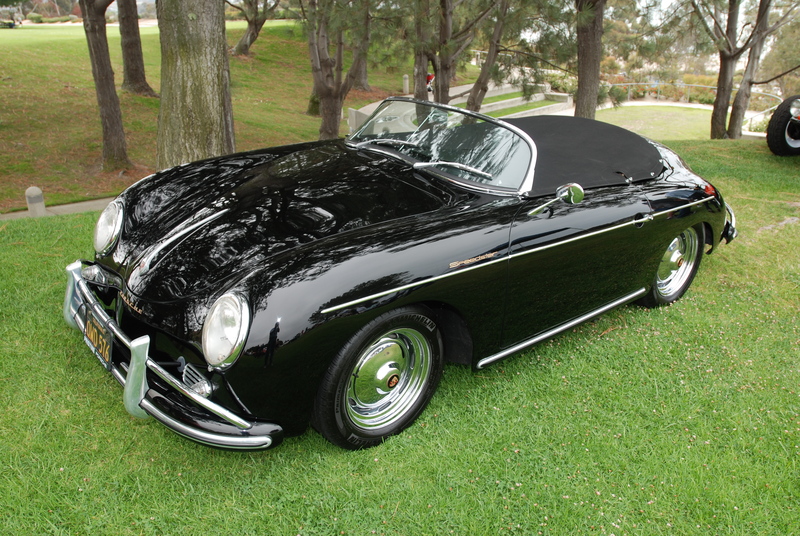 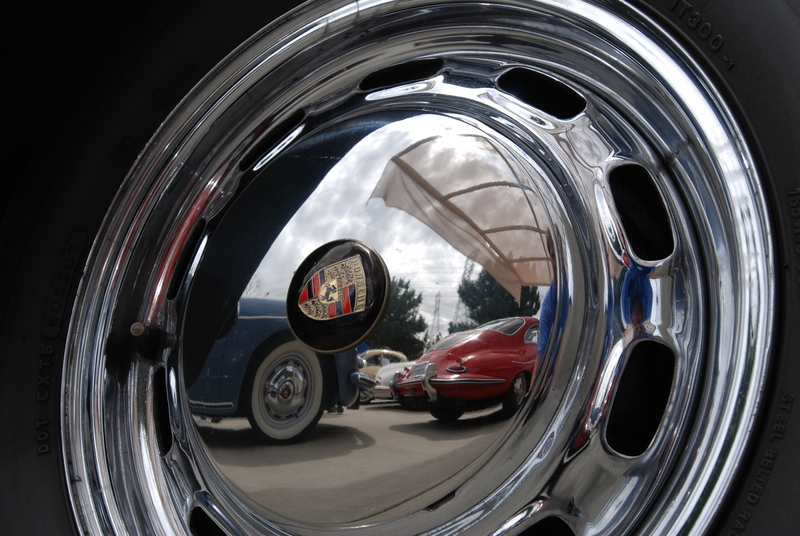 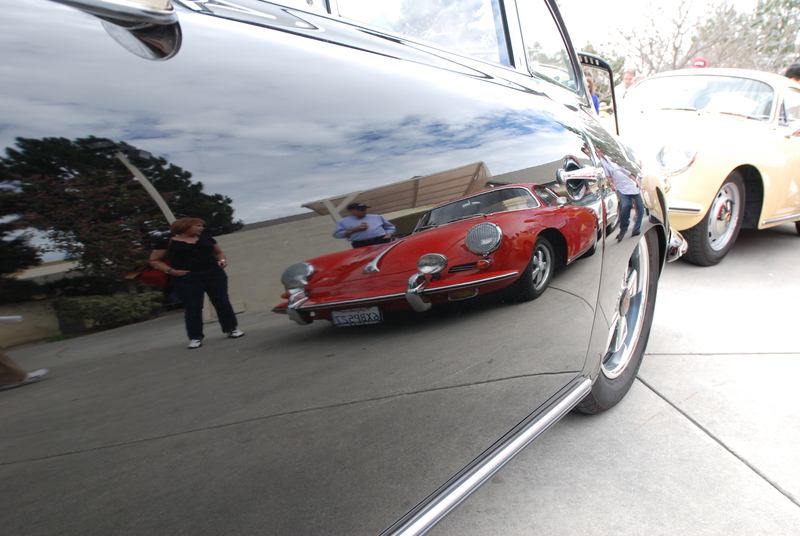 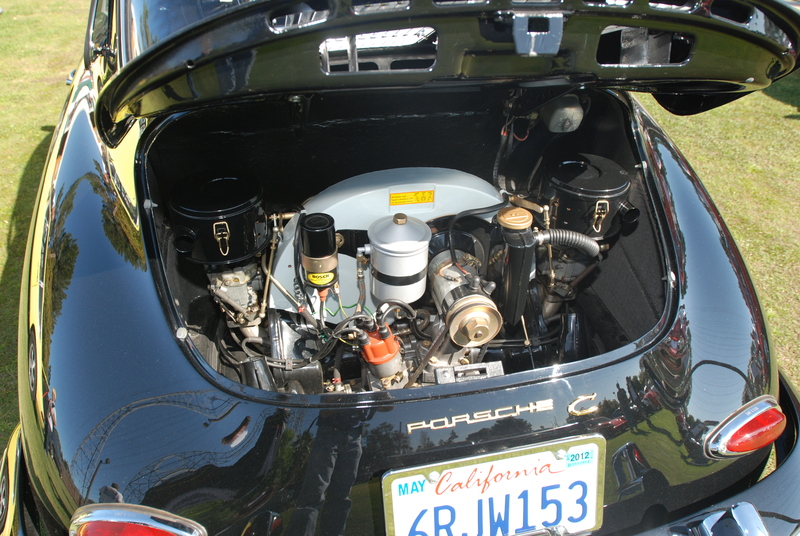 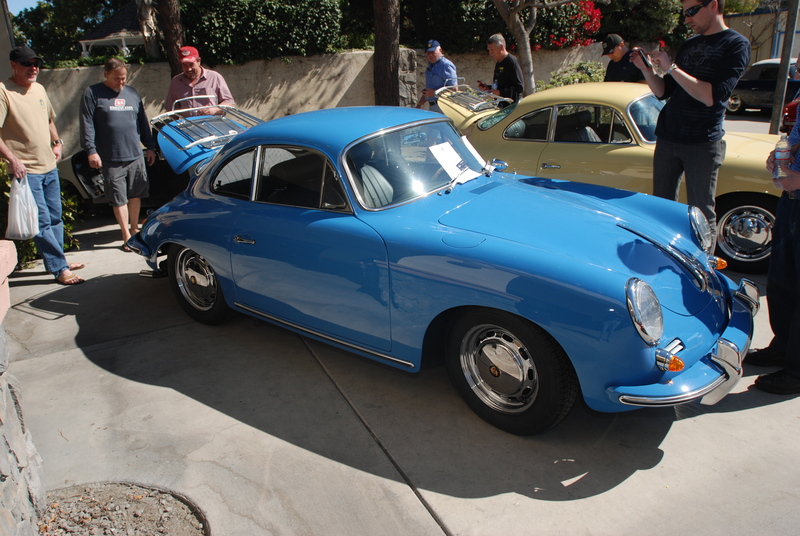 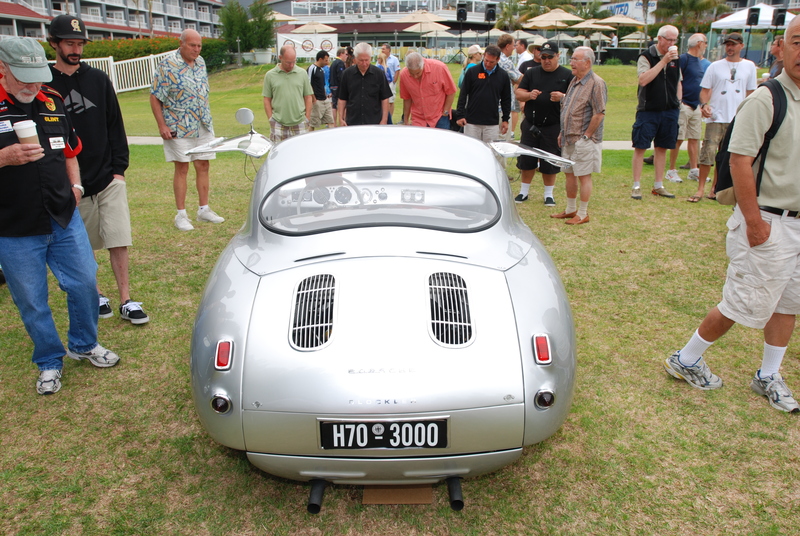 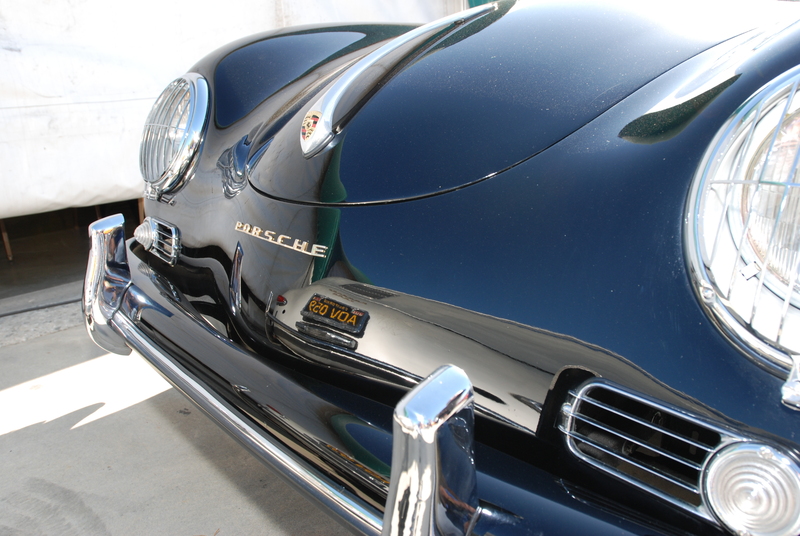 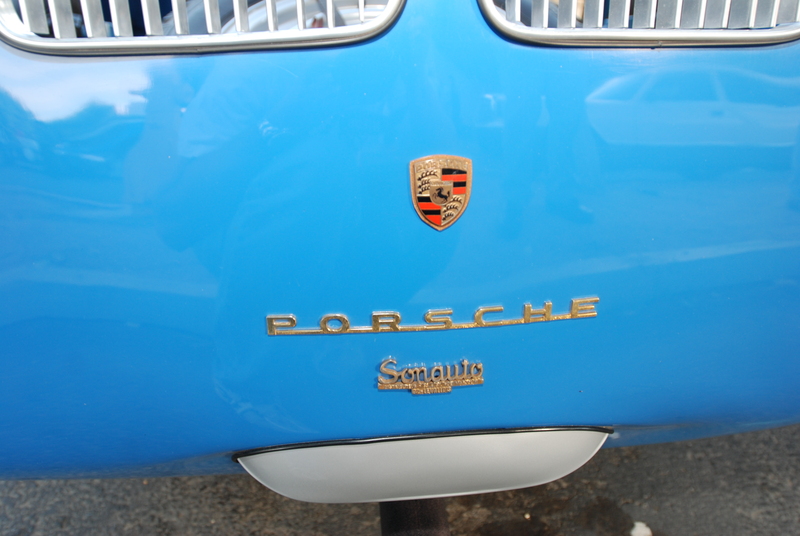 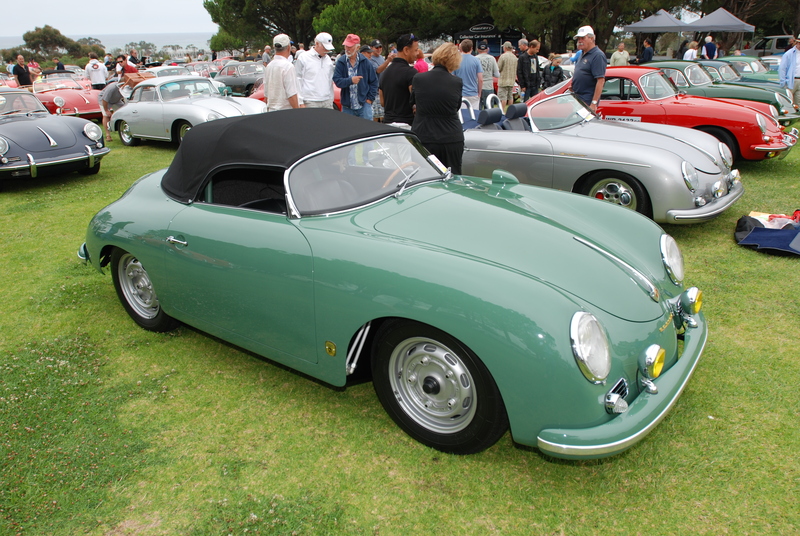 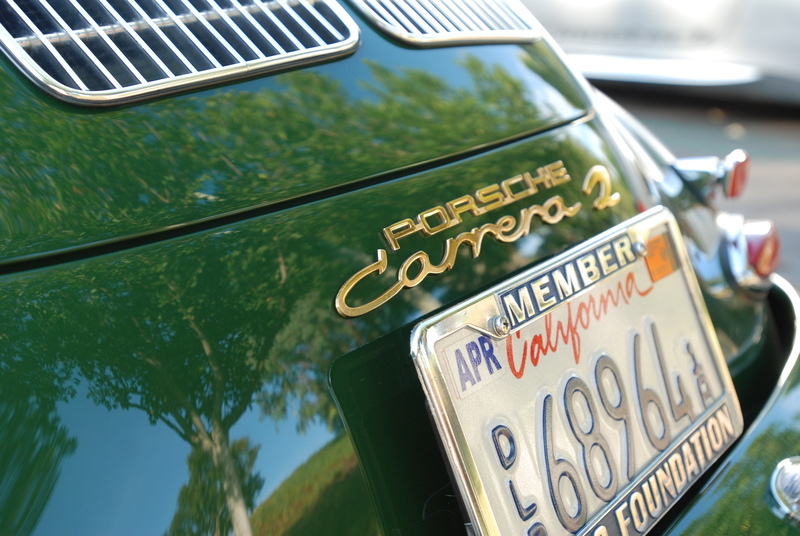 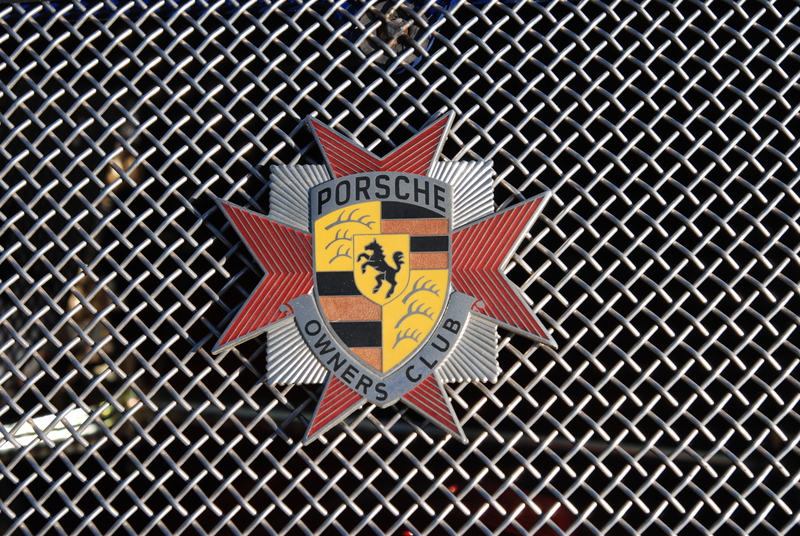 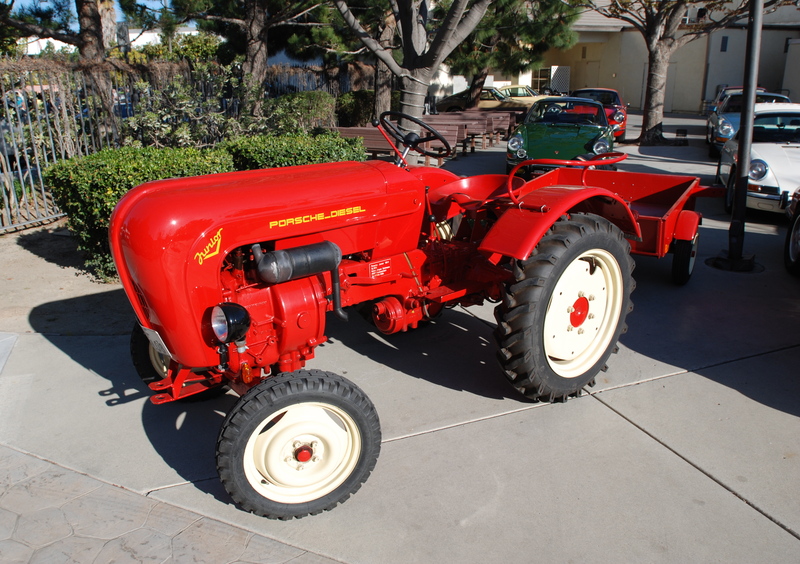 On Sunday March 3, 2013 the Porsche community once again rallied at the Phoenix Club in Anaheim, California, for the 356 Club of Southern California’s, 4th Annual All Porsche Swap and Car Display. 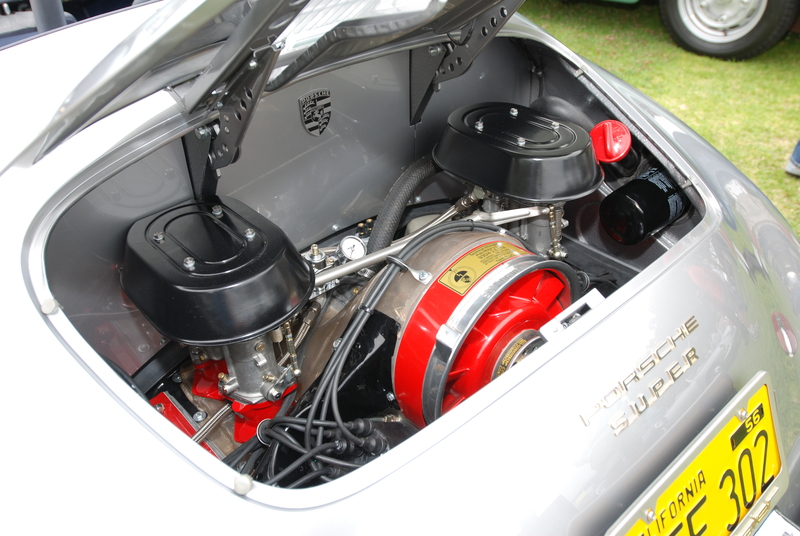 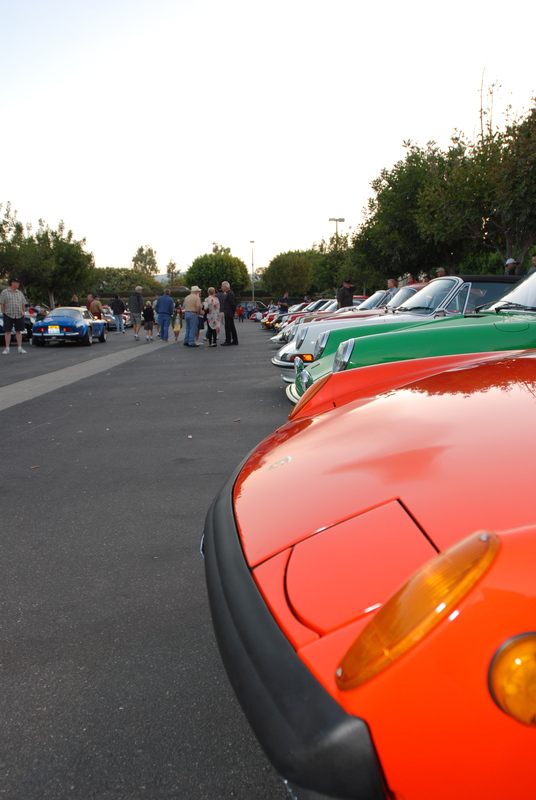 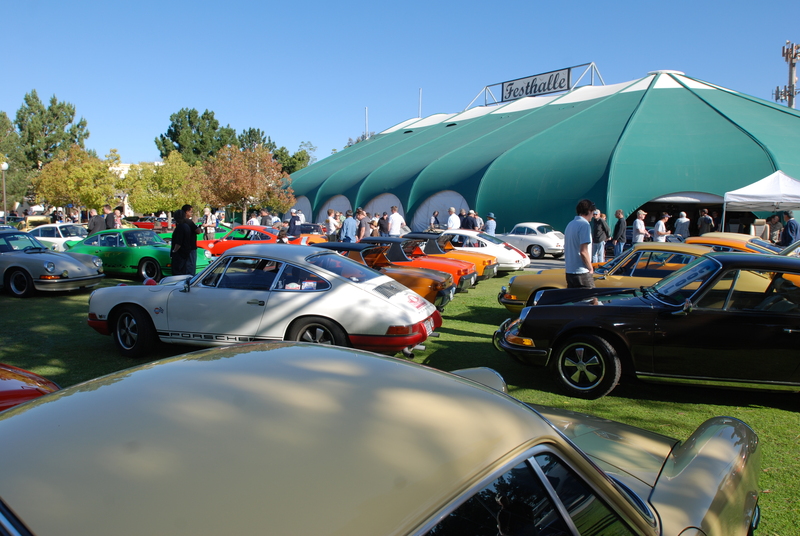 And what a turnout; with models ranging from the Porsche 356, 912, early 911’s, 914’s & 914/6, and 911 turbos. 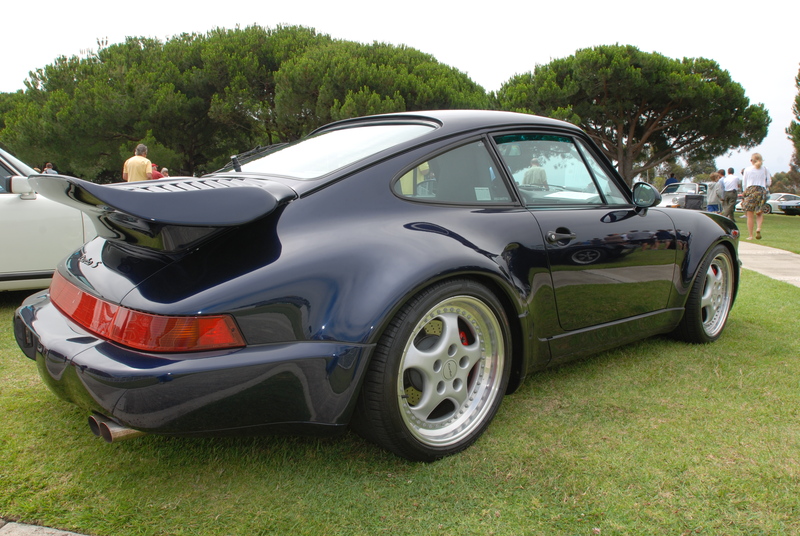 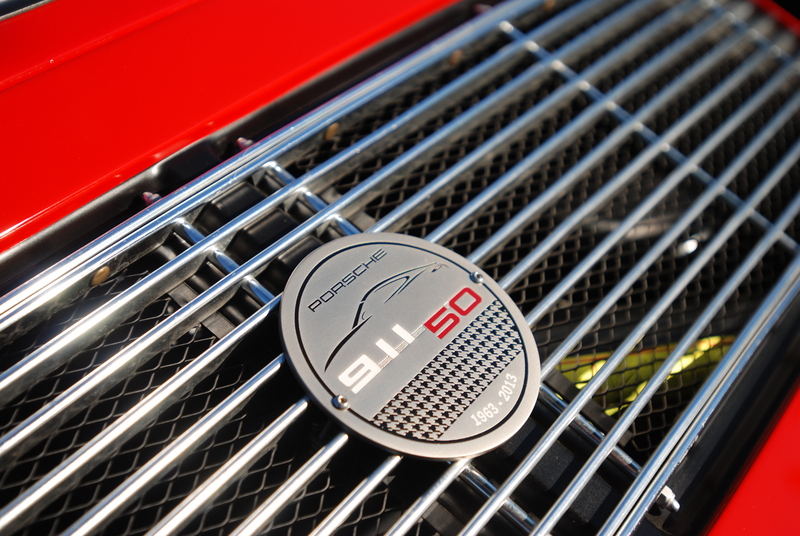 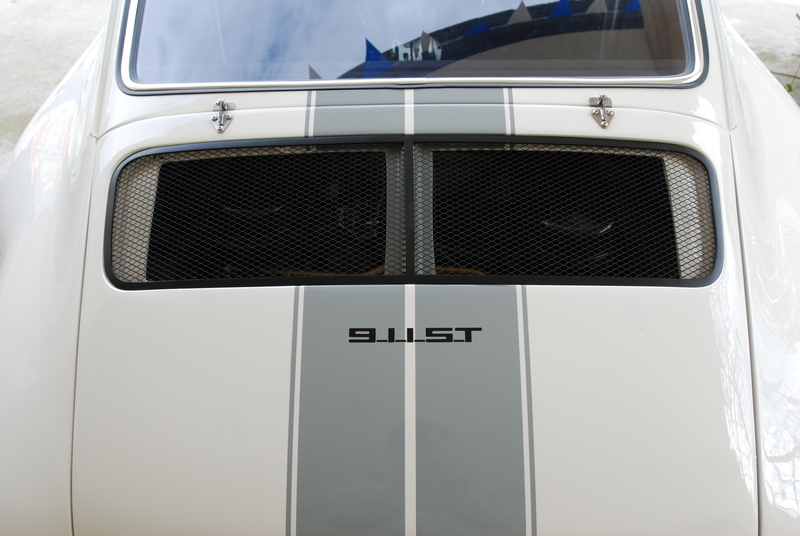 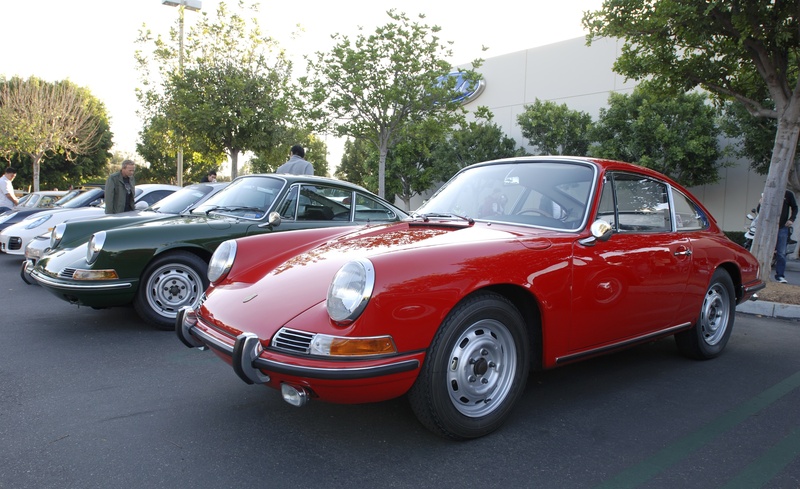 There was also the debut of a recently completed 911ST recreation, and the showcasing of a lone Porsche 904 GTS, and one brand new Red Porsche 991 Carrera S coupe. 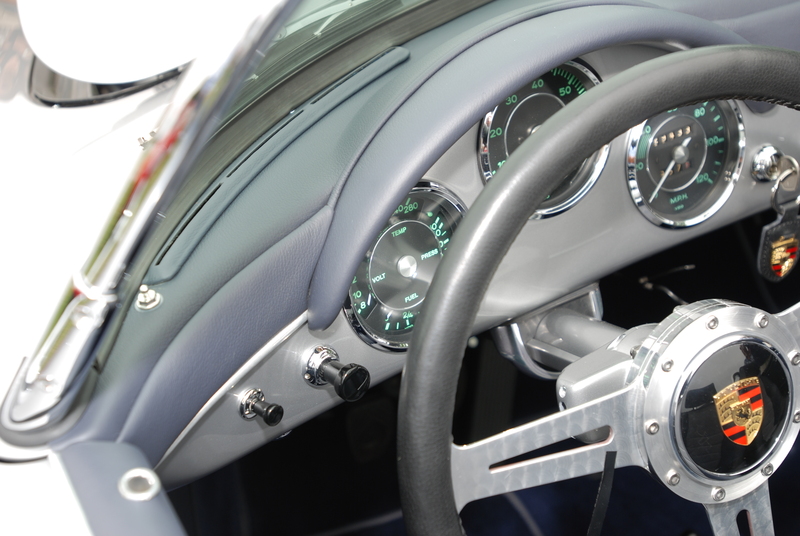 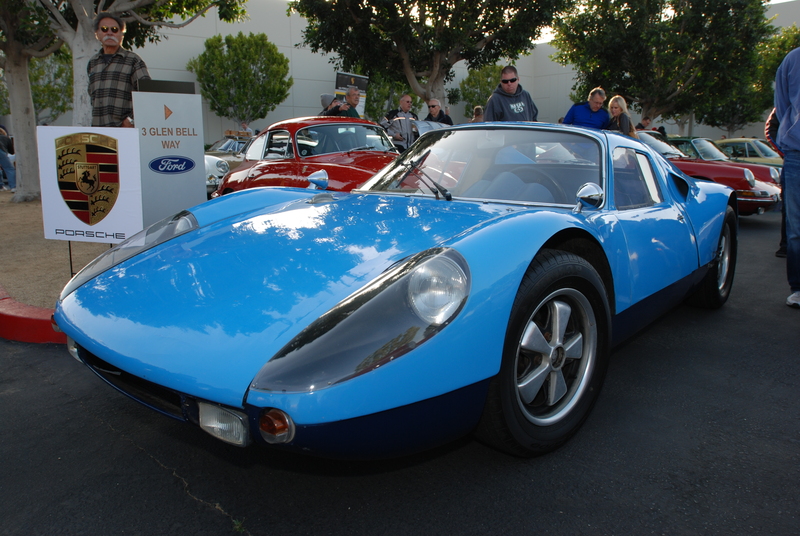 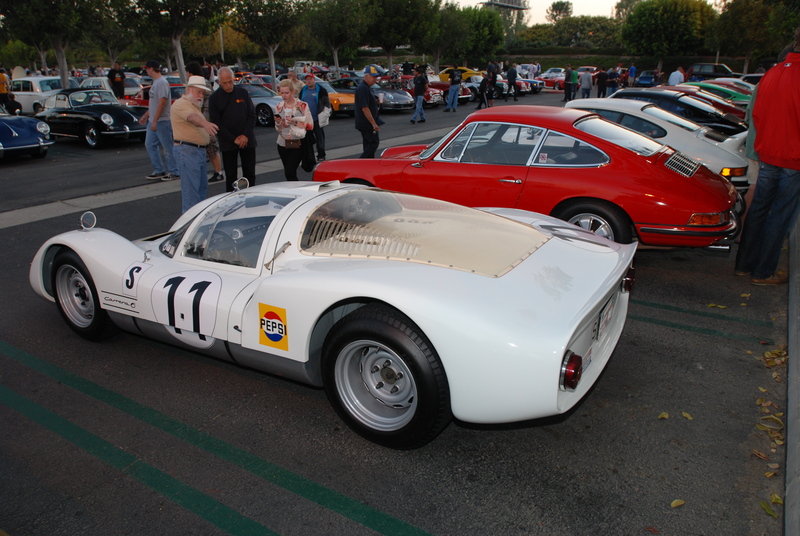 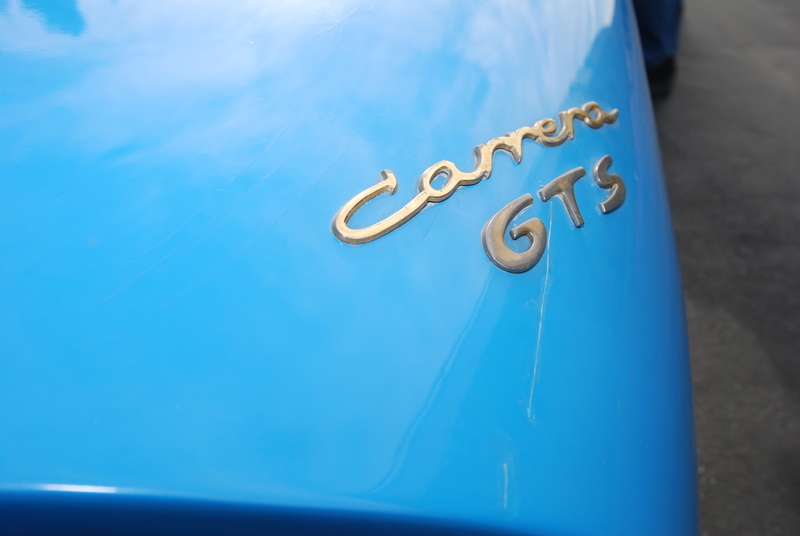 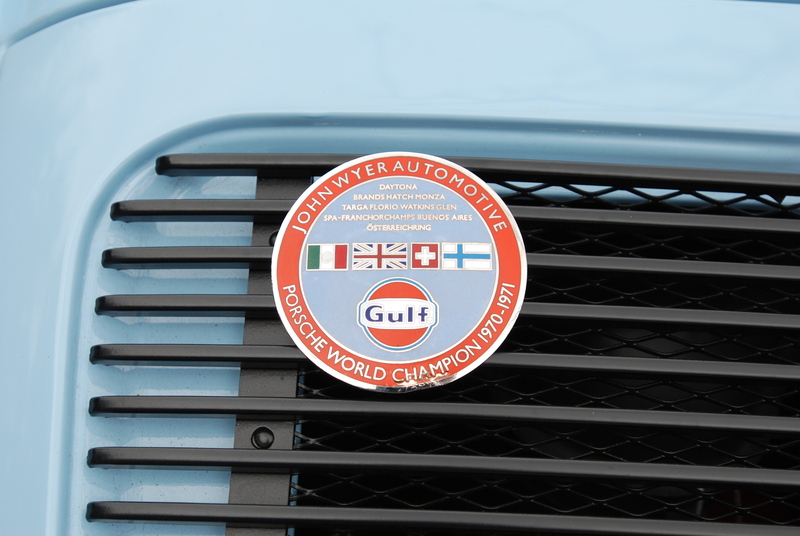 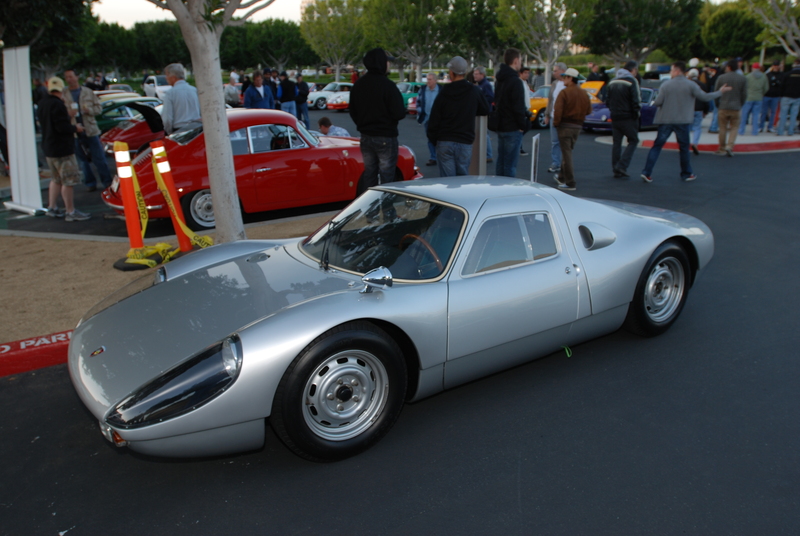 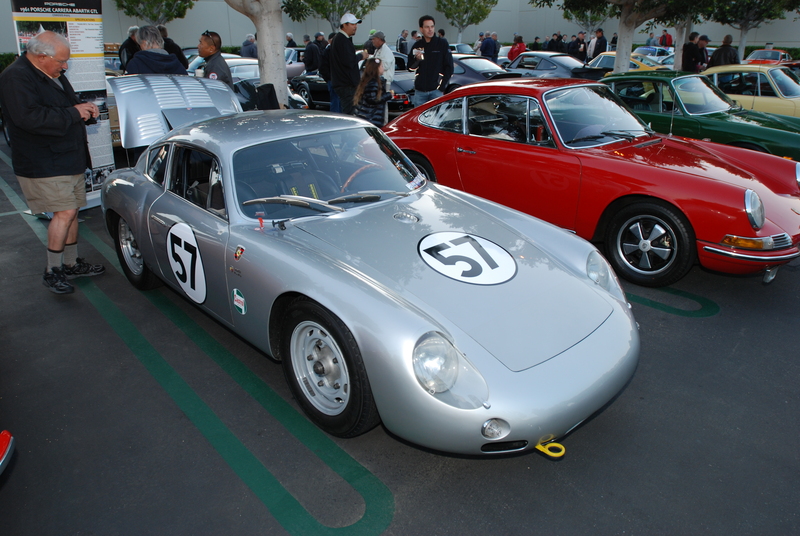 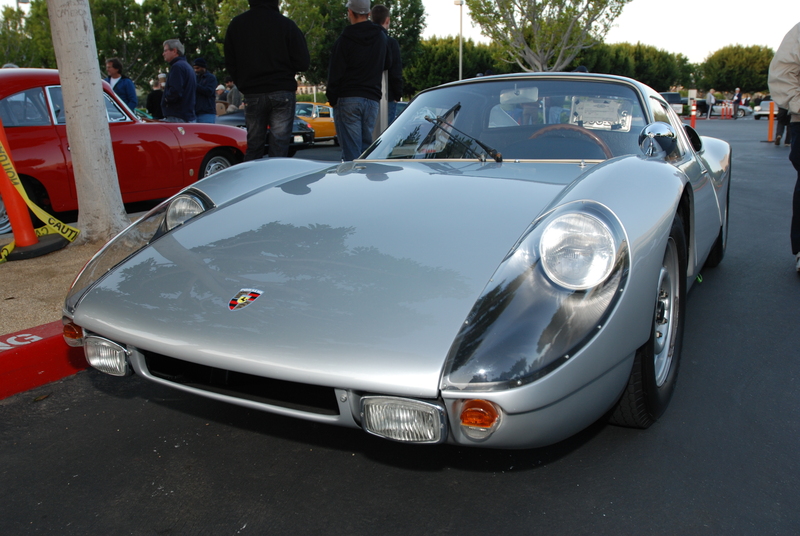 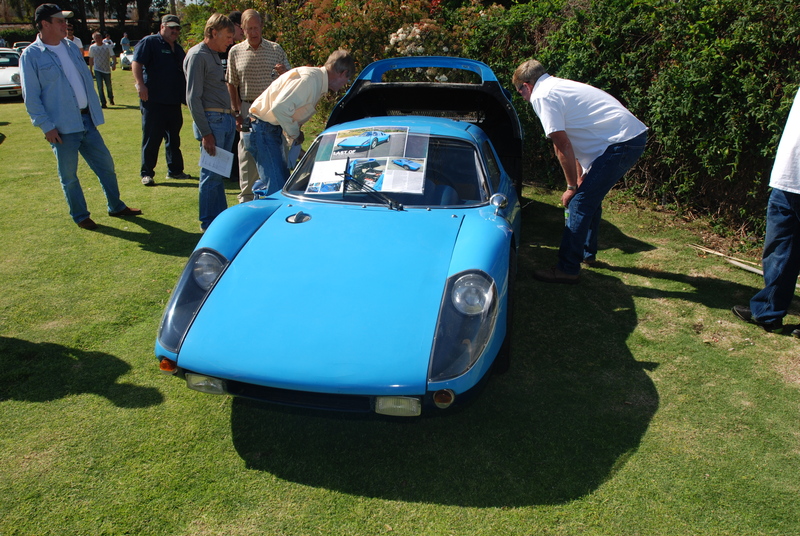 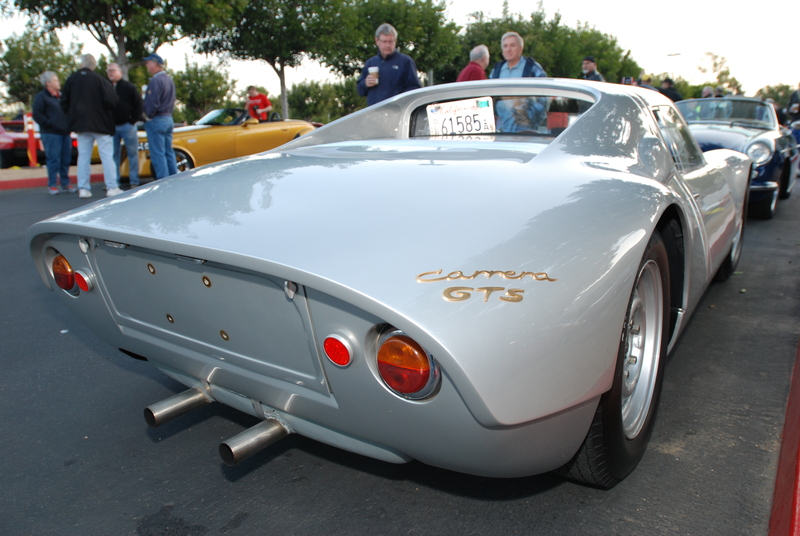 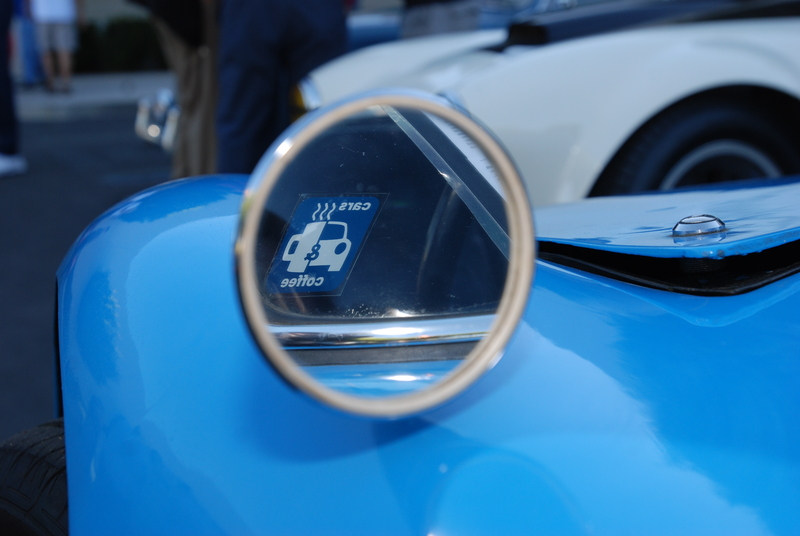 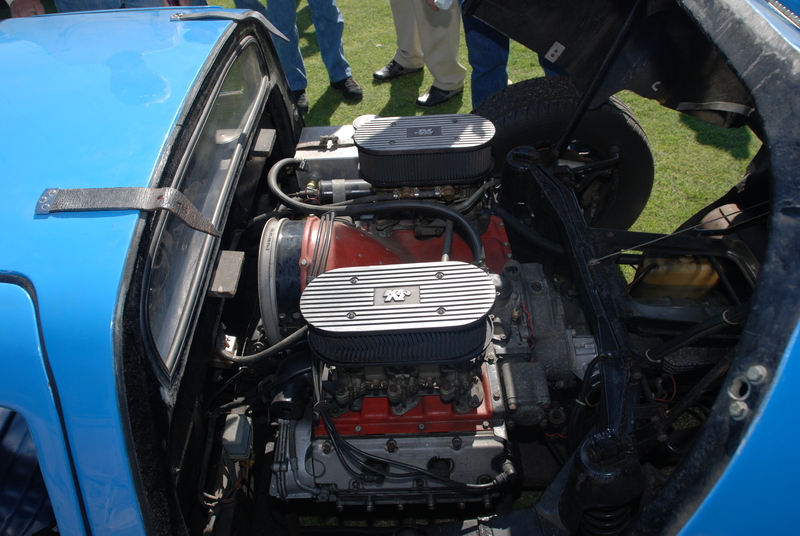 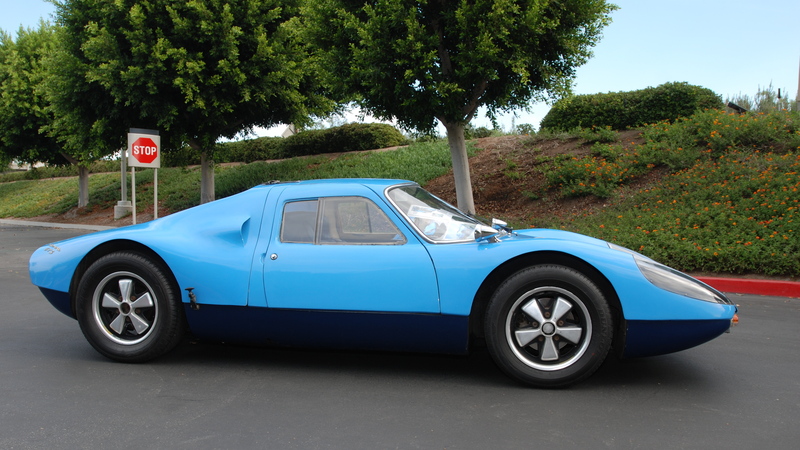 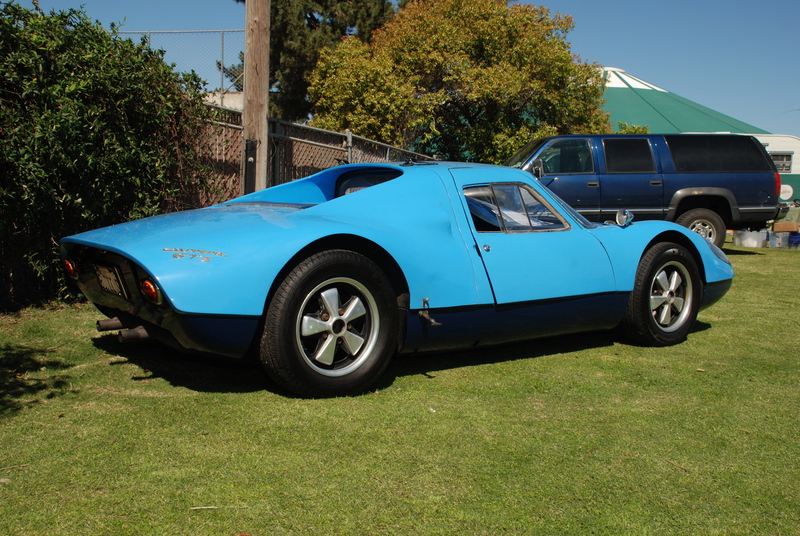 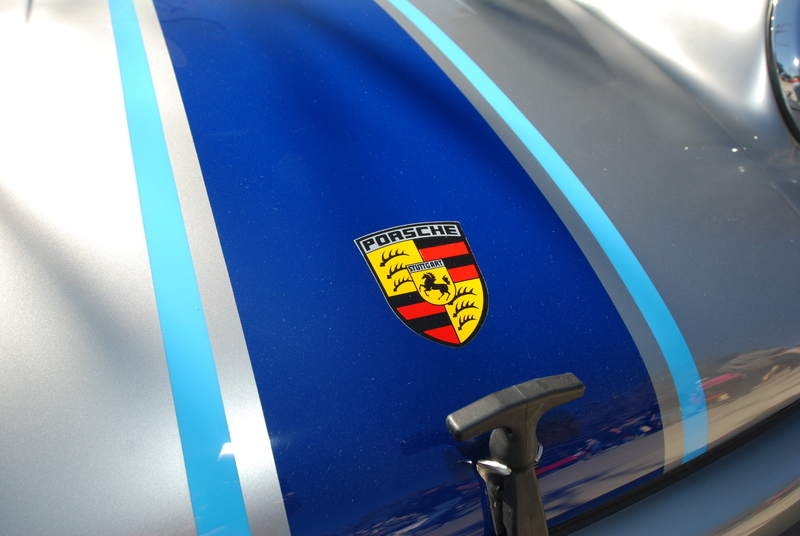 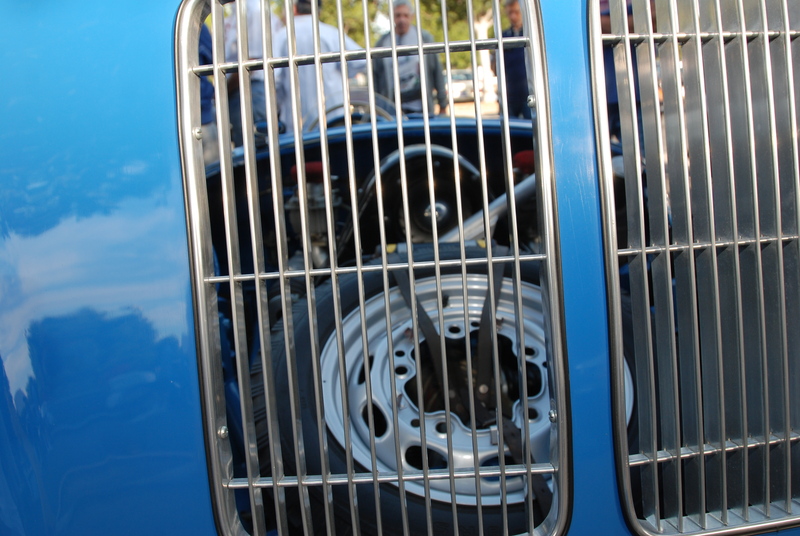 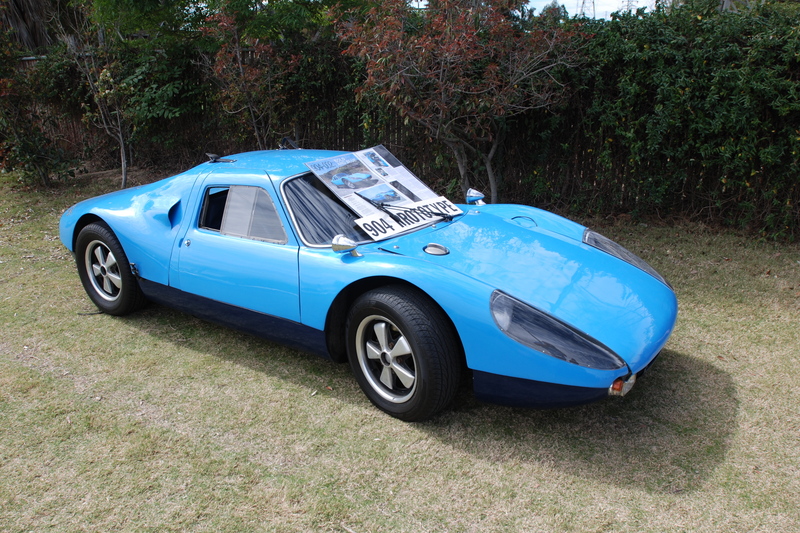 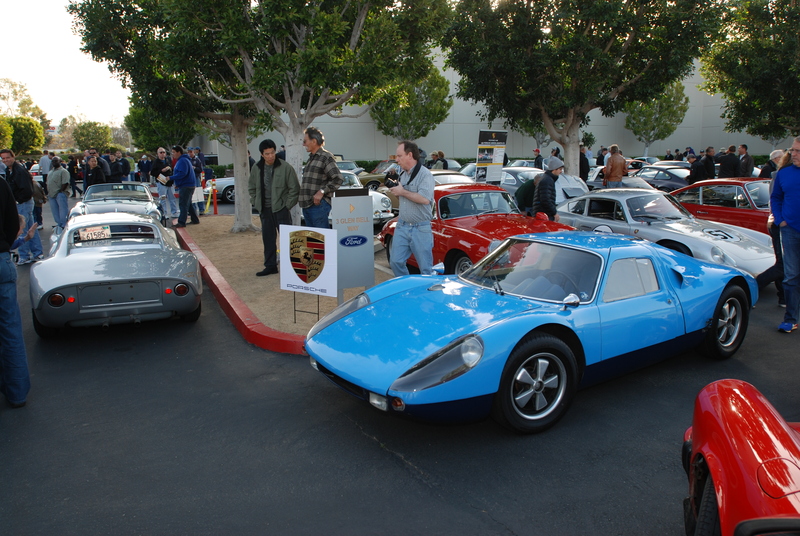 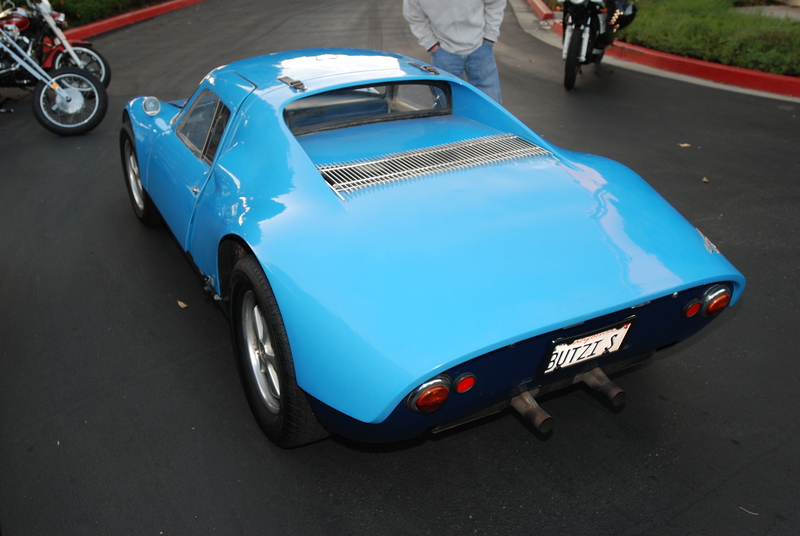 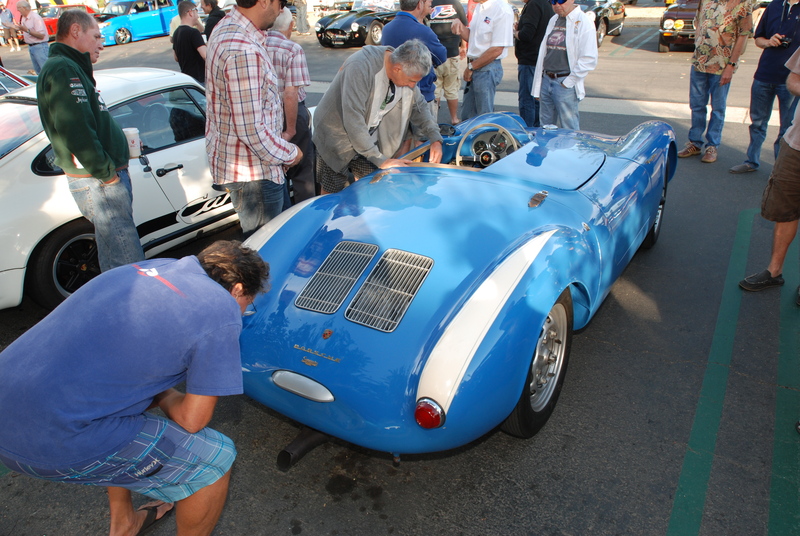 The sole Porsche 904 Carrera GTS in attendance; Butzi’s original blue 904-002 prototype below. 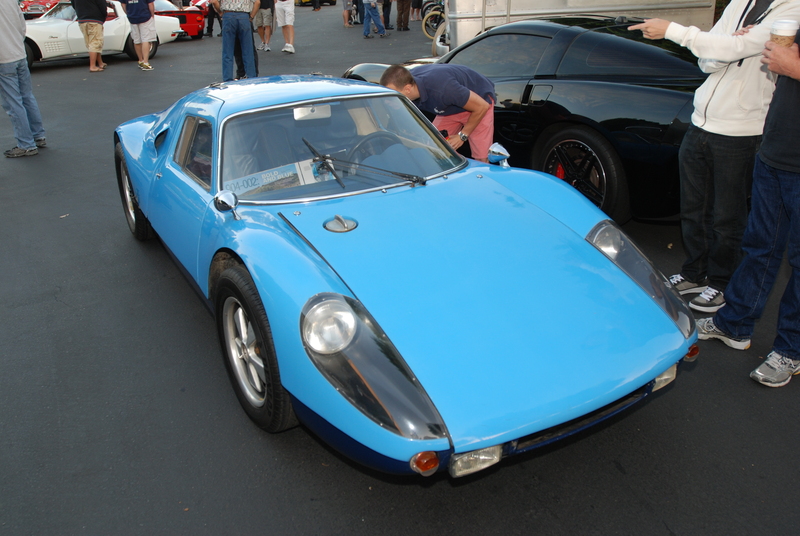 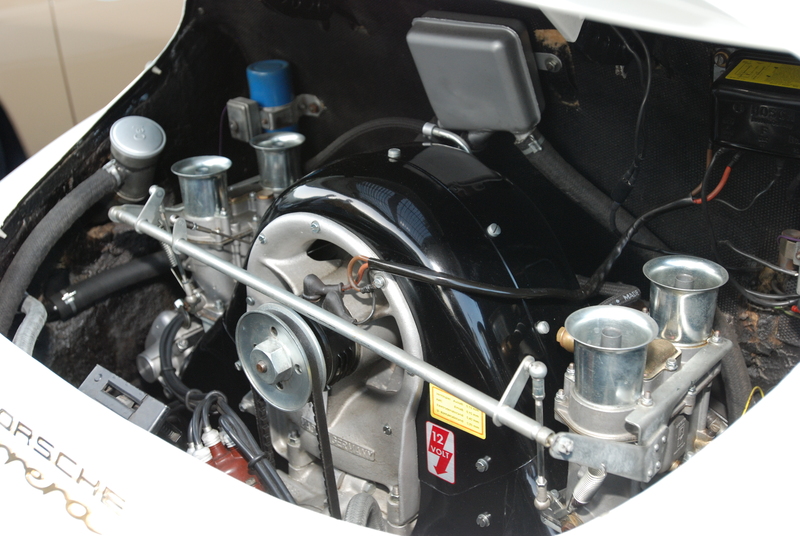 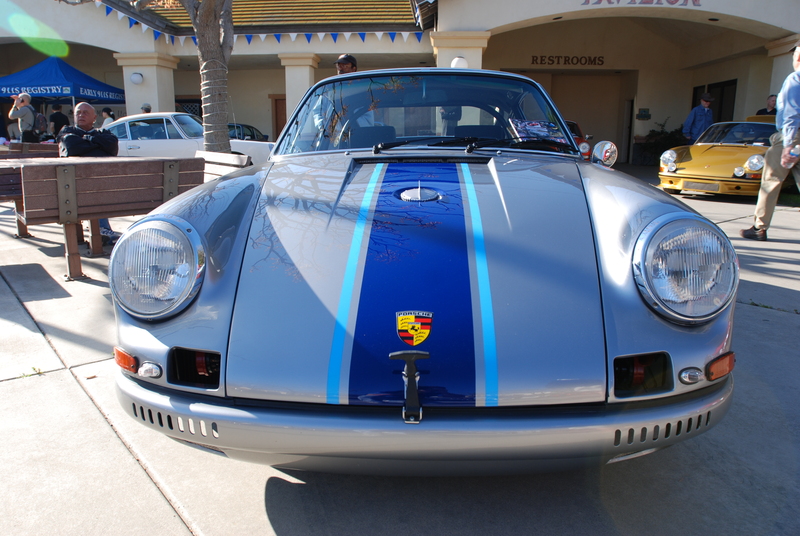 (For additional images of this 904, please refer to this link to one of my previous posts). 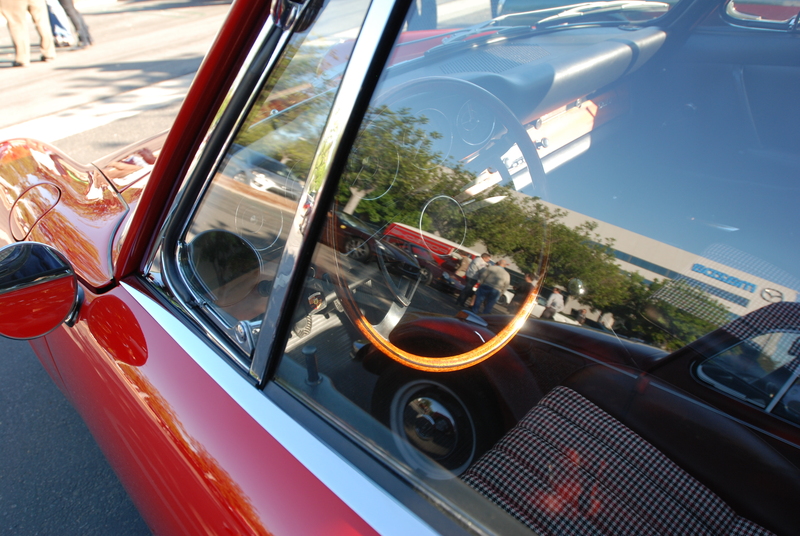 In sharp contrast to last weeks cool, gray and wet Saturday morning, this past Saturday morning dawned clear and crisp. 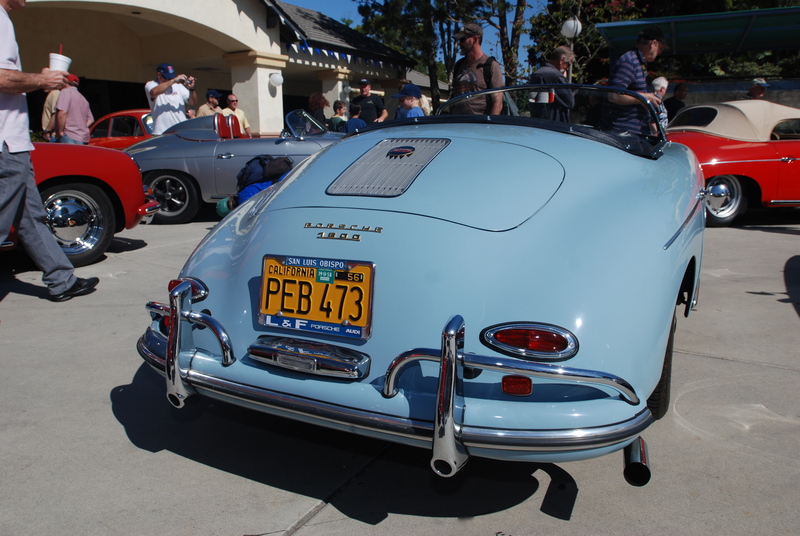 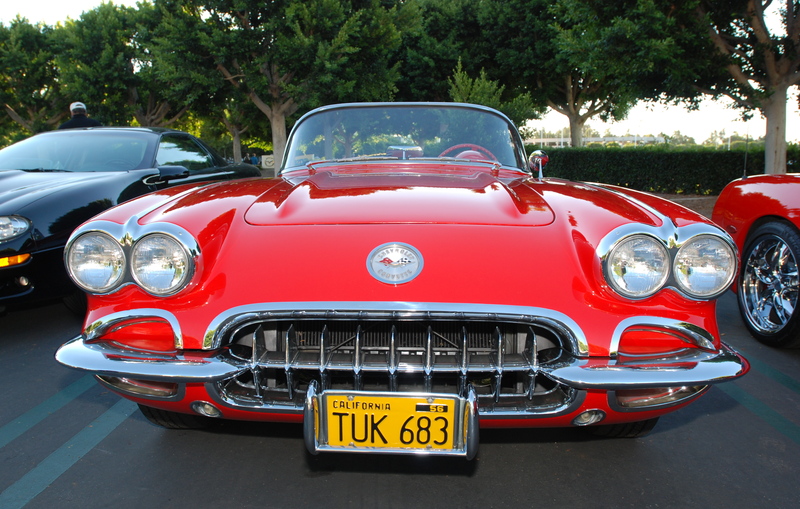 And with the improvement in the weather came an abundance of amazing cars. 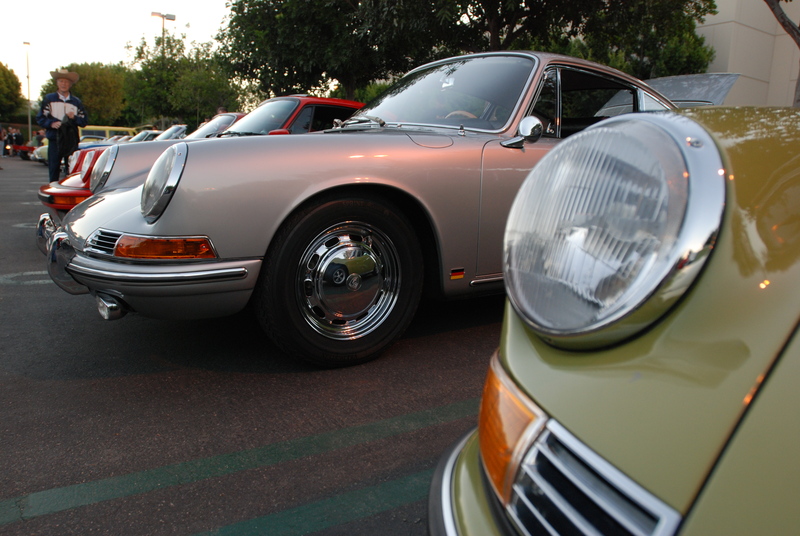 Driving through Porsche row I was greeted by a diverse collection of models already assembled and in place. 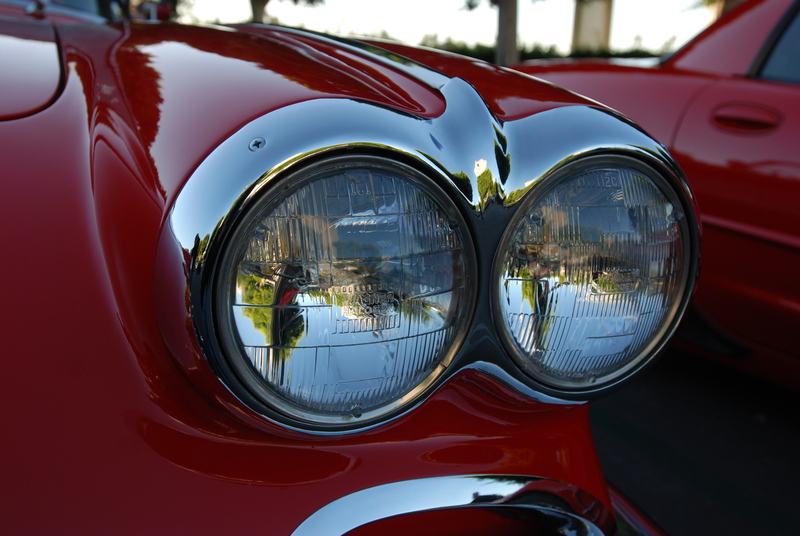 As my headlights swept over the cars, I caught a flash of color, graphics and a collection of driving lights to my right. 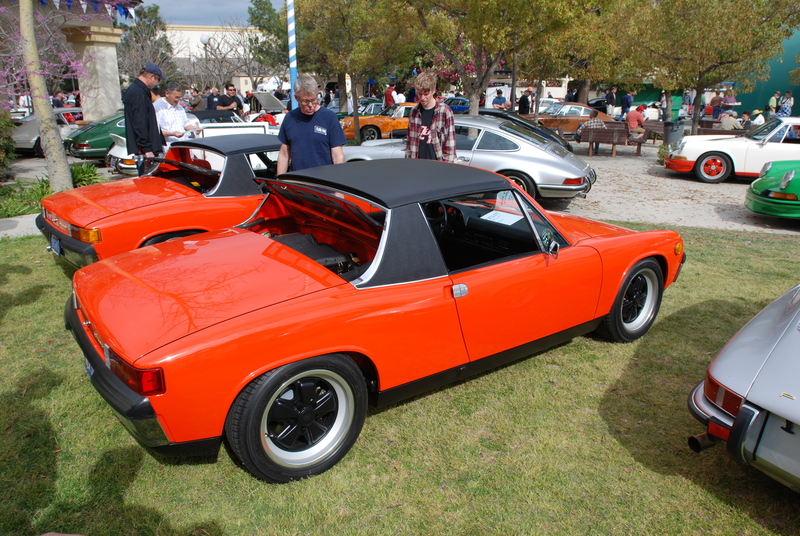 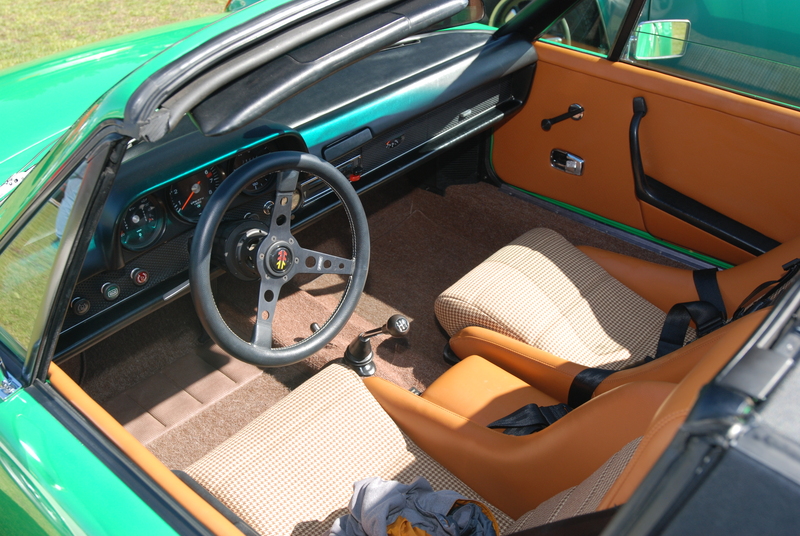 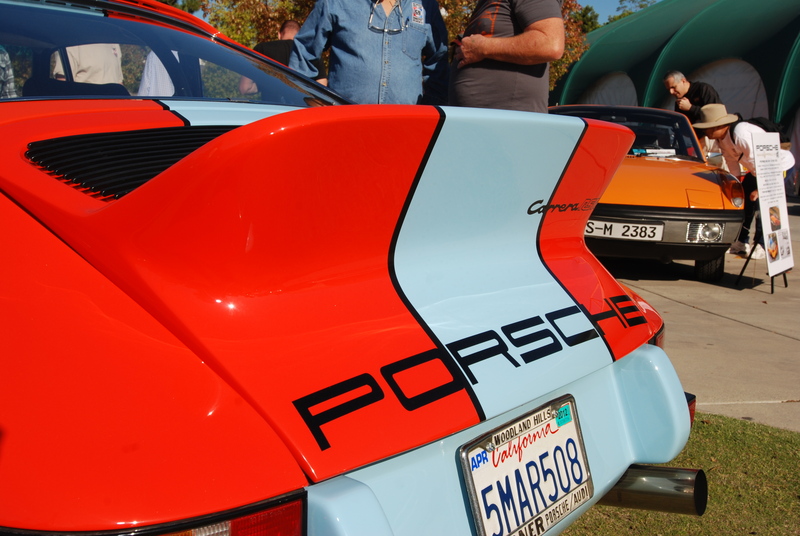 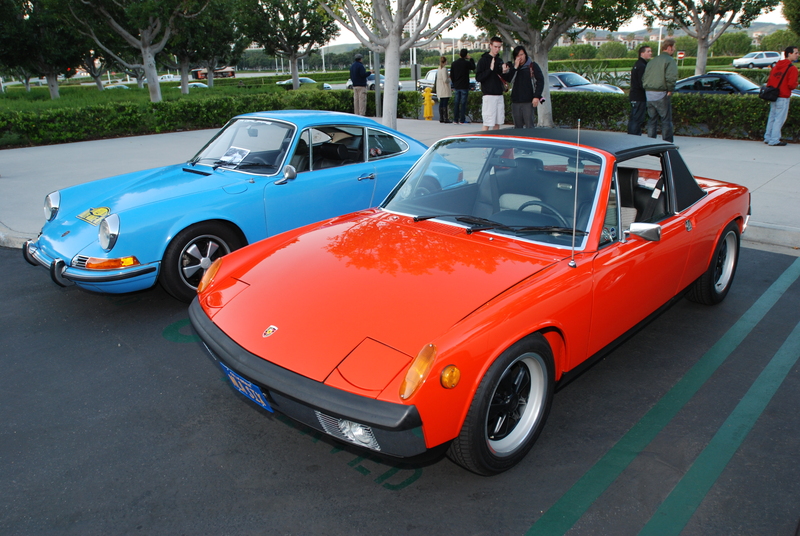 As I passed, I realized that parked side by side were a pair of Porsche 914-6; one a Tangerine colored street car, while the other in Signal Orange, was a purpose-built, Porsche Factory 914-6 GT race car, complete with hood and bumper mounted driving lights, Motorsports inspired graphics, and an ultra – trick motor. 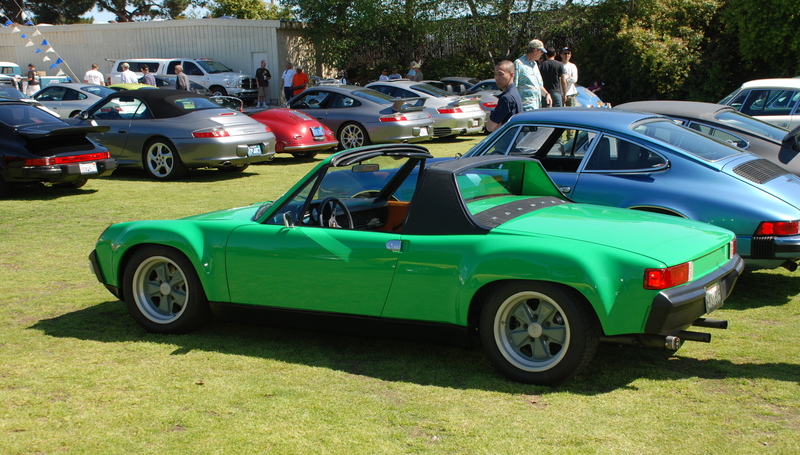 After parking and quickly consuming my breakfast, I grabbed my camera and headed to Porsche row to check out the pair of 914-6 I had seen earlier. 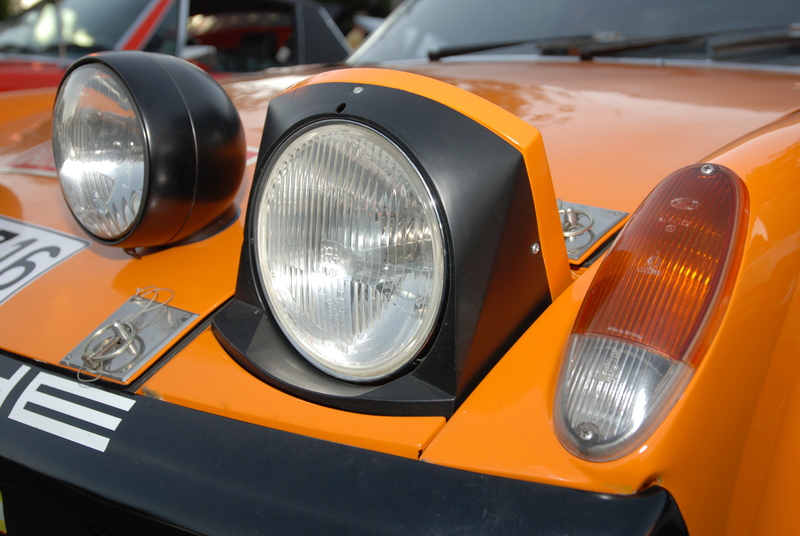 With the sun yet to reveal itself, and with one single pop of my camera flash, these car lit up like glowing embers in the darkness (as seen above). 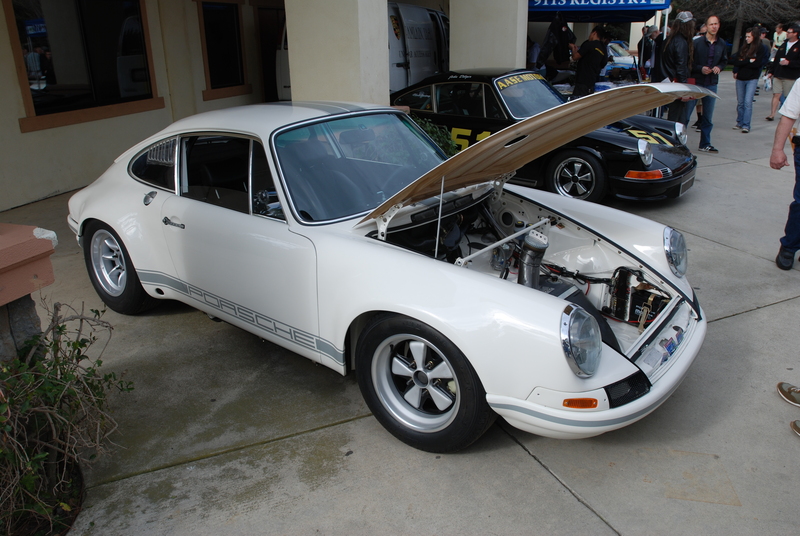 One of my friends happened to walk by while I was looking at this Porsche, and asked if I had seen the white, right hand drive, Shelby 427 Cobra parked over in the Featured lot. 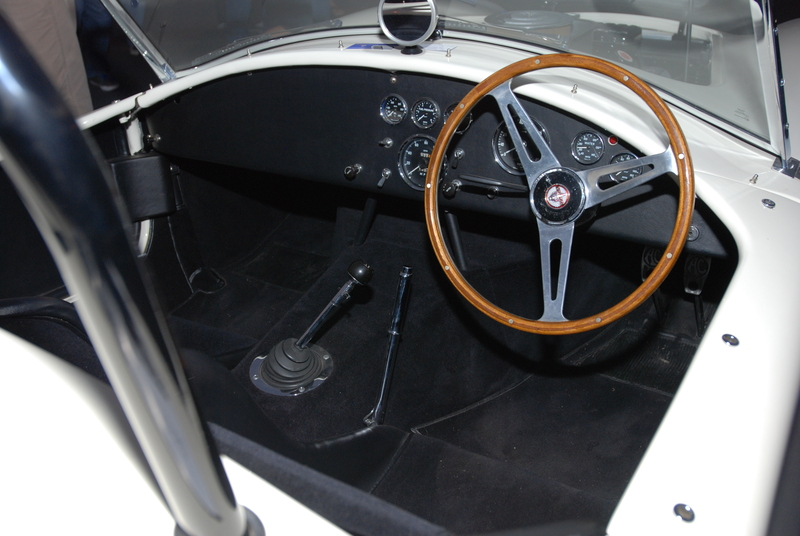 I replied that I had not, so off I went in search of the mystery Cobra, especially since I had never seen one configured for right hand drive. 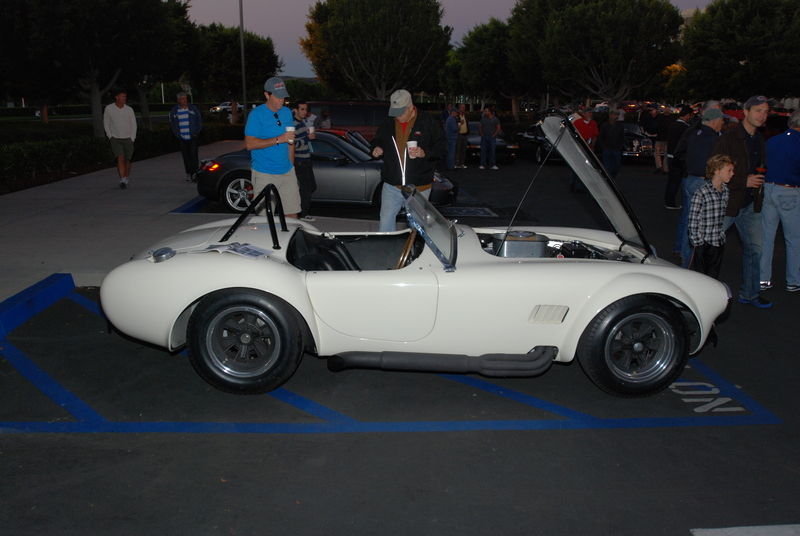 As I approached, I could make out a Wimbledon white car gathering a crowd, and sure enough, here was the Cobra. 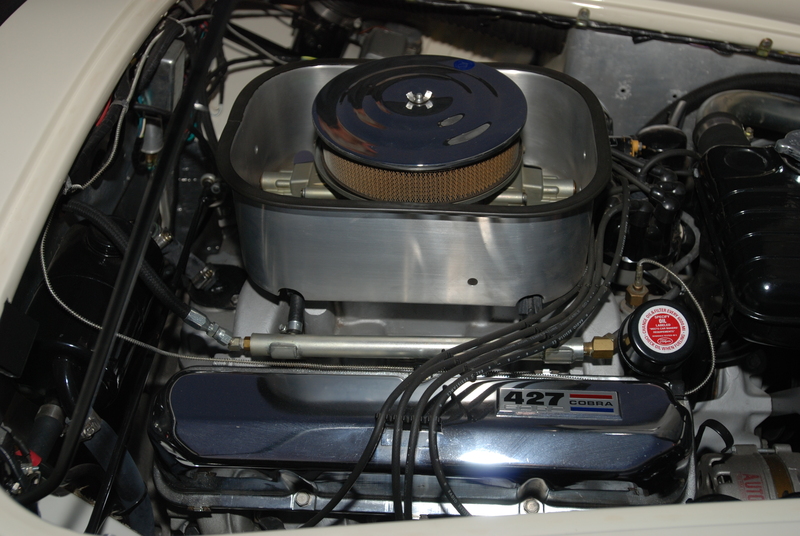 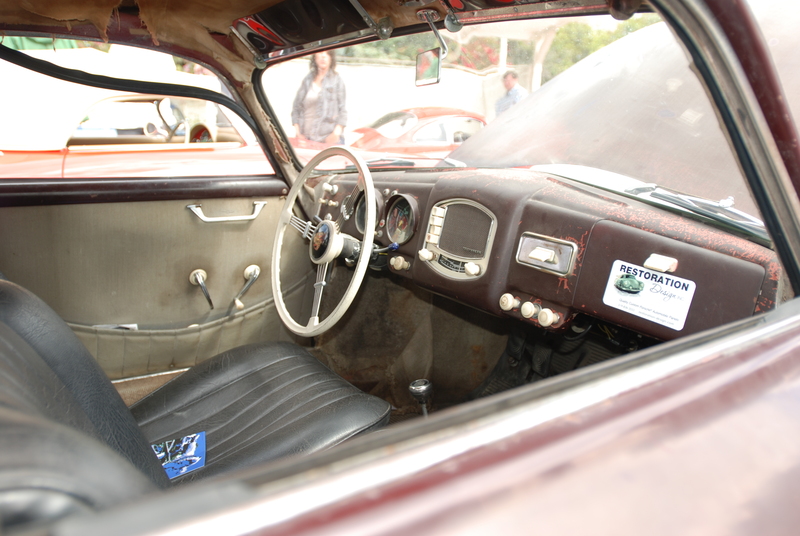 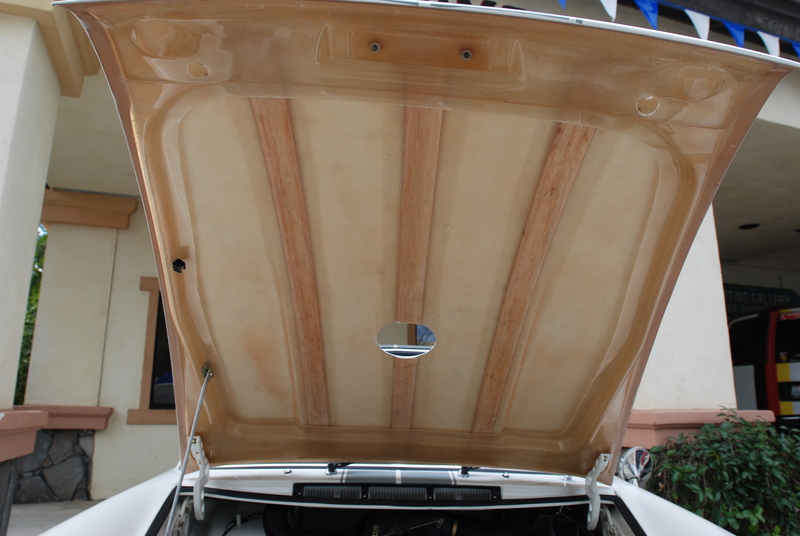 As I moved closer, the owner and his son opened up the cars gloss black hood, to reveal an immaculate, big block Ford 427. 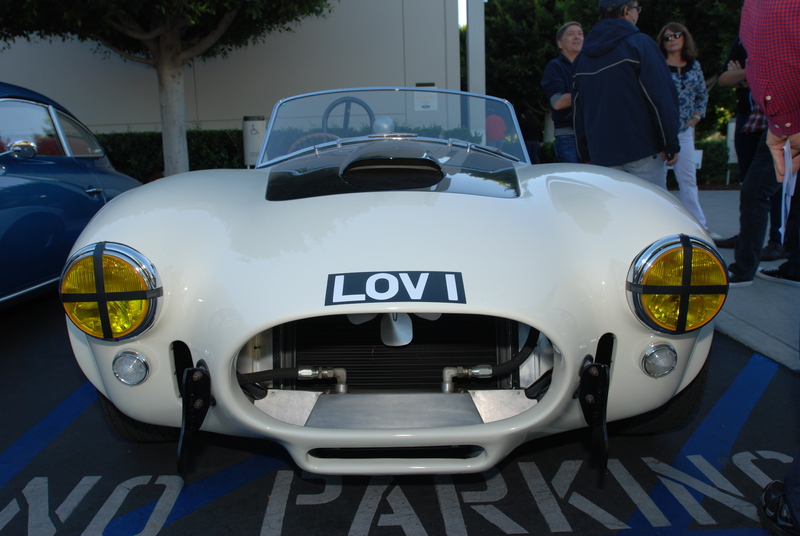 Obviously, with the car being configured for right hand drive, and based upon the graphic on the nose (LOV I), as well as the pair of amber-colored headlight lenses, my assumption was that this must be an English model. 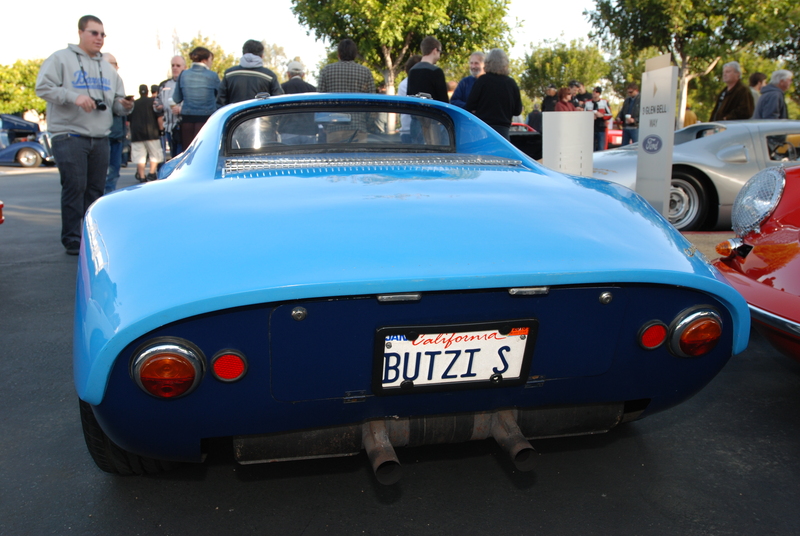 This seemed like a correct assumption, given that the nose graphic seen on this car is the English equivalent of a U.S. license plate. 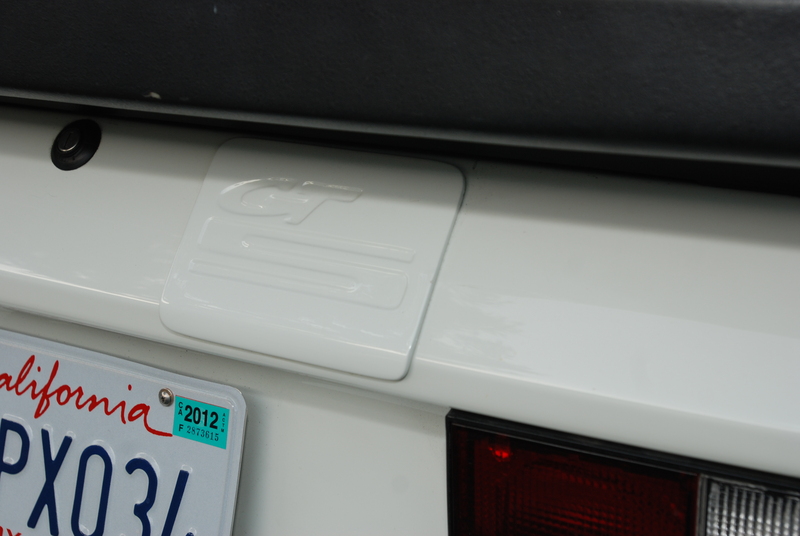 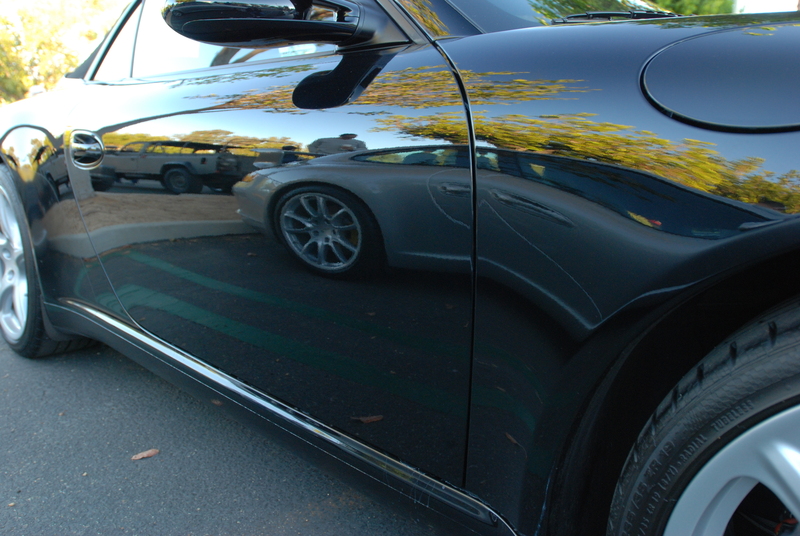 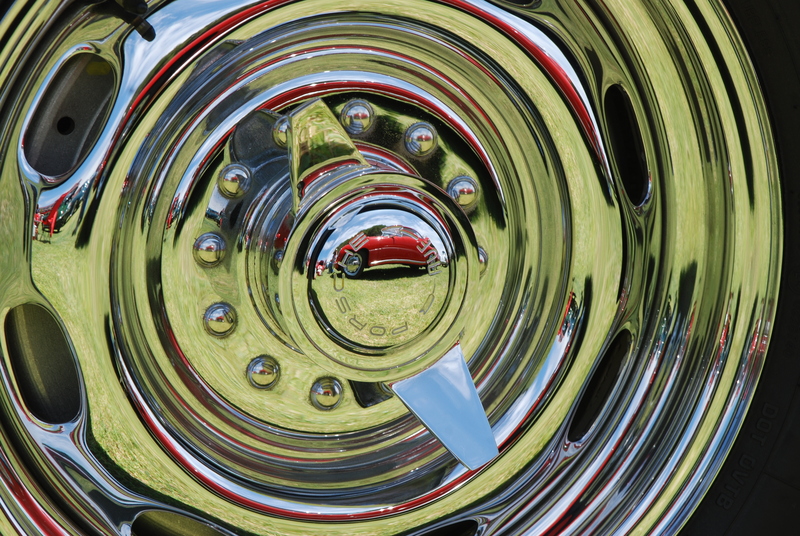 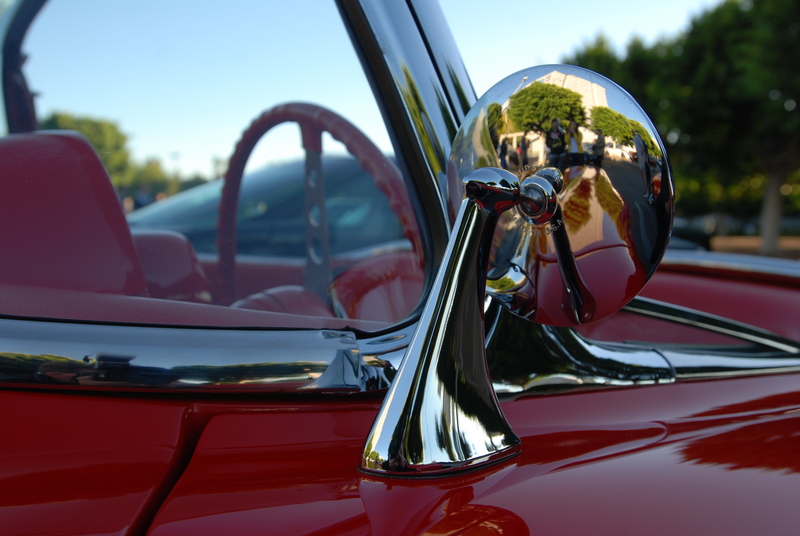 As I rounded the back of the car and approached the driver’s side, I noticed a magazine opened and resting on the rear fender. 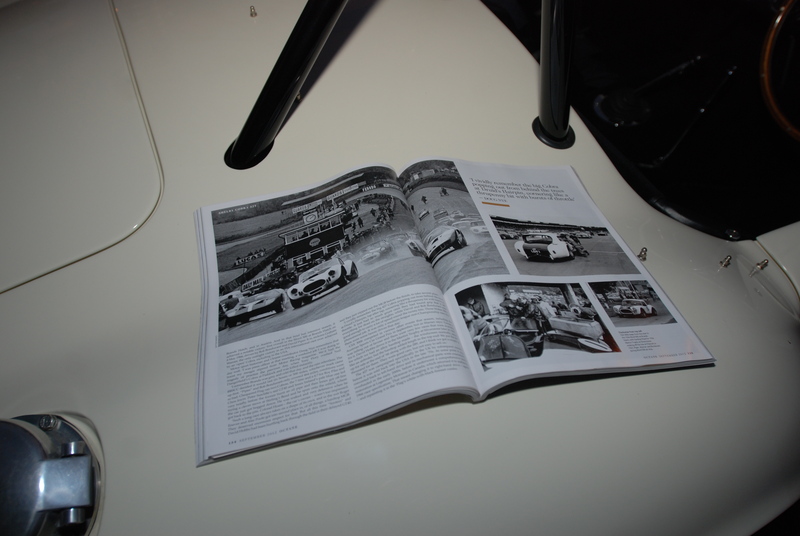 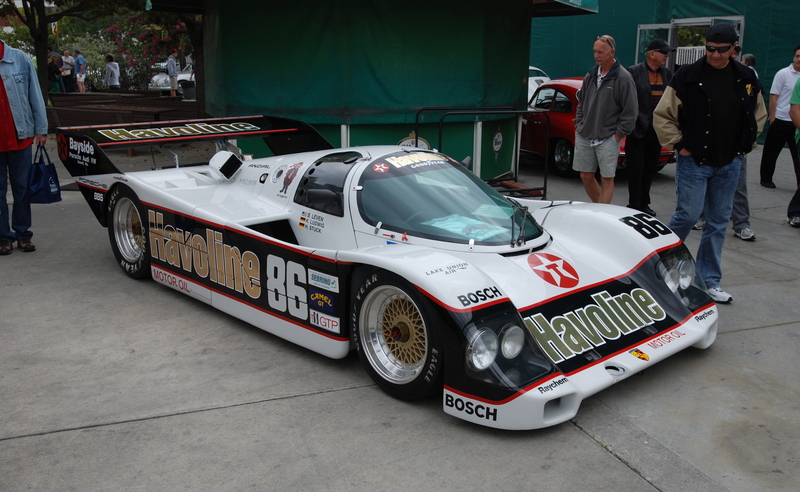 There on the pages, were photos of this very car (with the same LOV I ID), being driven in competition. 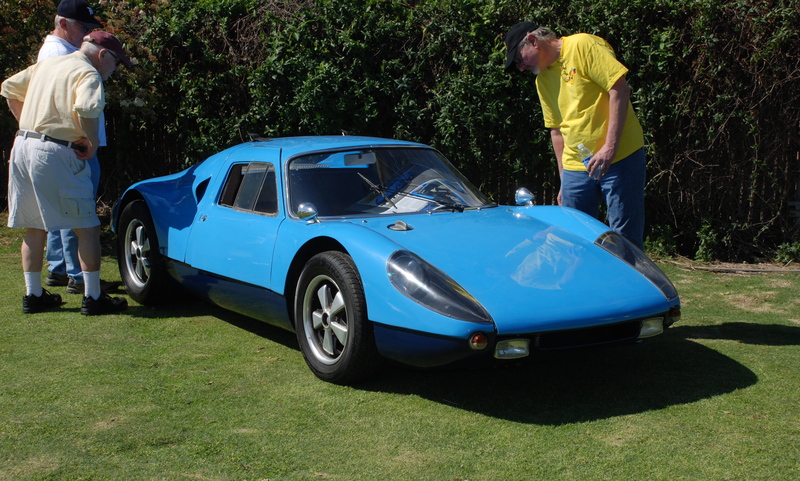 As my friend Dave and I stood looking at the car, we overheard a discussion regarding the car’s history, and learned that it had been successfully raced by the team of Bob Bondurant and David Piper in England back in 1966 at Brands Hatch, where the pair finished in first place. 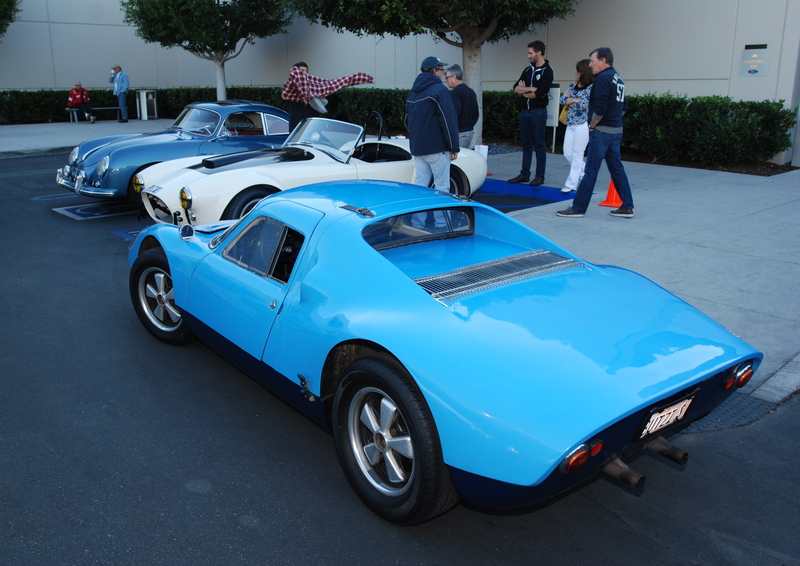 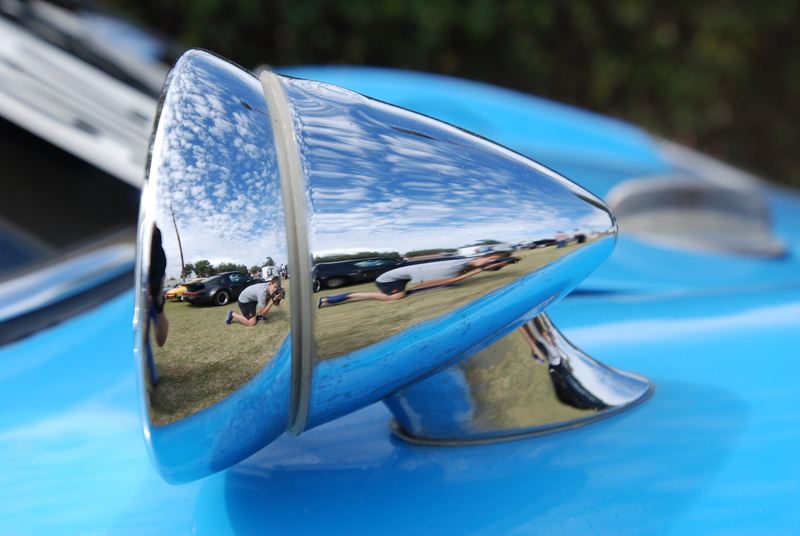 As the morning progressed, the Cobra drew not only people but a trio of 1950’s and 1960’s vintage Porsches, as witnessed by the photos below. 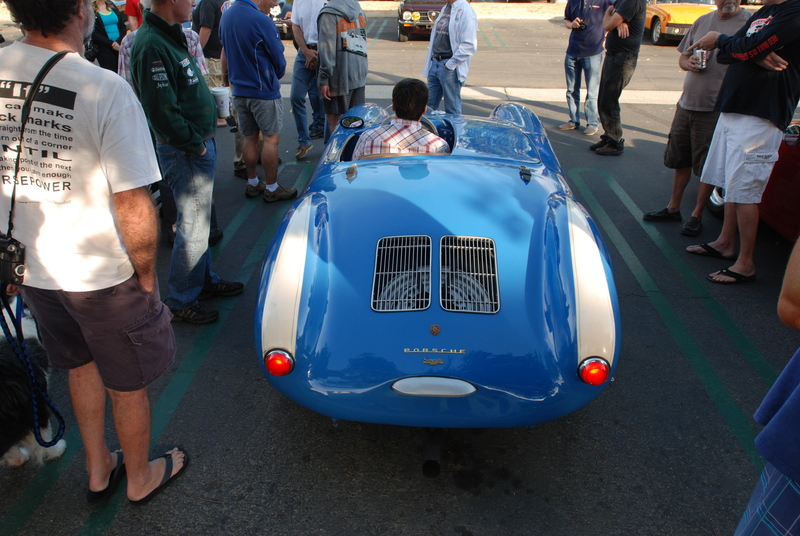 To the Cobra’s left, a blue 1964 Porsche 904 Carrera GTS, and to its right, a blue 1957 Porsche 356A coupe, and just out of frame, a departing Red 1957 356A Speedster with a rare black, hard top option. 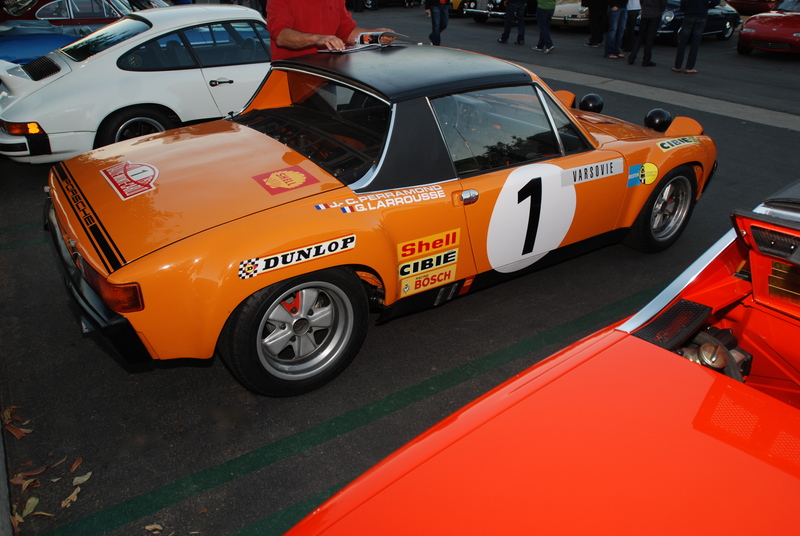 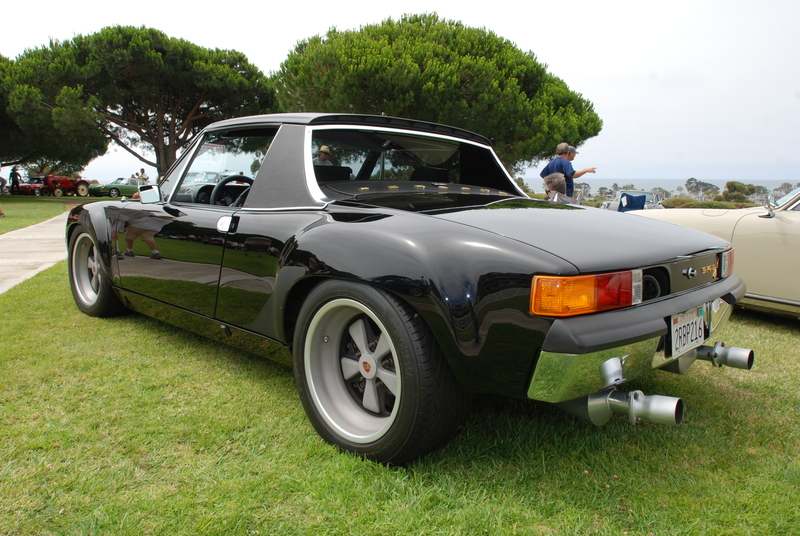 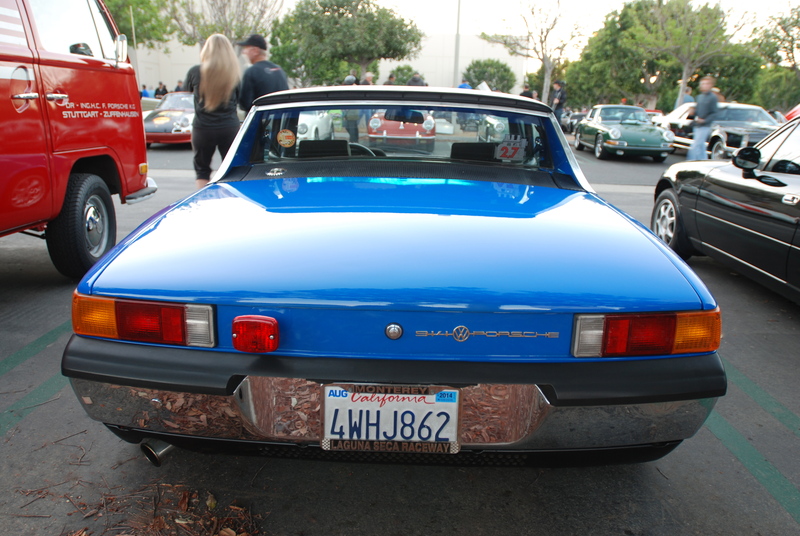 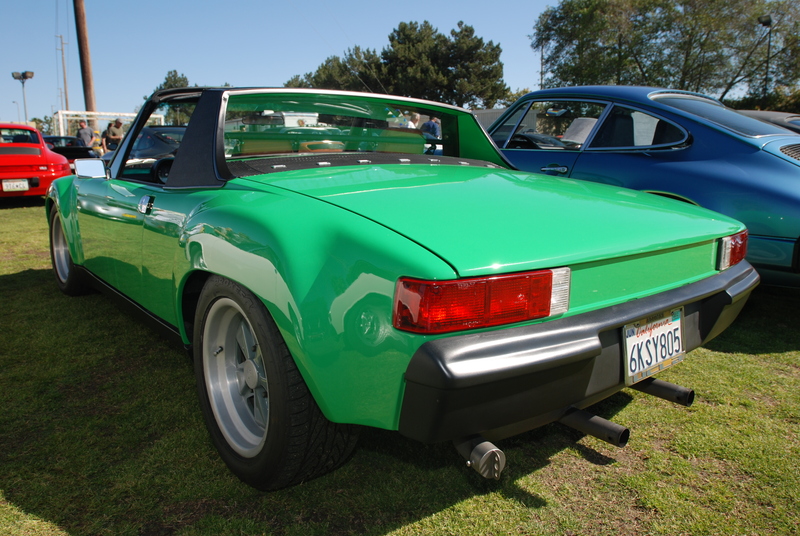 Since the event was now bathed in full sunlight, I decided to return to Porsche row and take a second look at the pair of Porsche 914-6 that I had seen under darkness several hours earlier. 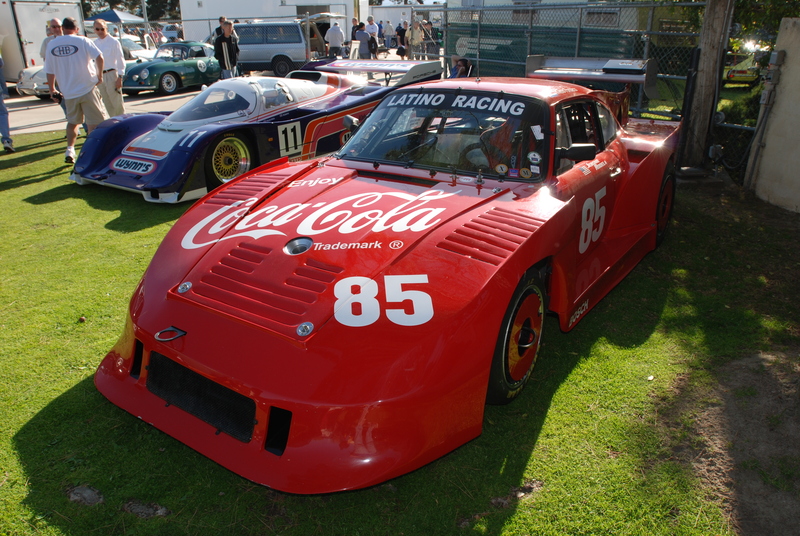 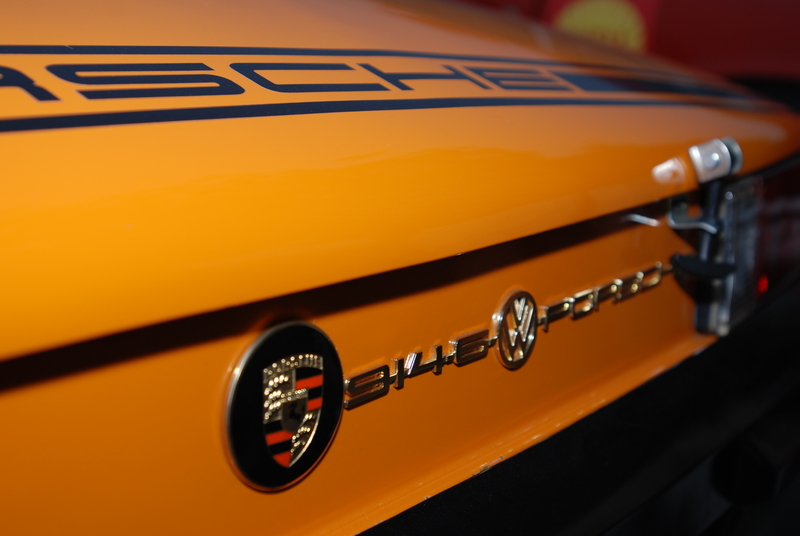 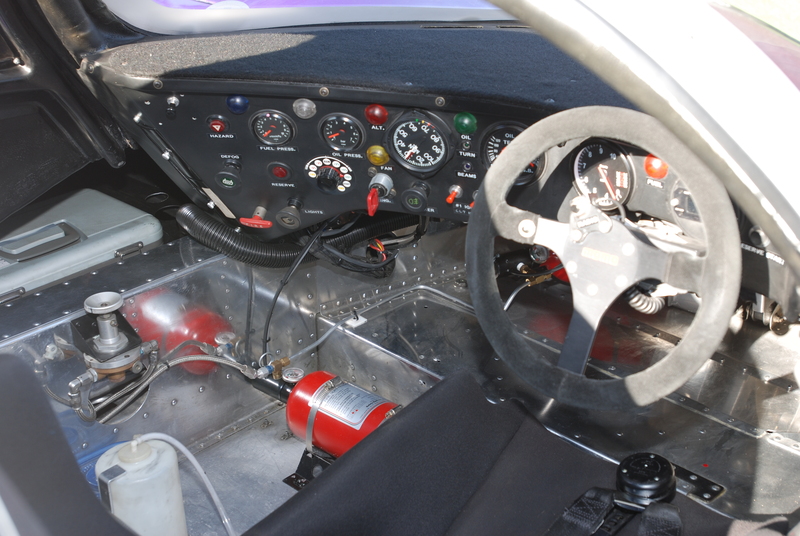 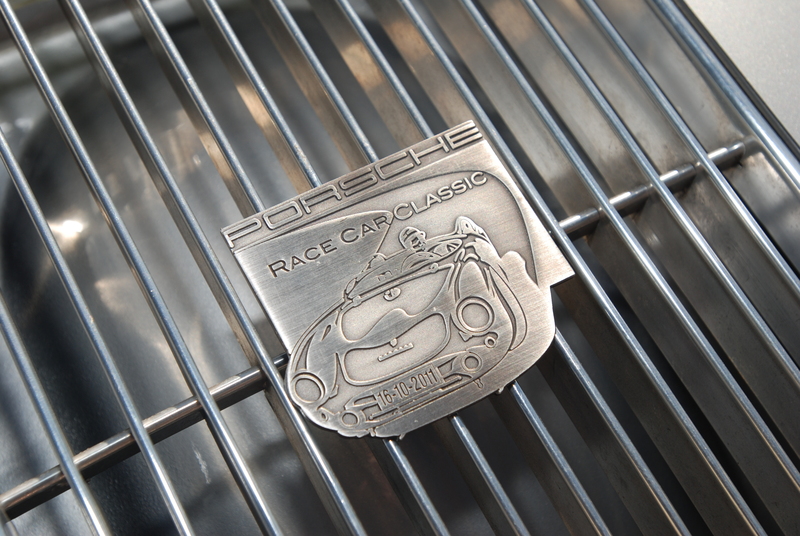 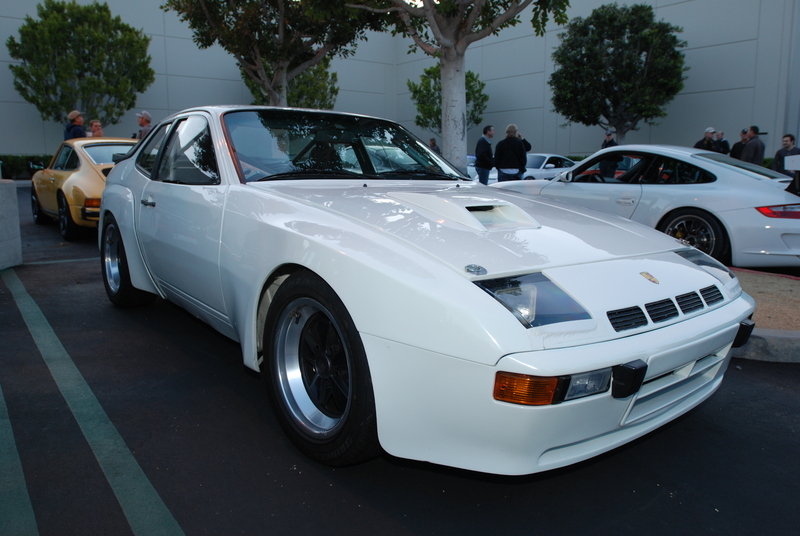 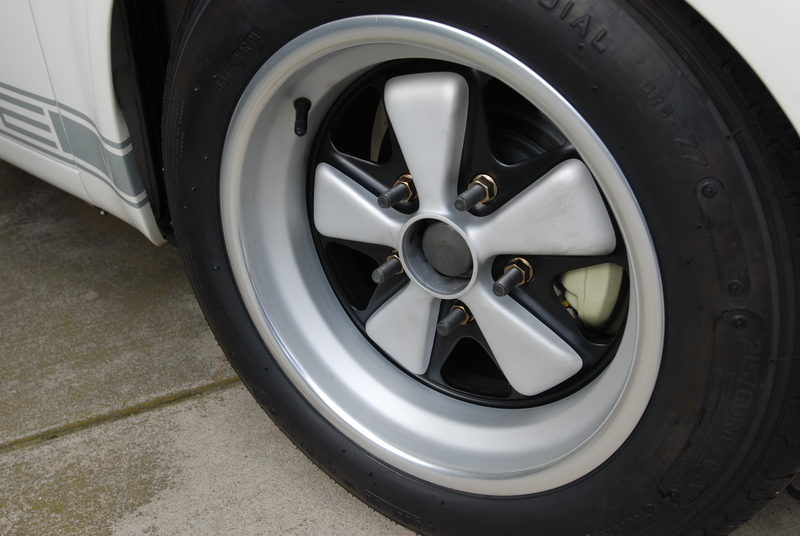 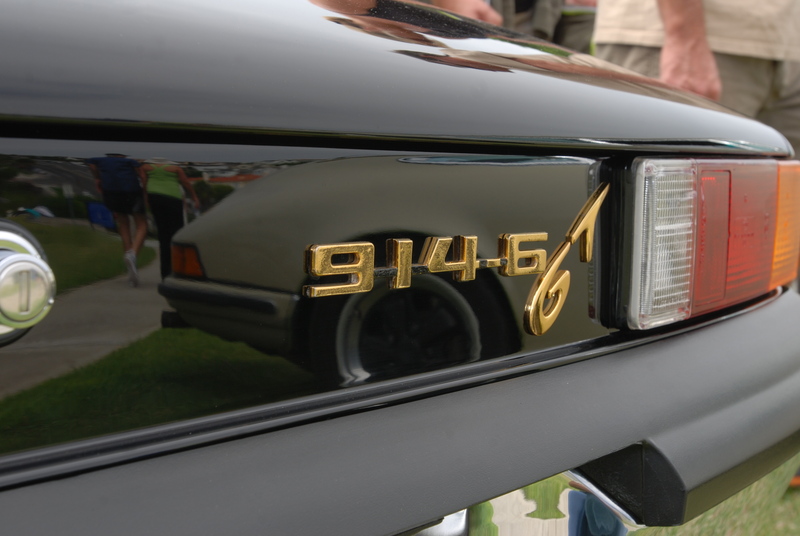 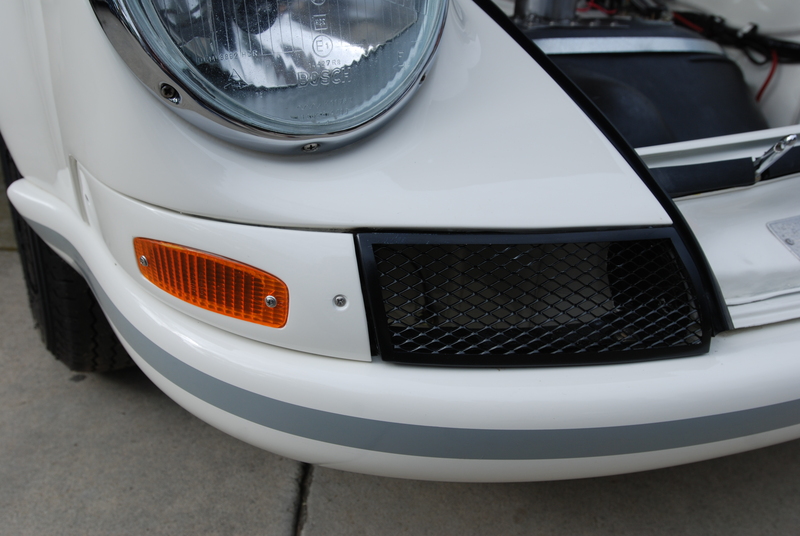 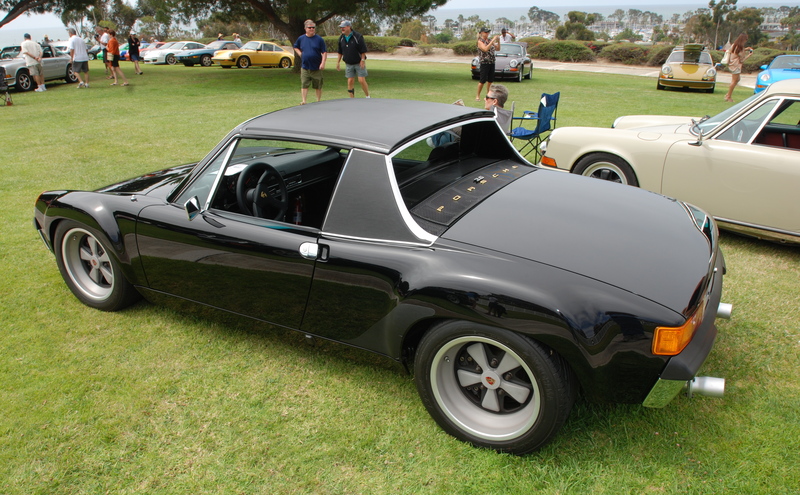 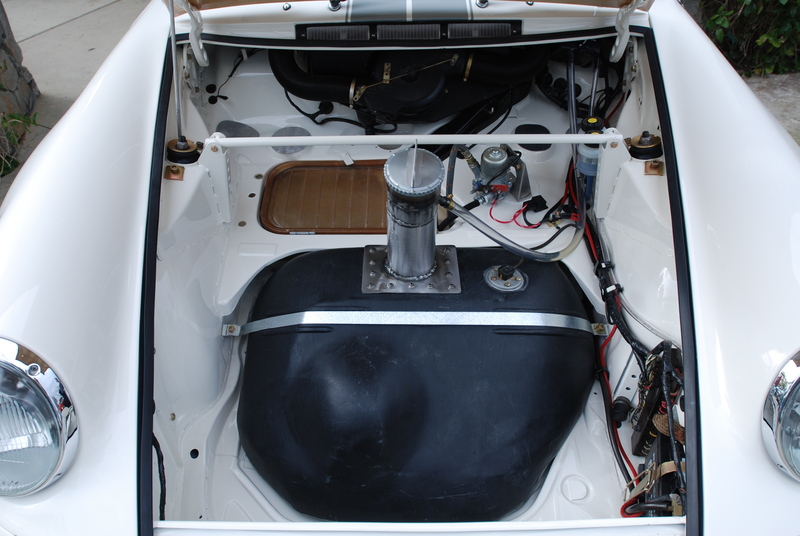 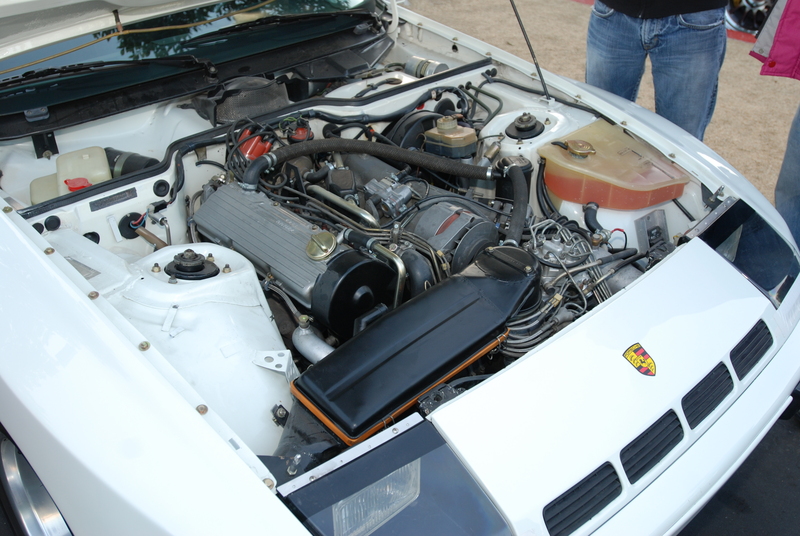 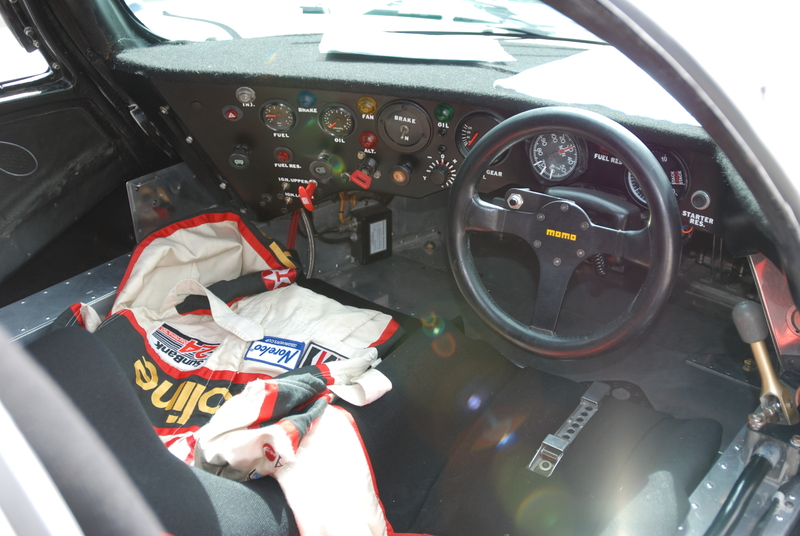 From all outward appearances, the black colored headlight bezel would lead one to believe that this race car could be a 1973 model, since Porsche installed white bezels on the 914 models from 1970 -1972. 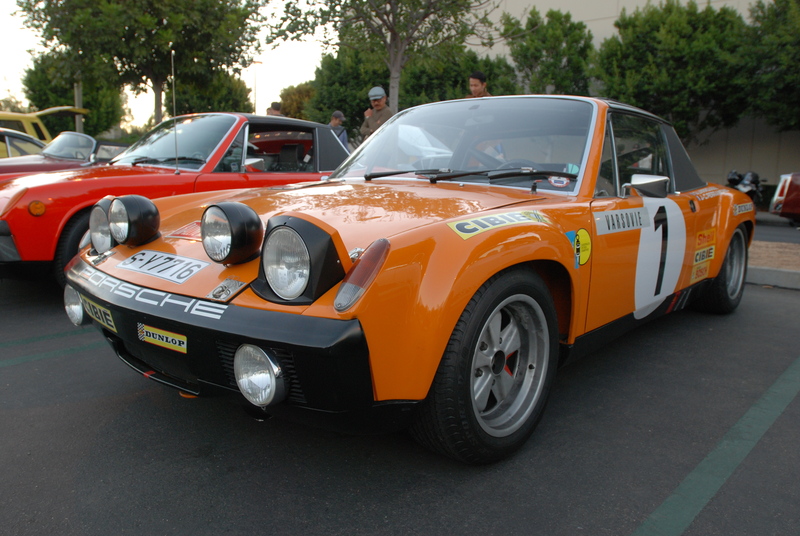 However, because this is actually a 1971 914-6 GT factory race car, maybe they used the black bezel for the sake of aesthetics (to match the black trim of the driving lights and front bumper)? 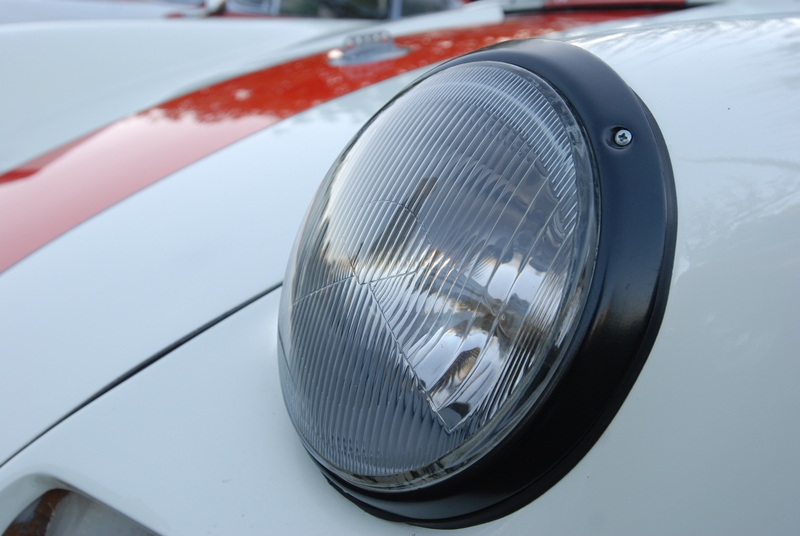 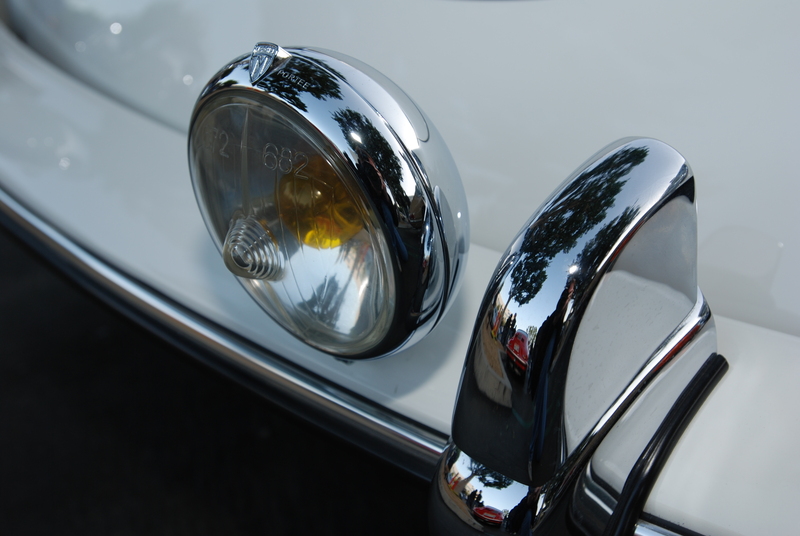 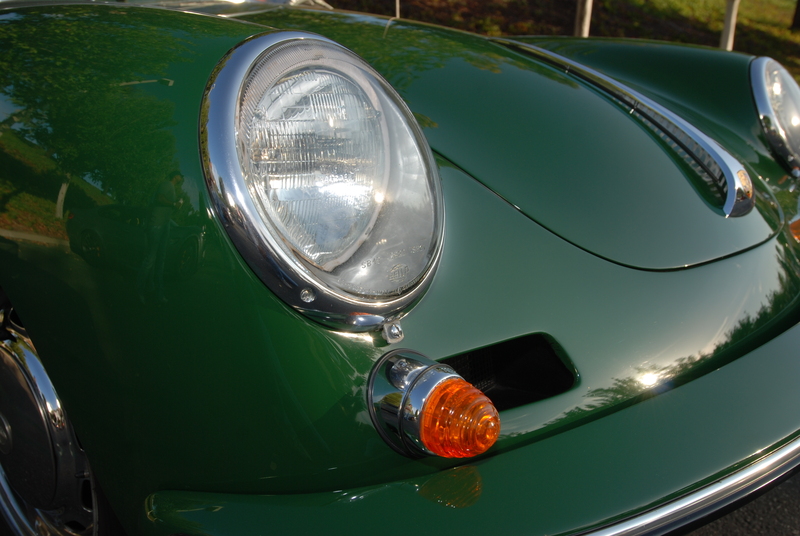 For a brief back story on Porsche 914 headlights, please use this link, for details from one of my previous posts. 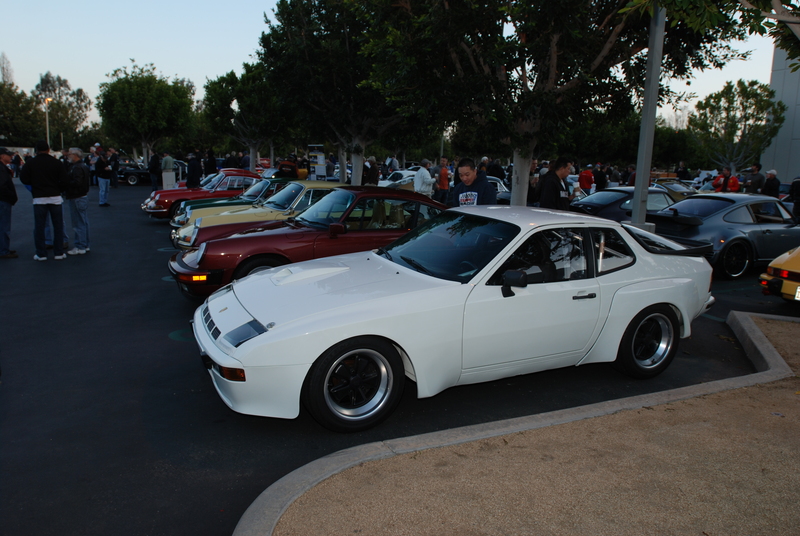 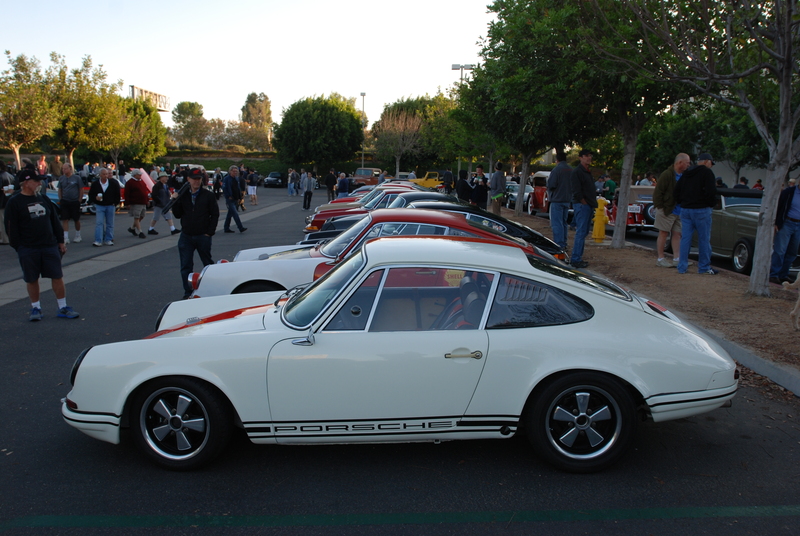 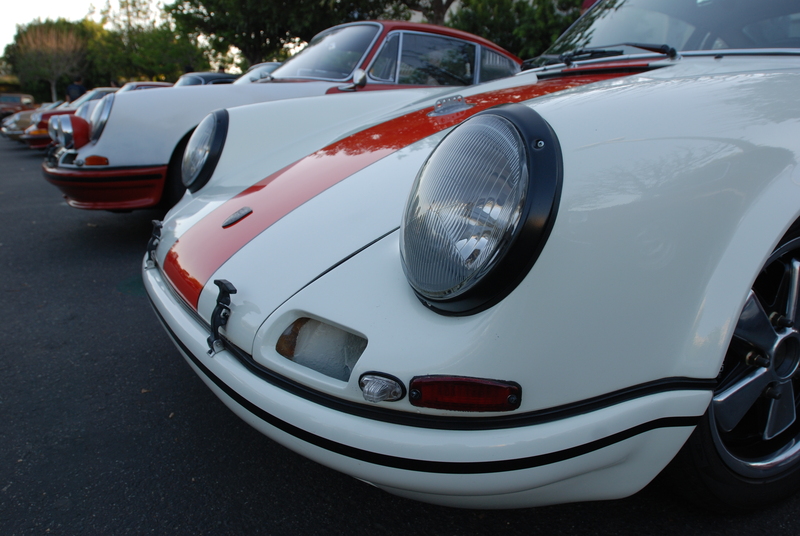 Saturday morning saw Porsche row at Cars&Coffee filled shortly after 6 AM. 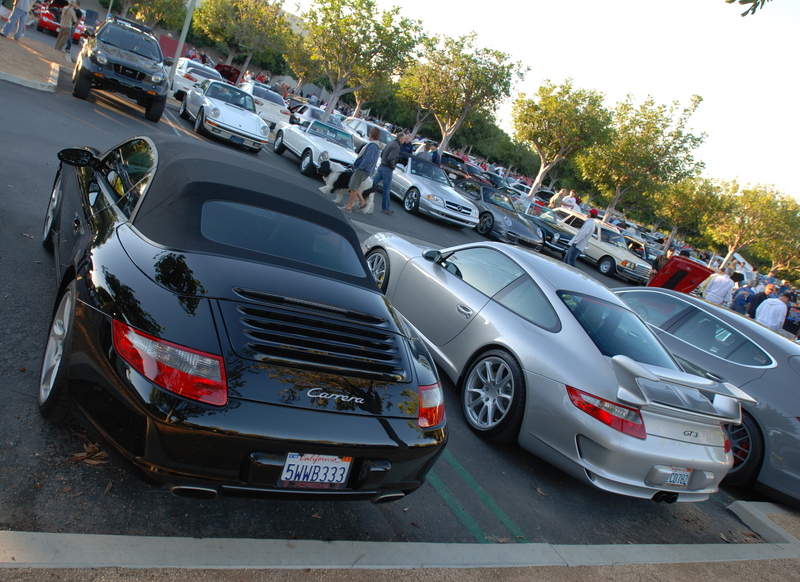 By the time I pulled in at around 6 AM, there were only a half-dozen spaces remaining, scattered throughout the row. 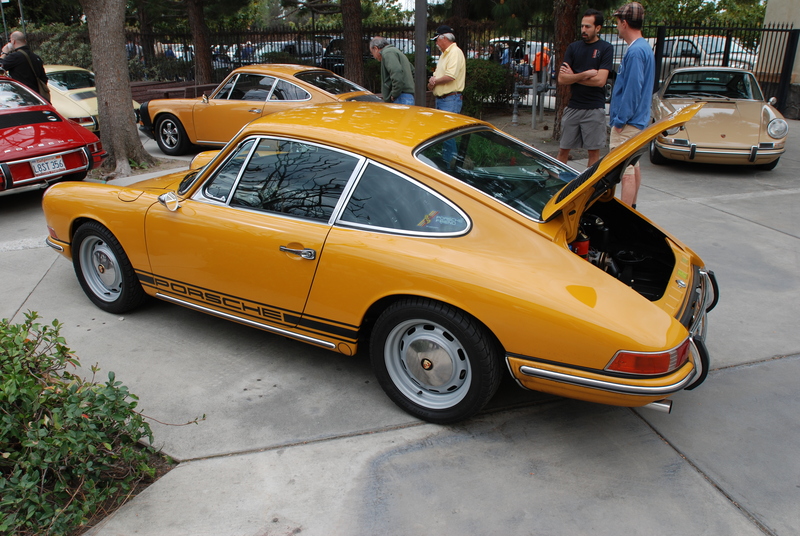 And as I was making my way over to the catering table for my weekly donut and OJ, those remaining space were reduced down to just two. 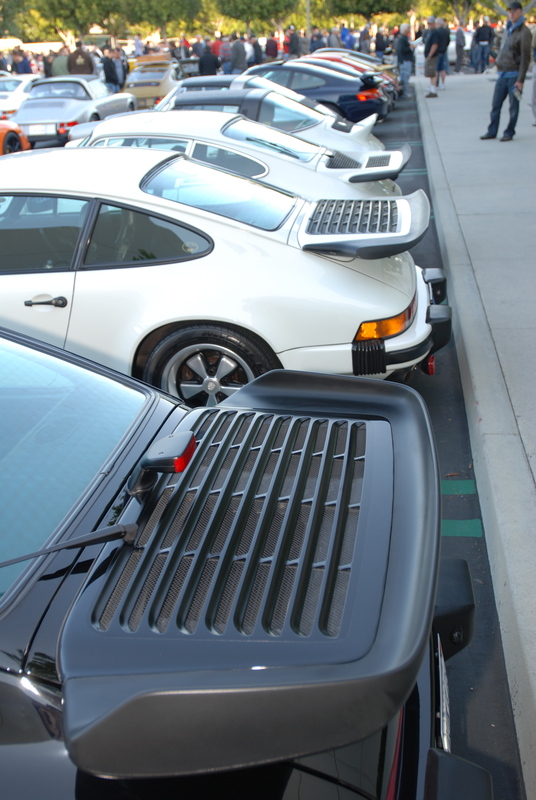 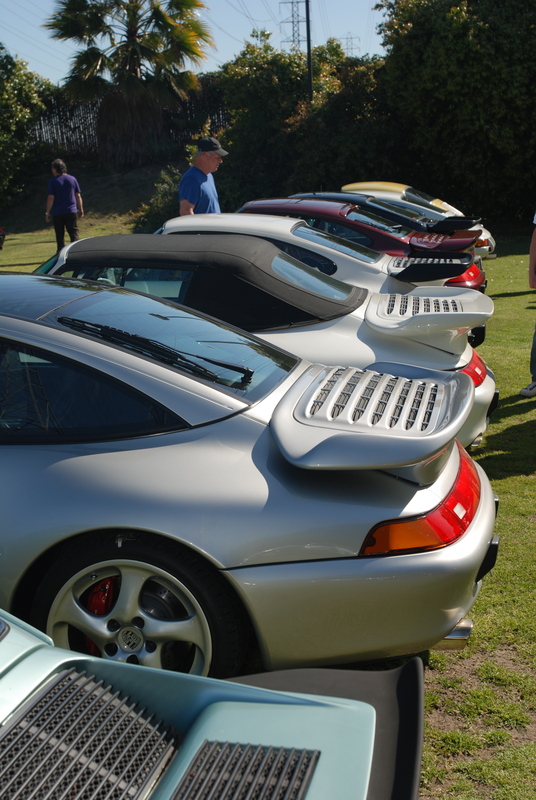 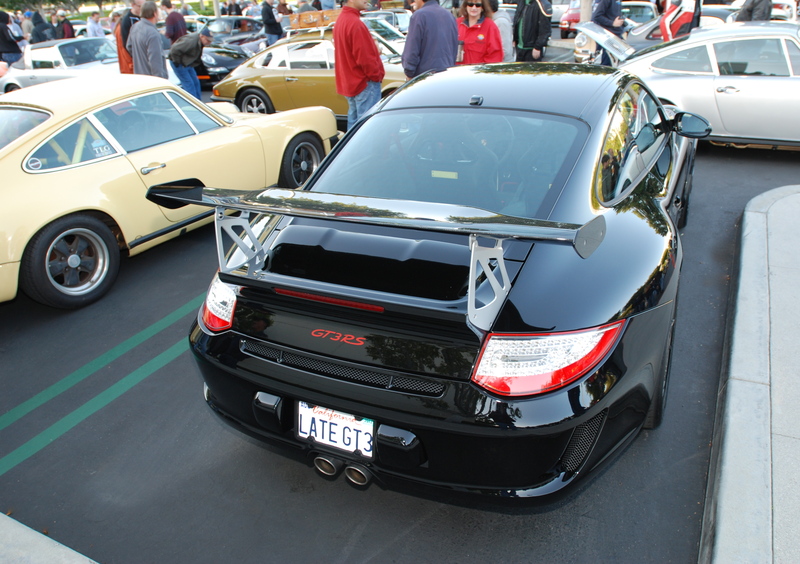 By 6:15, the entire row had been filled, but not entirely by Porsches. 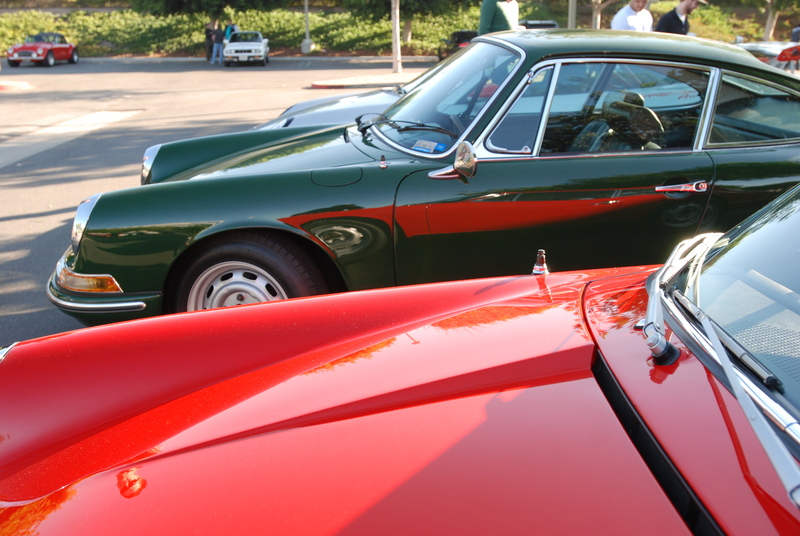 The last two cars were a Mini Cooper and a sunbeam tiger, both friends of the owner of the Mini that was already parked when I arrived. 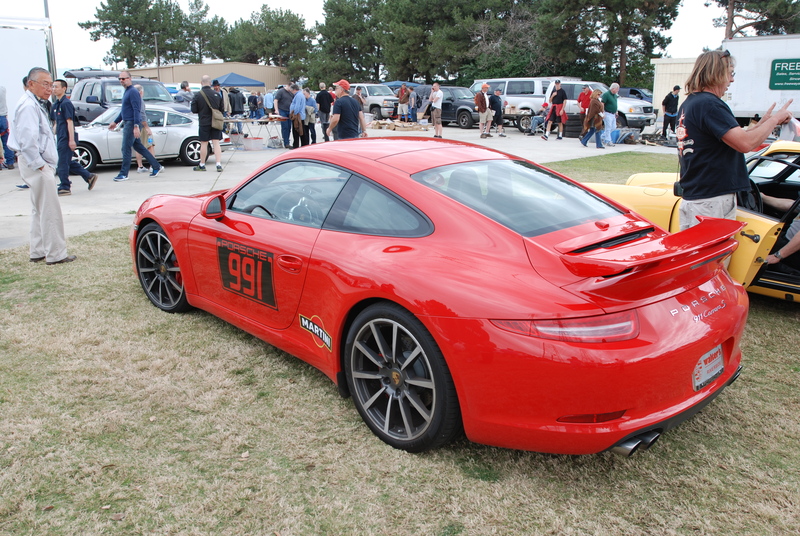 While finishing my donut and talking with several friends, we noticed a red sports prototype pass behind Porsche row and come to a halt on the outside end of our row. 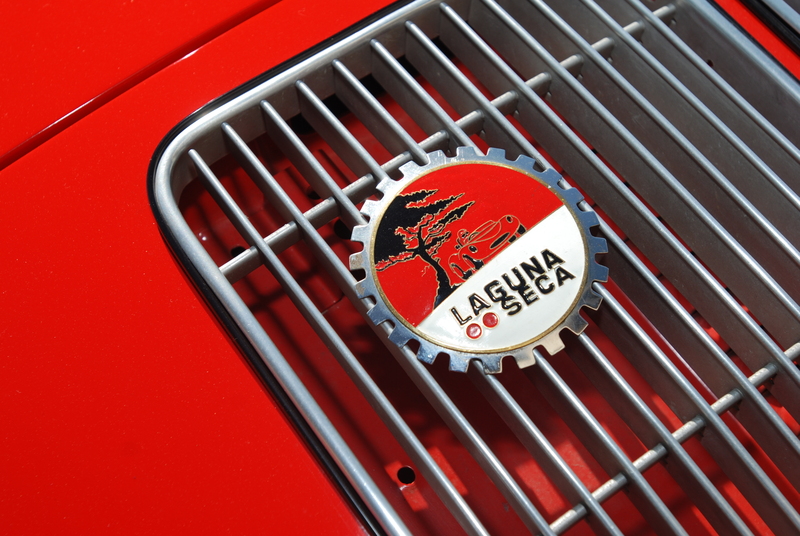 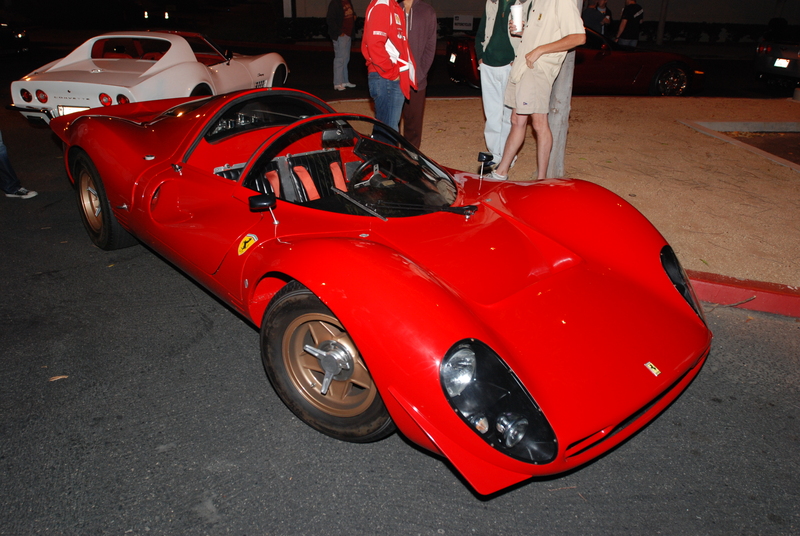 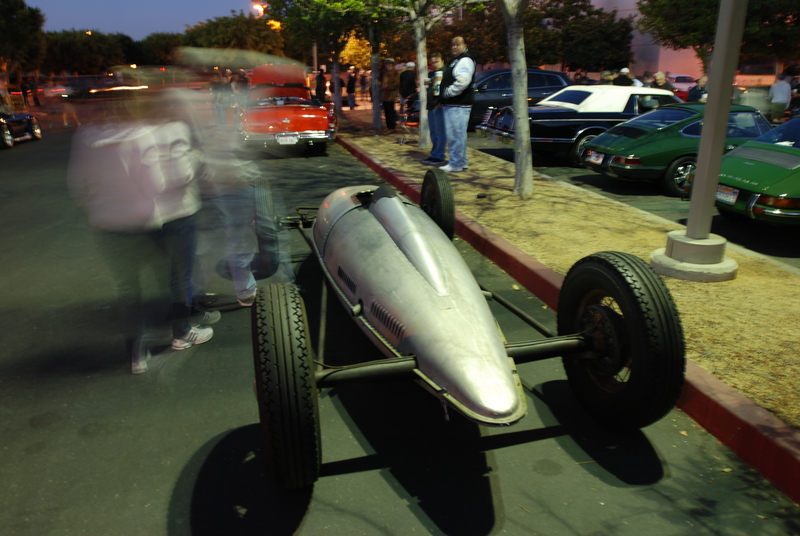 From what I could see of the car under the early morning darkness, it looked to be a mid 60’s vintage Ferrari race car (perhaps a P3 / P4 model), so the next question was what is it, and is it the real deal? 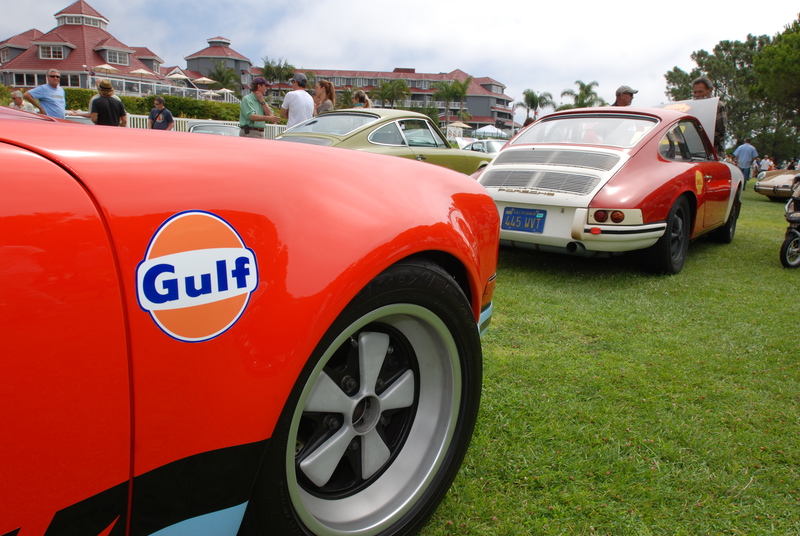 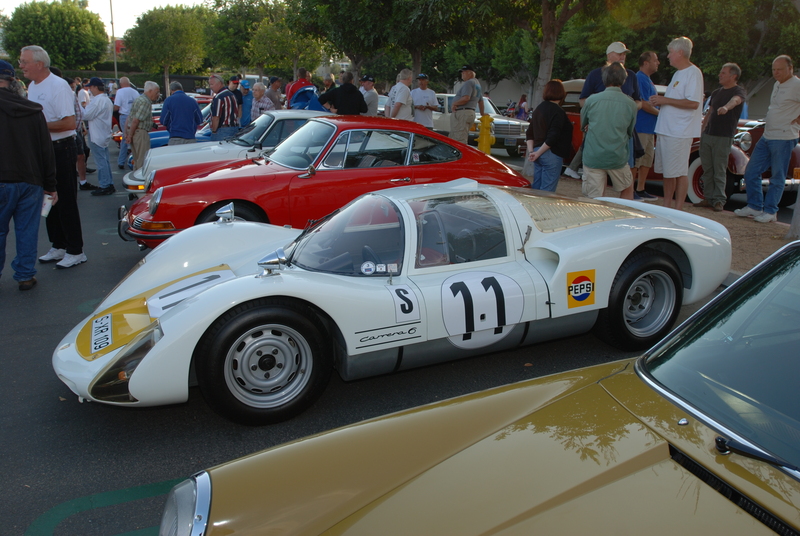 The middle of Porsche row was occupied by several very cool, mid sixties vintage Porsches; one a pristine red,1966 911, and immediately to its left, a white, 1966 Porsche 906 Carrera race car, both frequent visitors to this event. 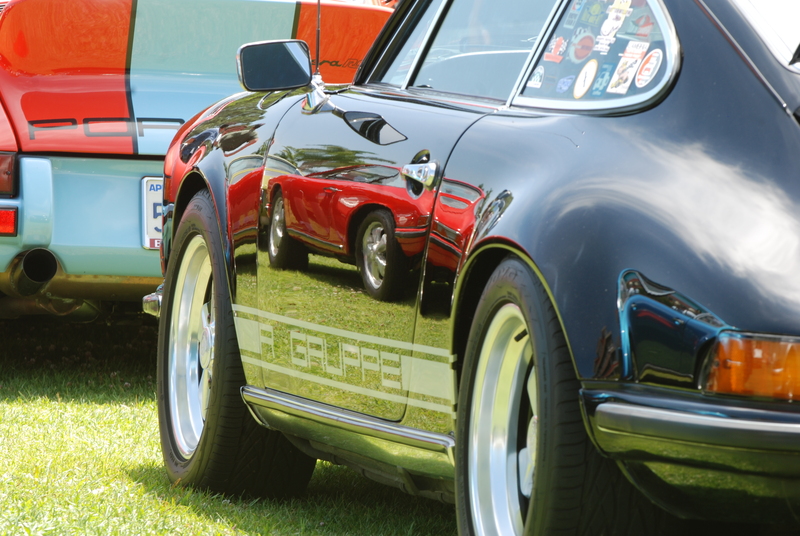 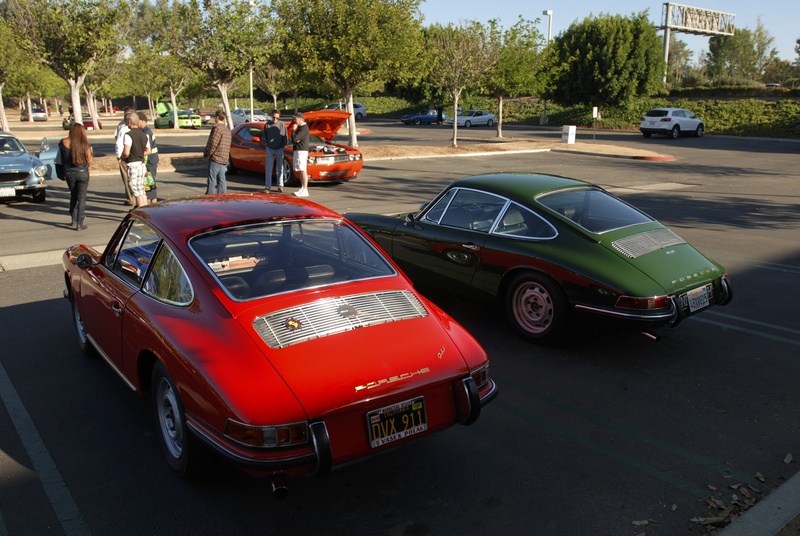 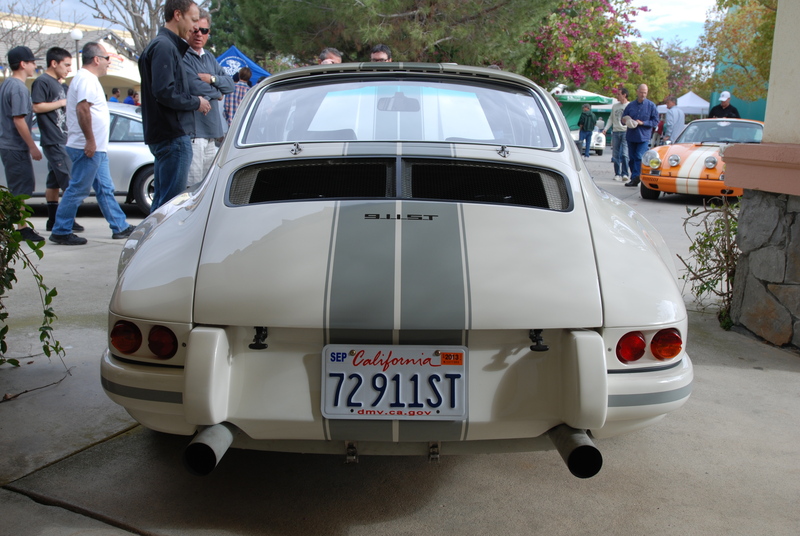 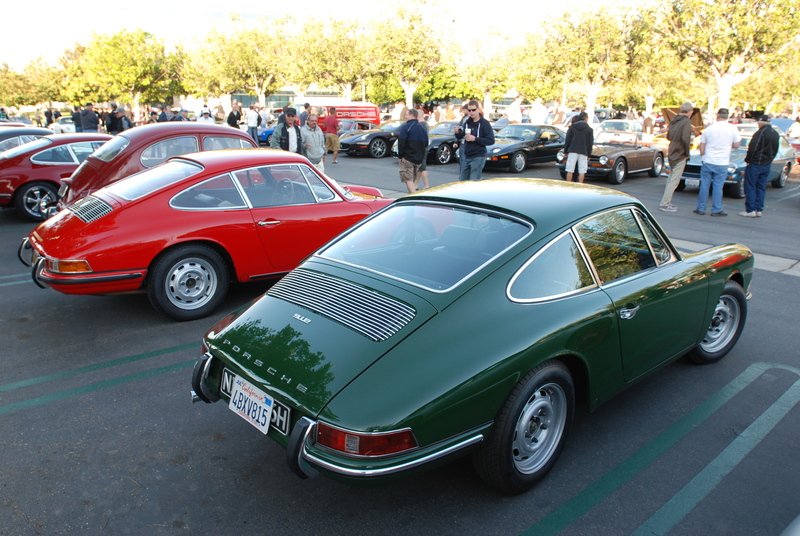 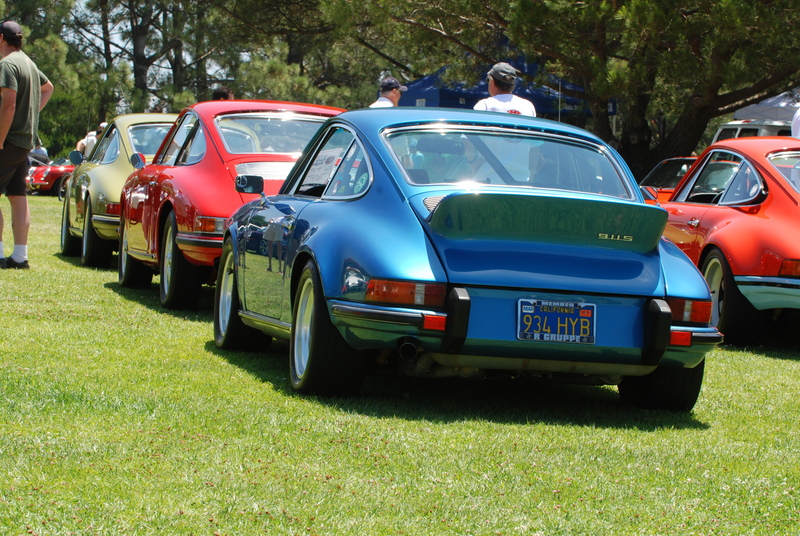 And surrounding these cars on both side were a mix of early 1970s vintage 911s , Porsche 356 and one spectacular 1970 914-6. 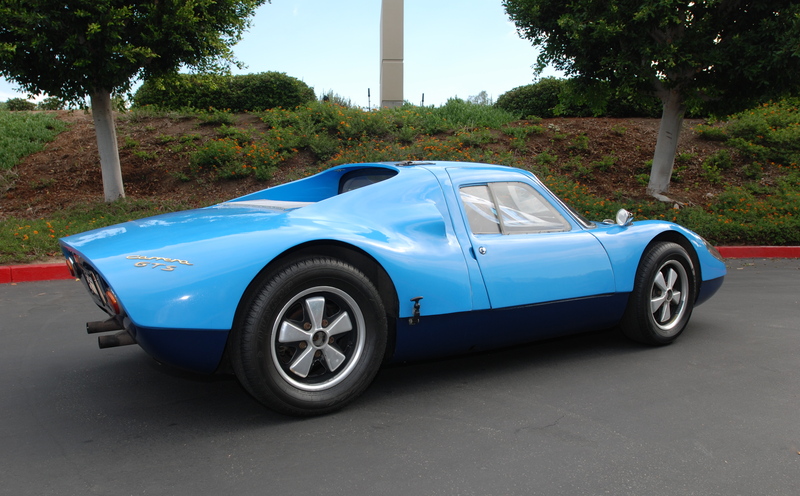 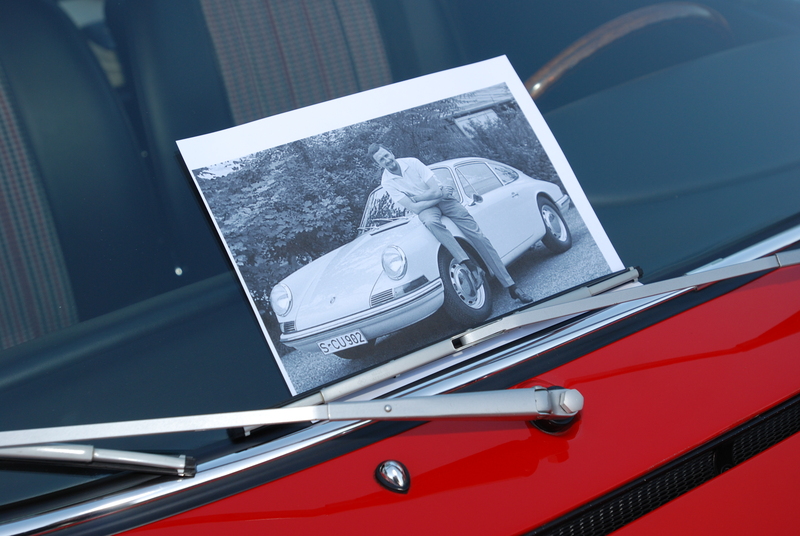 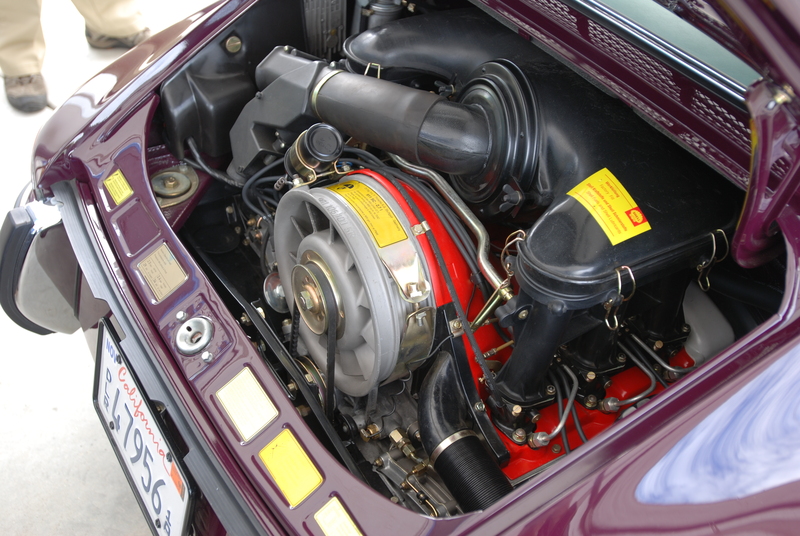 For those unfamiliar with this particular car, this is 904-002, a car not only designed by Ferdinand Alexander “Butzi” Porsche, but the one that served as his personal car, with many unique design features found only on this car. 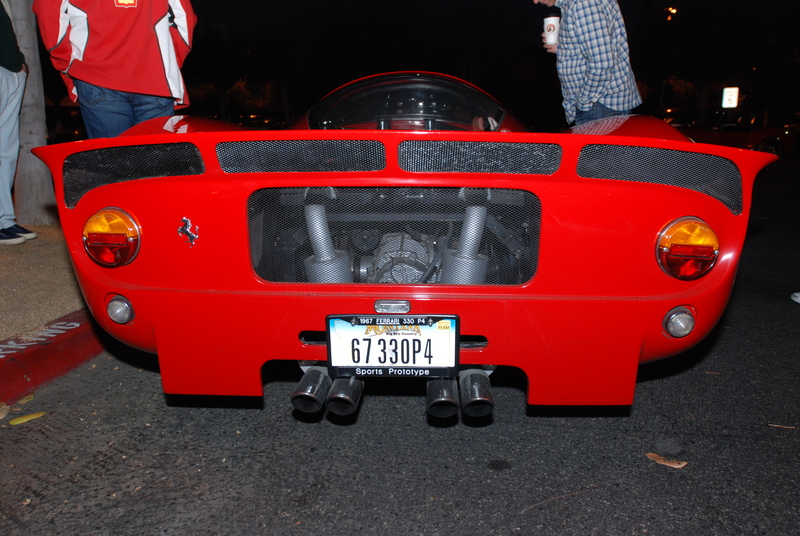 Now back to the mystery Ferrari; while still under the cover of darkness, I made my way towards where it had been parked. 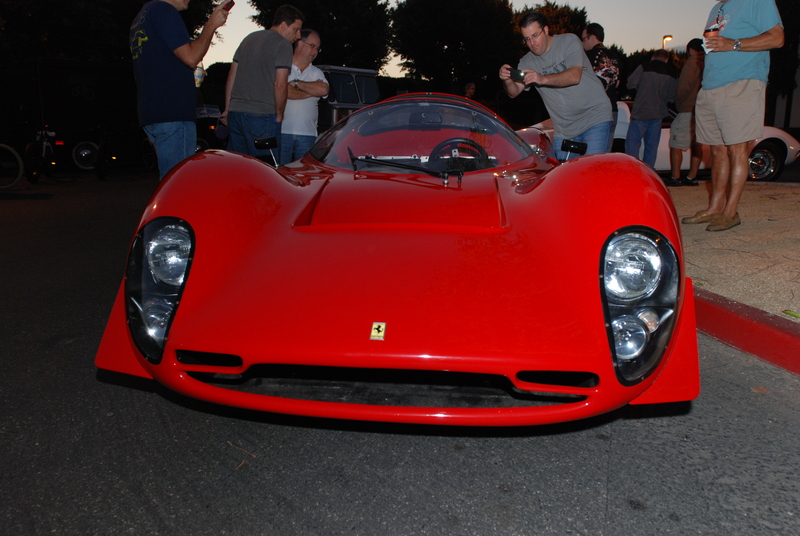 Walking around the car, it sure looked like the Ferrari Prototype race cars I had seen in magazines from back in the 1960’s. 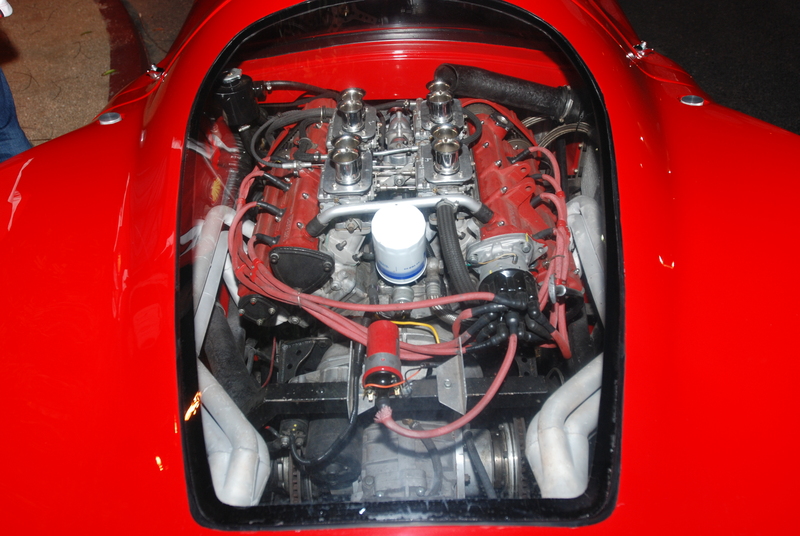 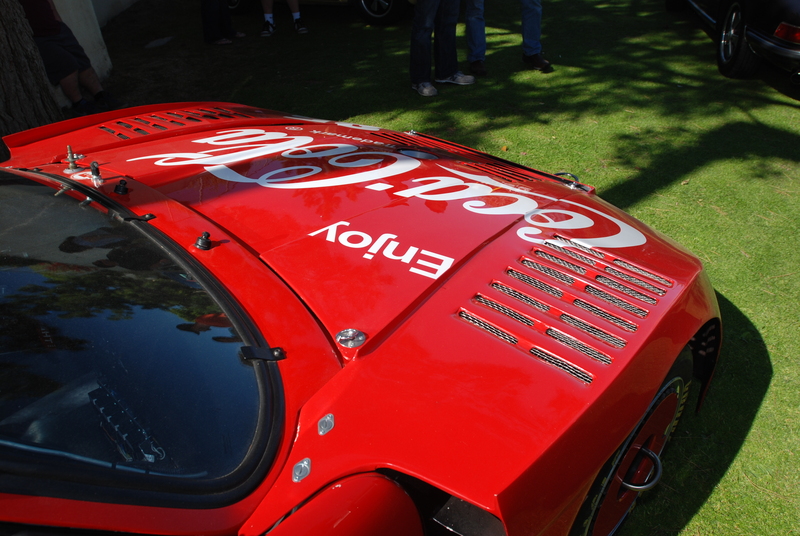 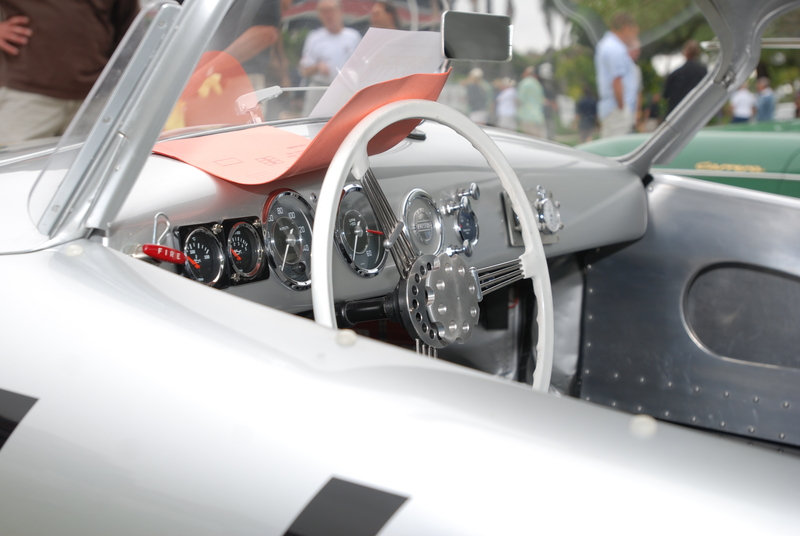 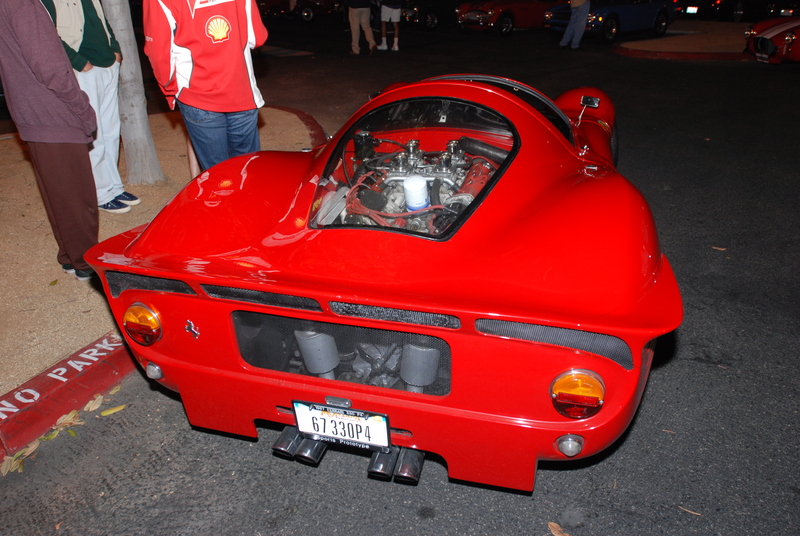 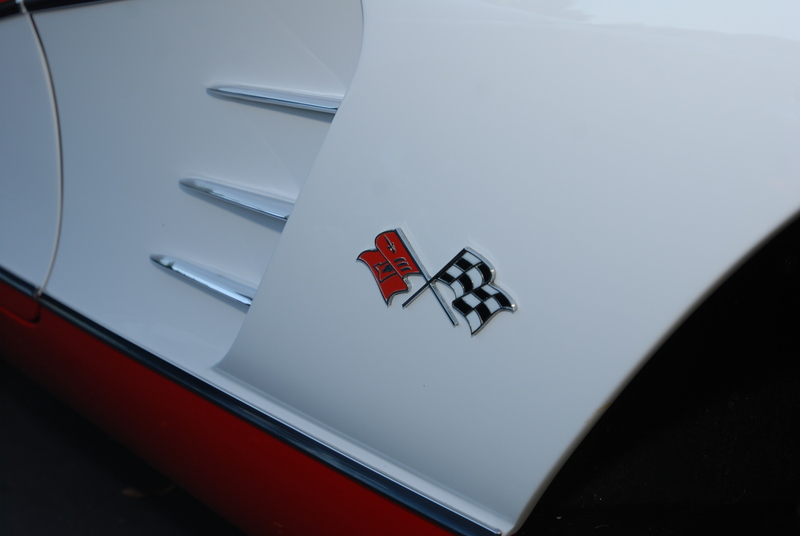 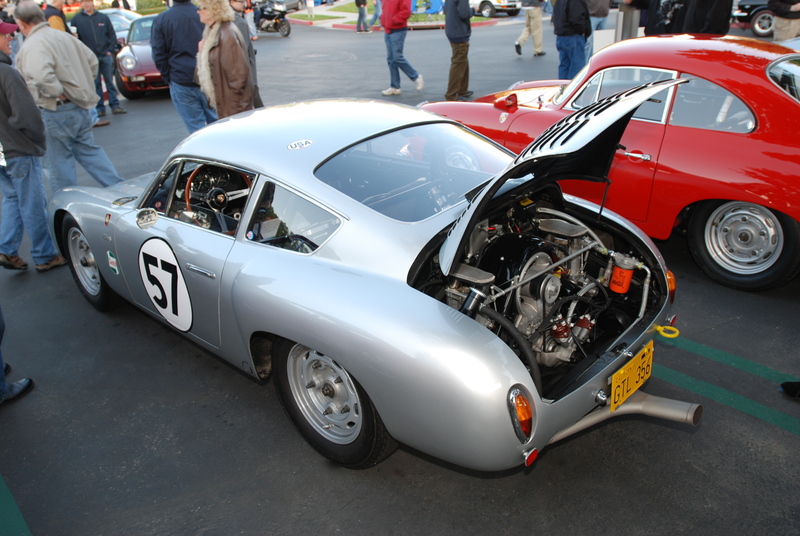 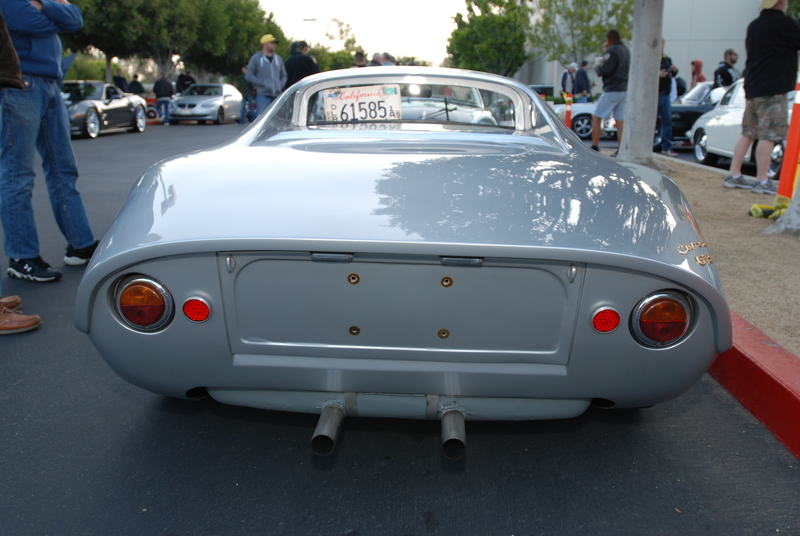 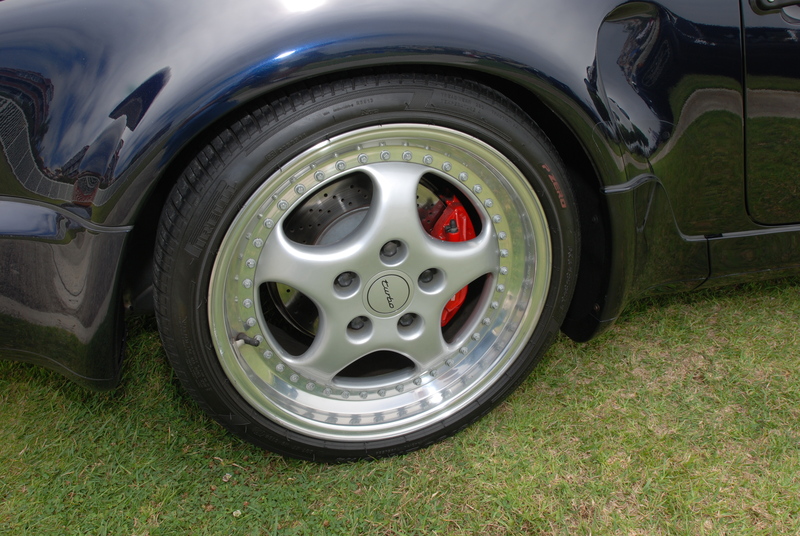 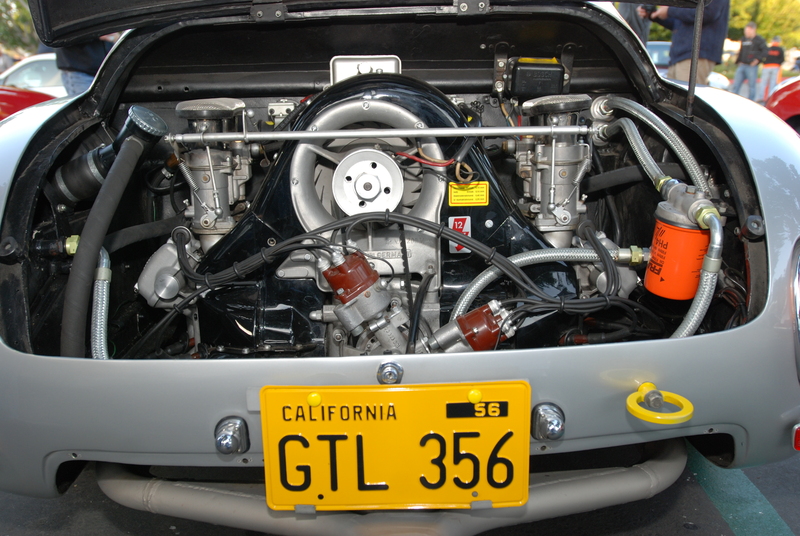 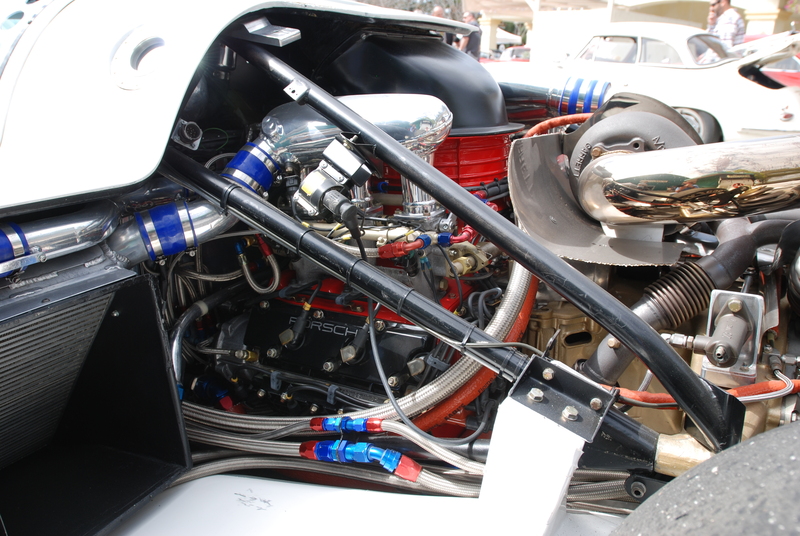 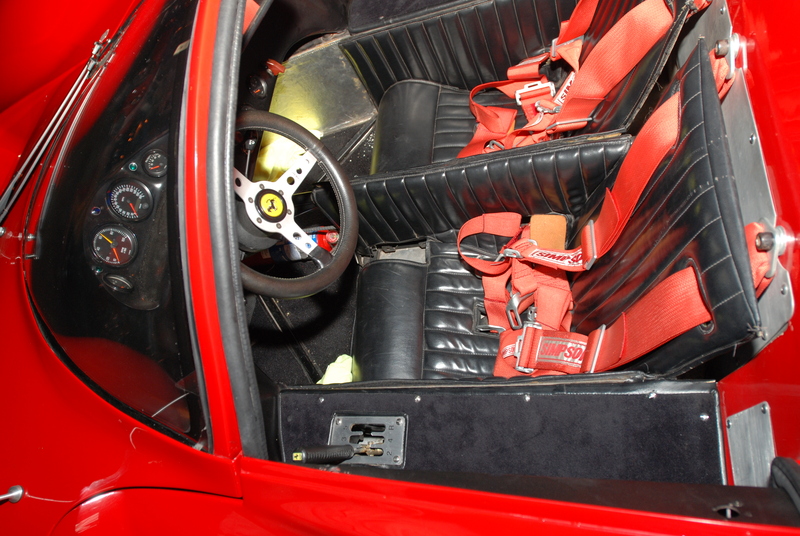 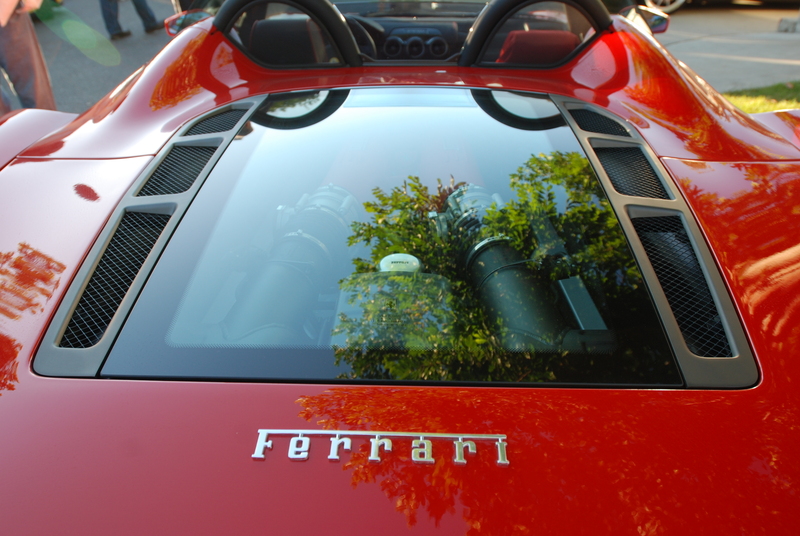 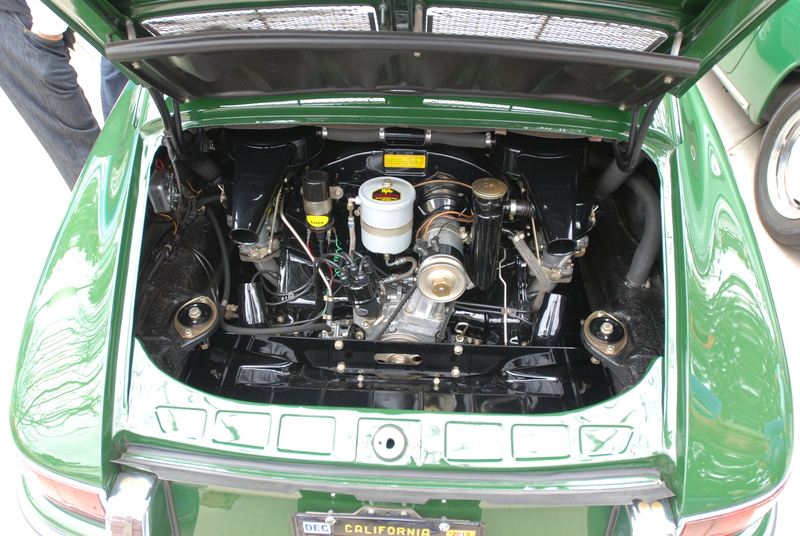 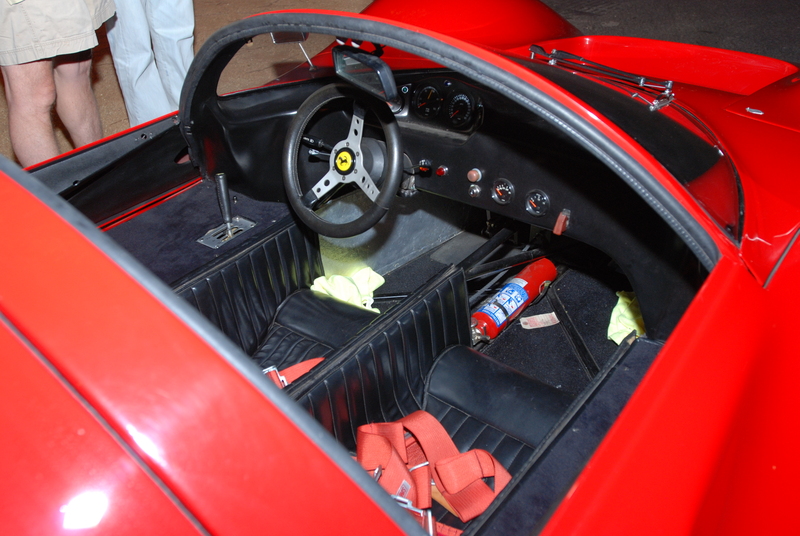 It had the Ferrari badging, gold Campagnolo wheels, and a weber carburetted Ferrari motor with racing exhaust feeding into dual mufflers, all visible through the rear window. 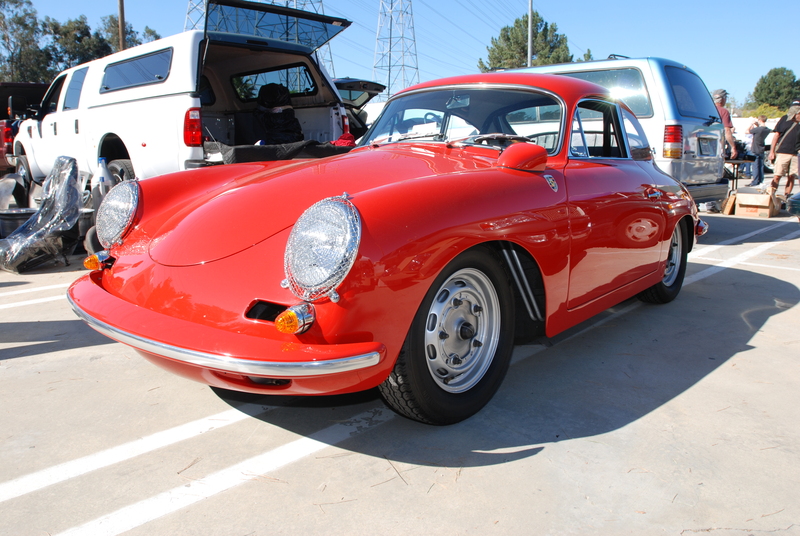 Seeing just one of these 1960’s classics is a treat, be it Porsche or Ferrari, but leave it to Cars&Coffee to deliver automotive diversity in quantity each and every Saturday morning, and for me that is what keeps me returning each week. 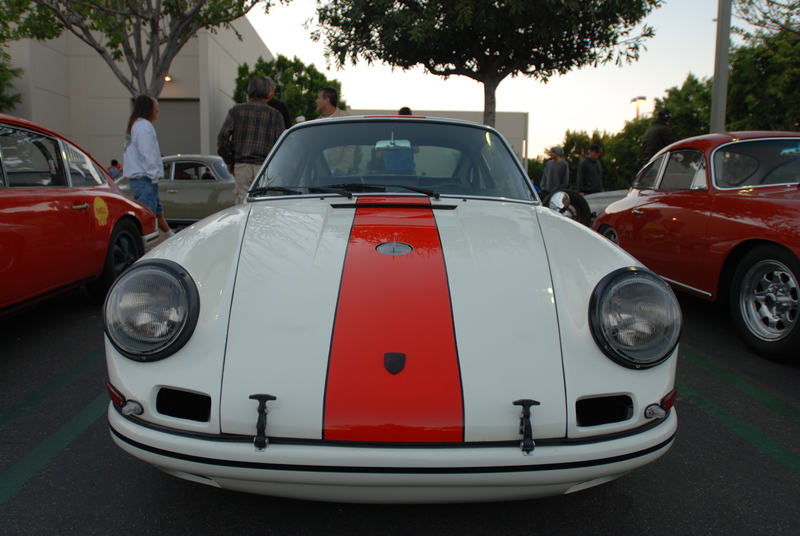 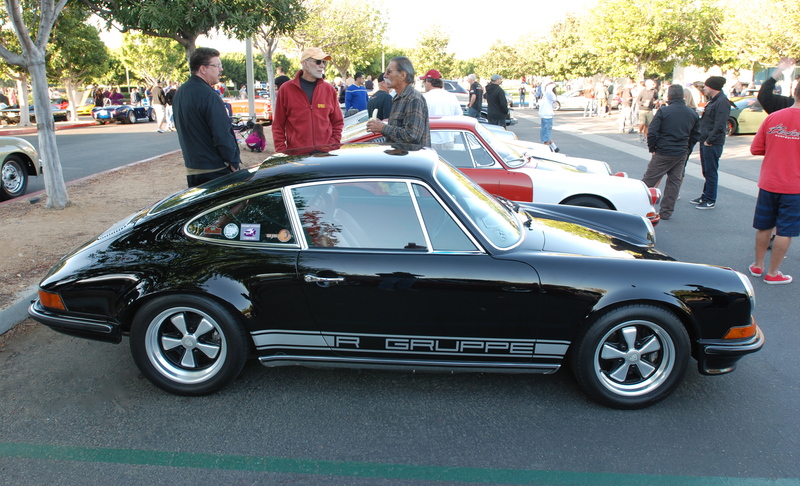 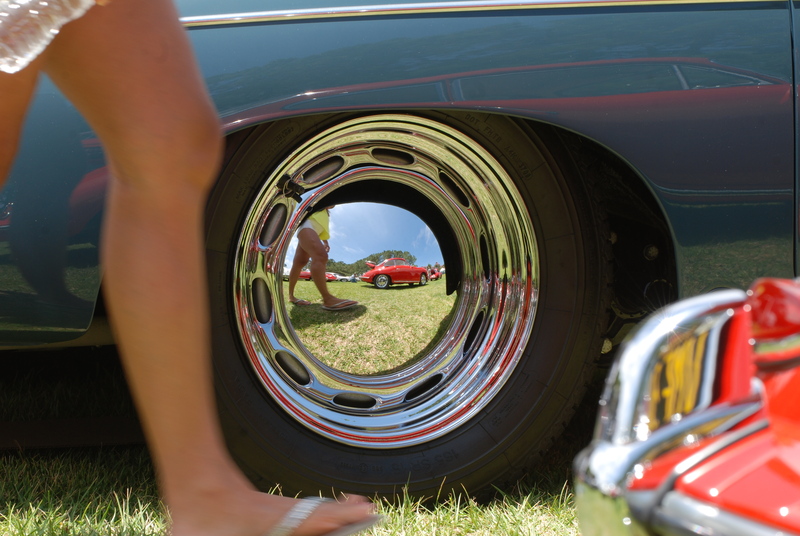 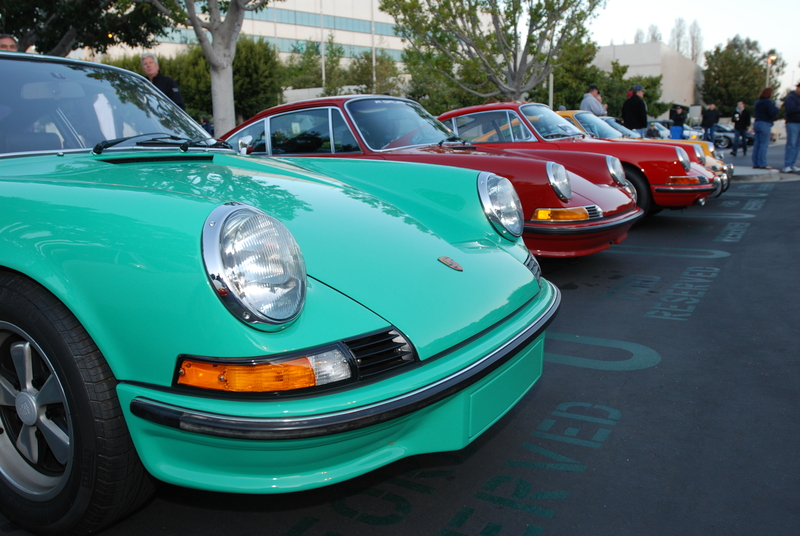 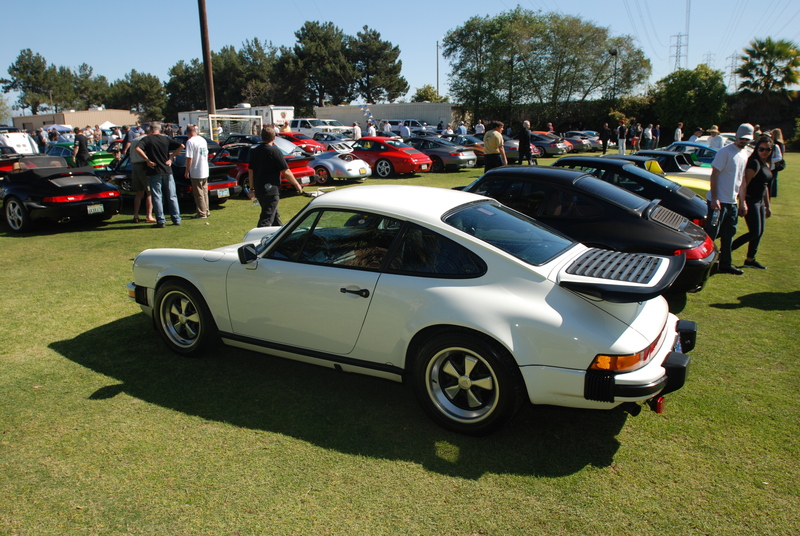 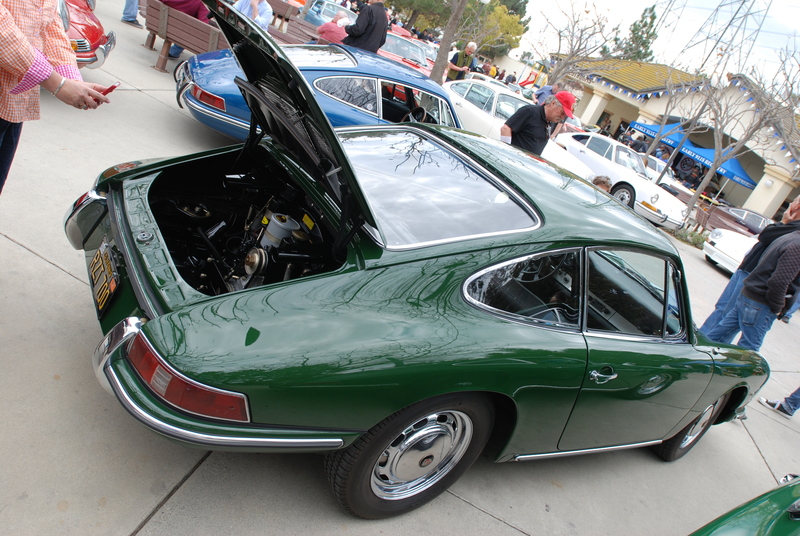 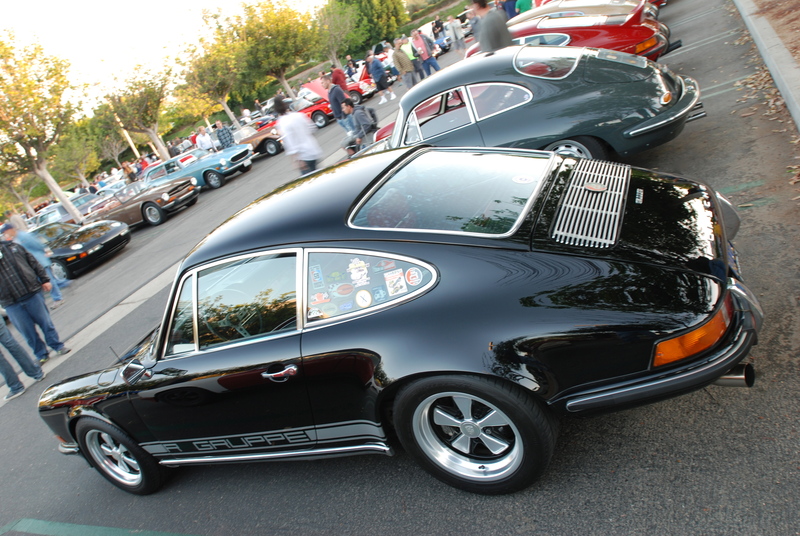 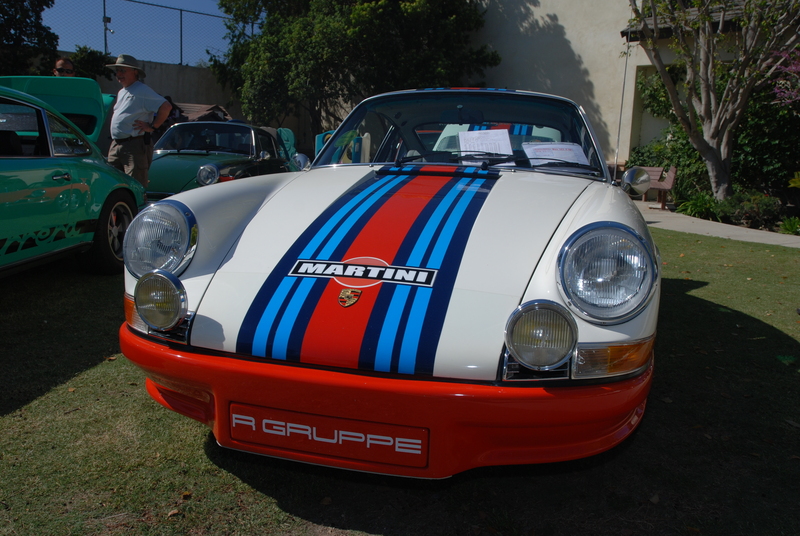 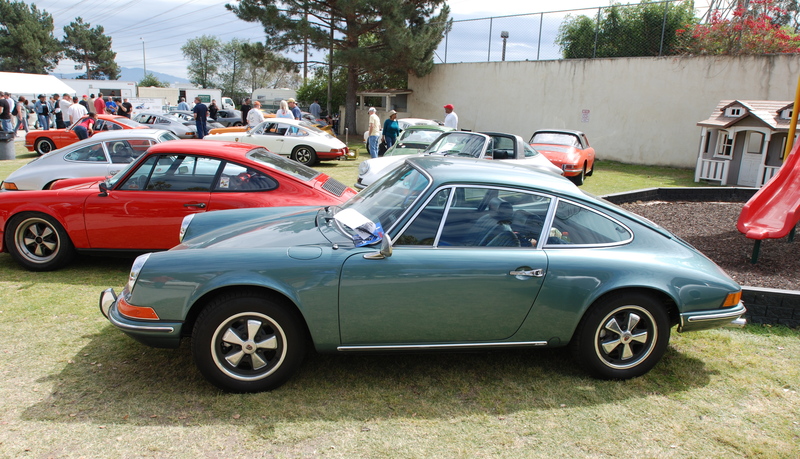 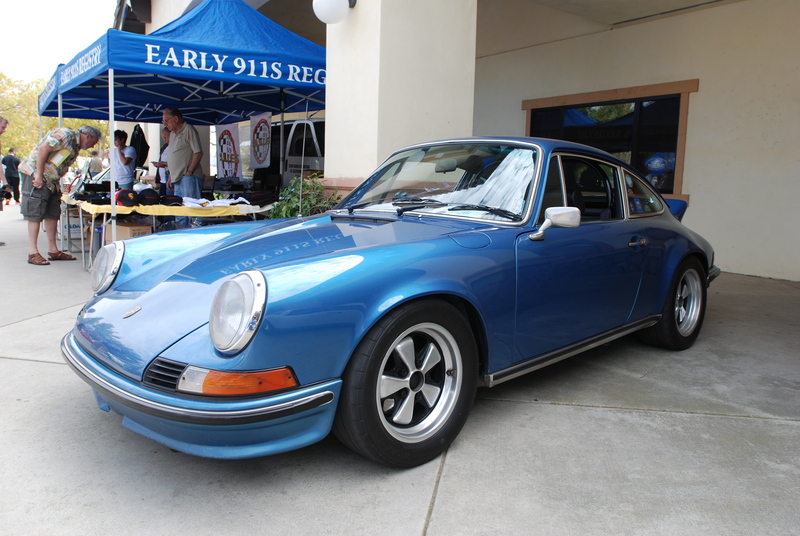 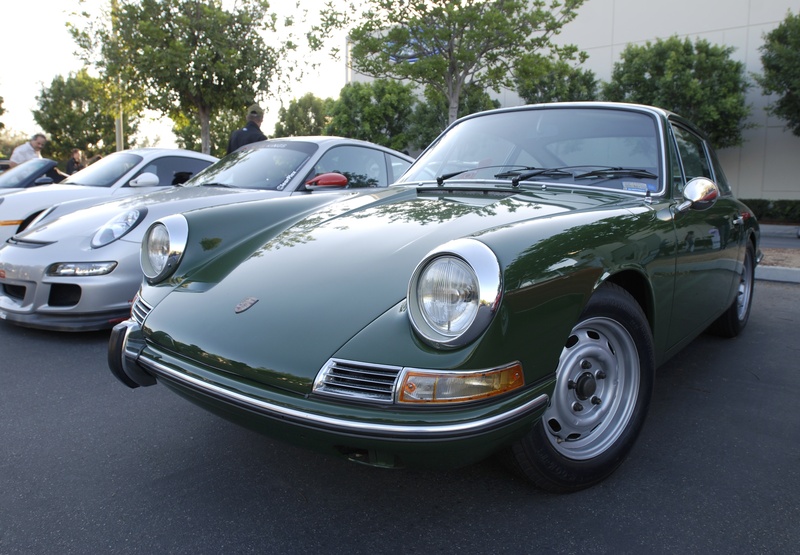 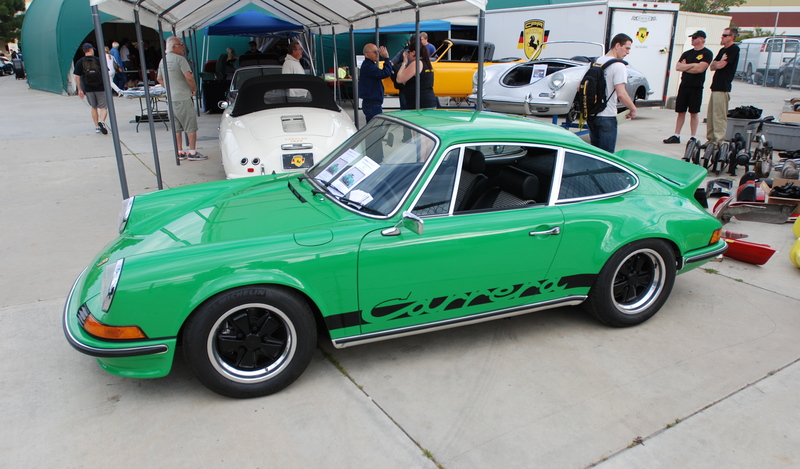 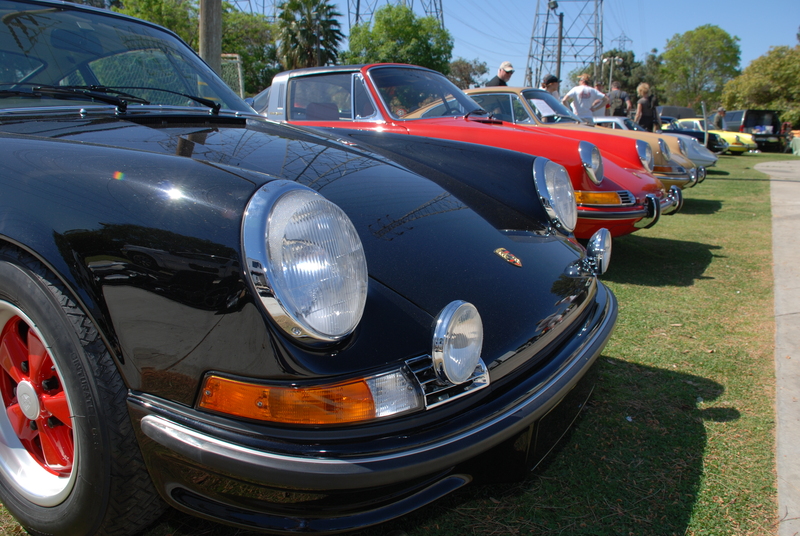 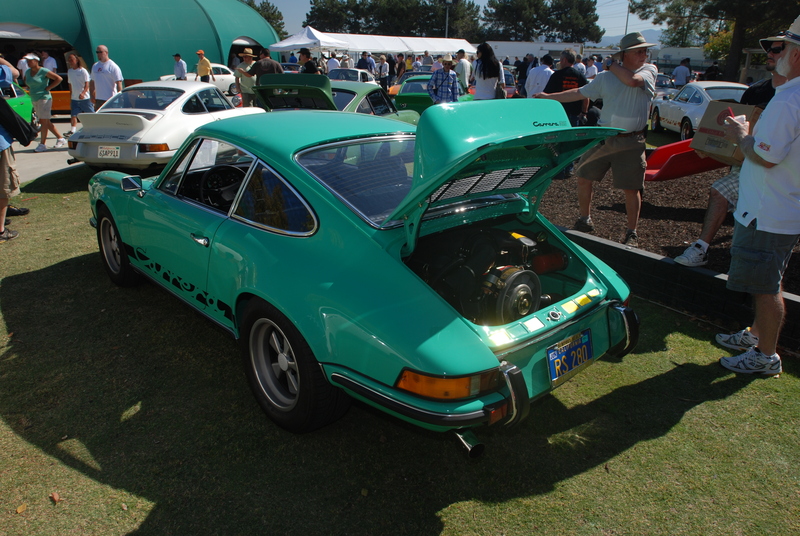 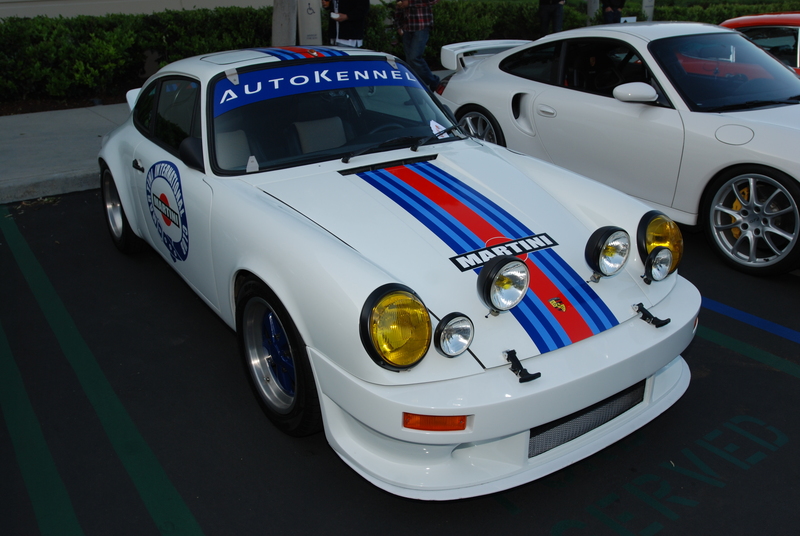 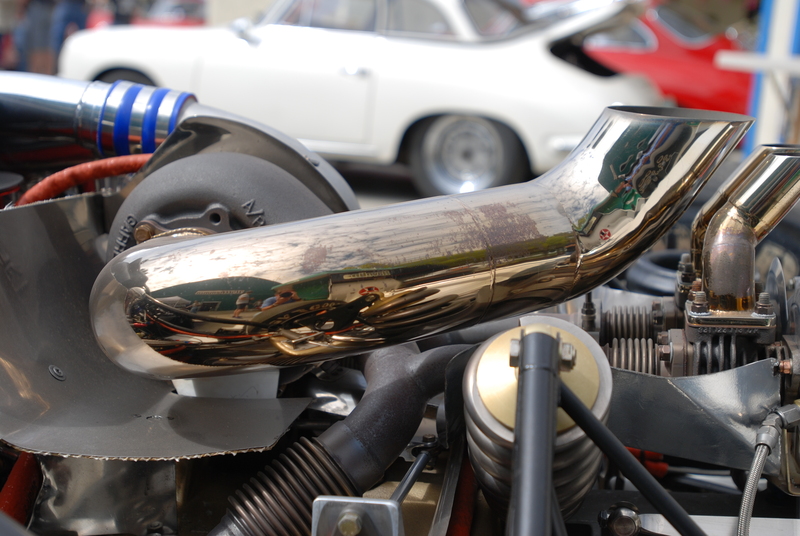 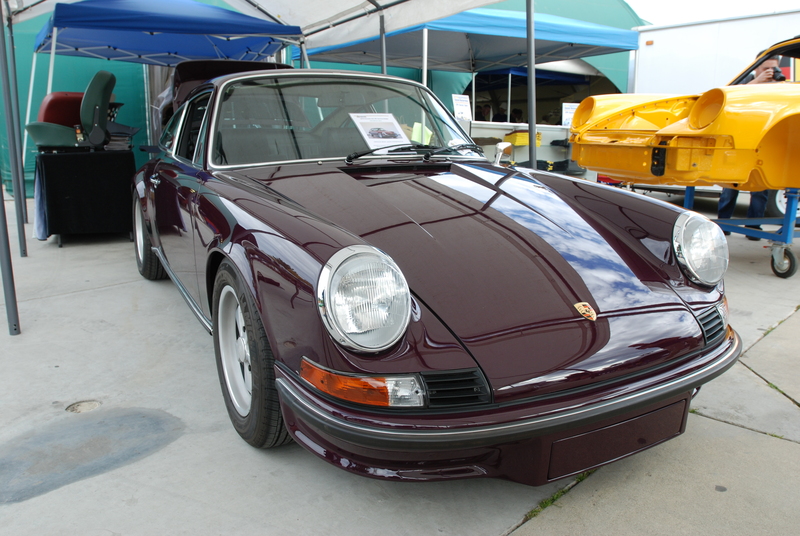 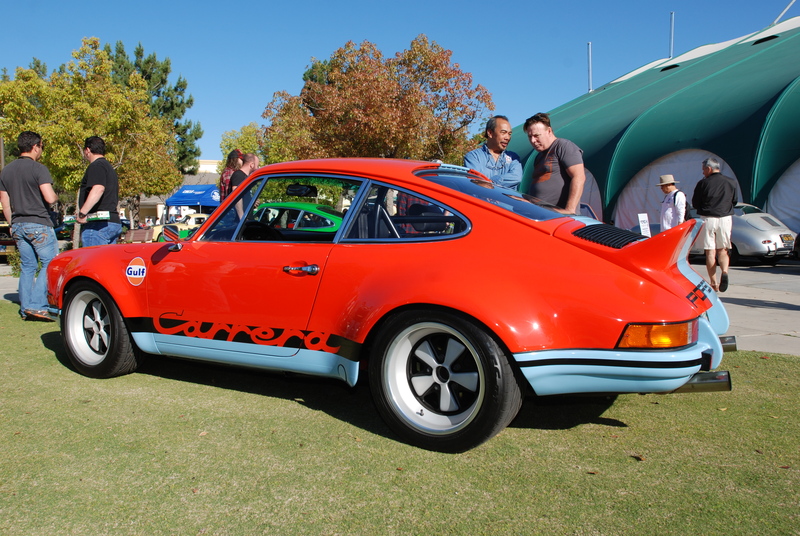 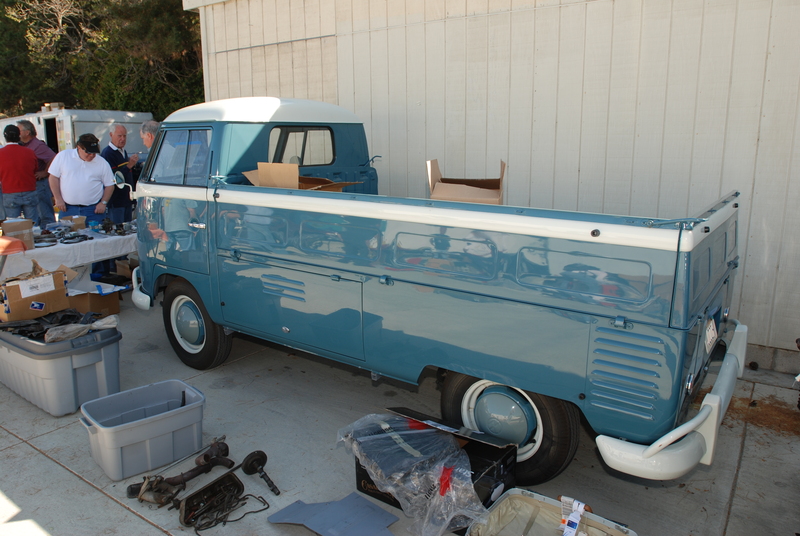 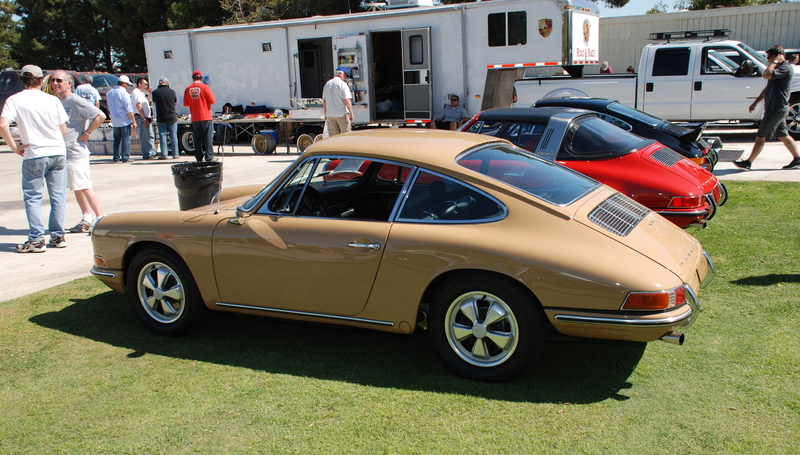 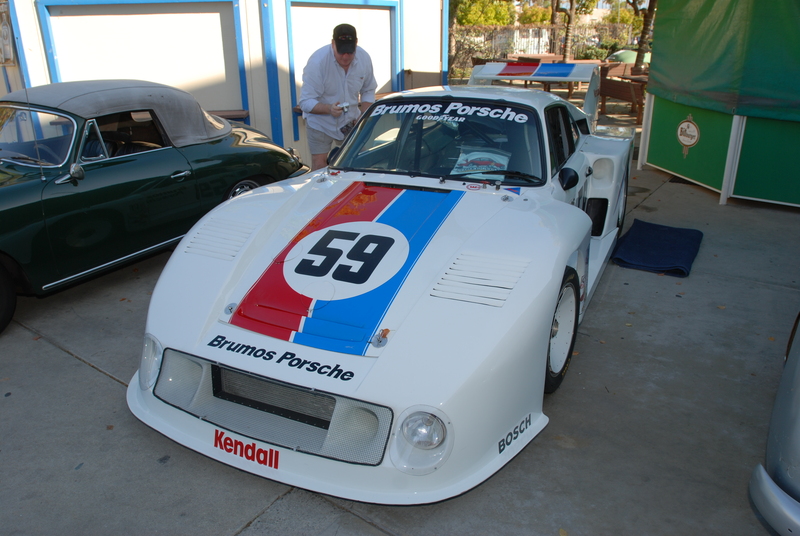 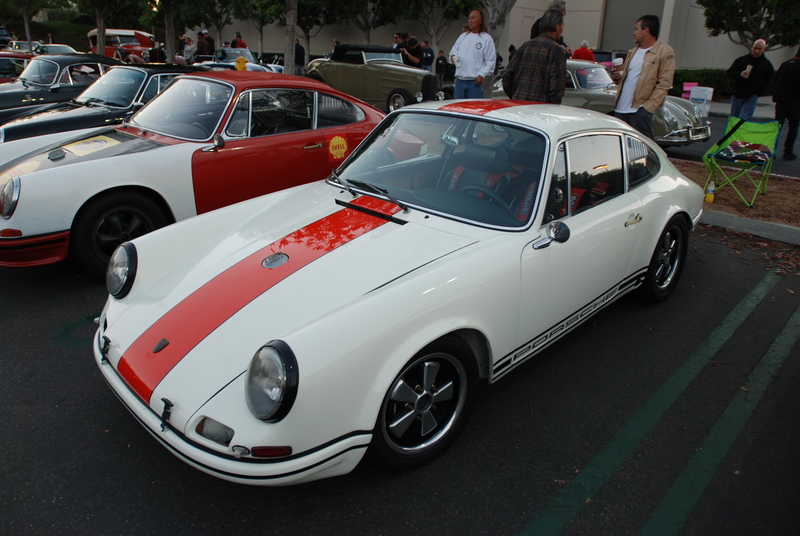 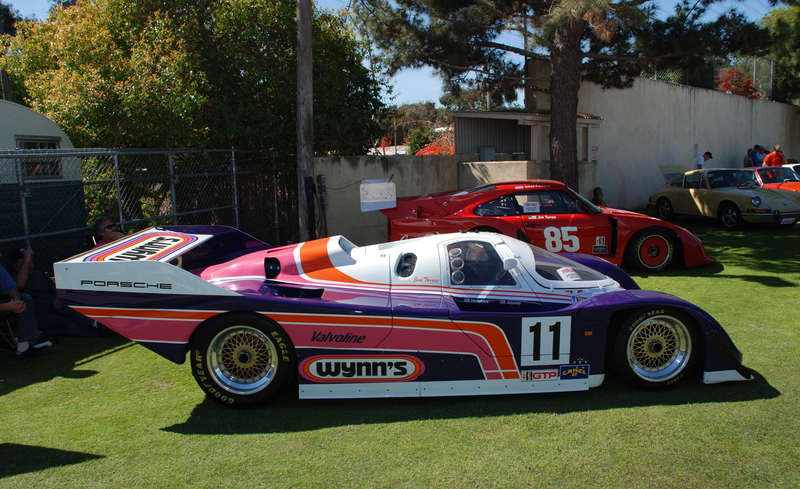 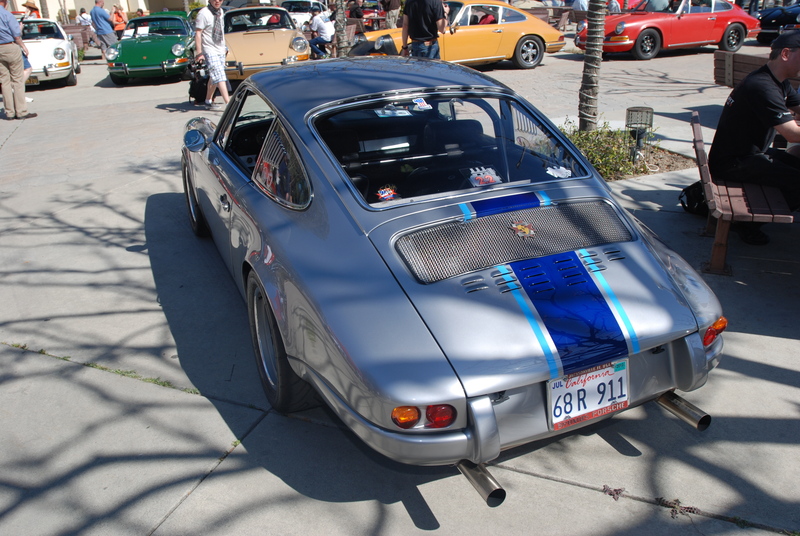 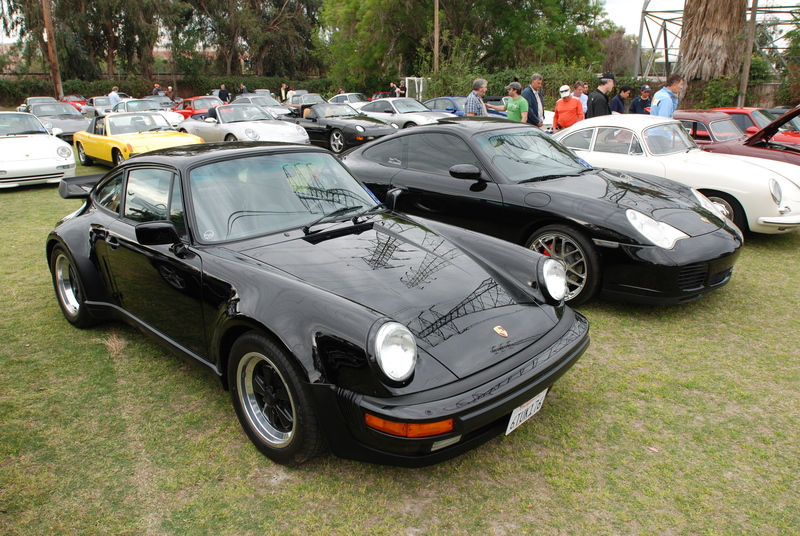 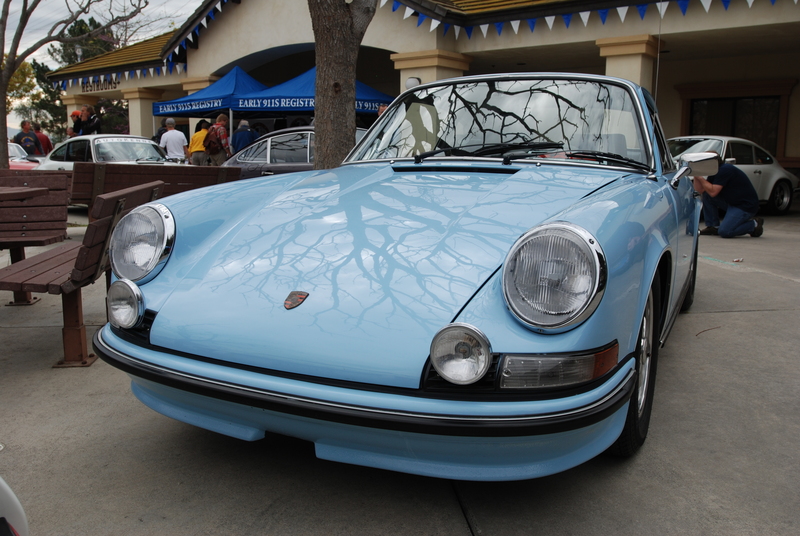 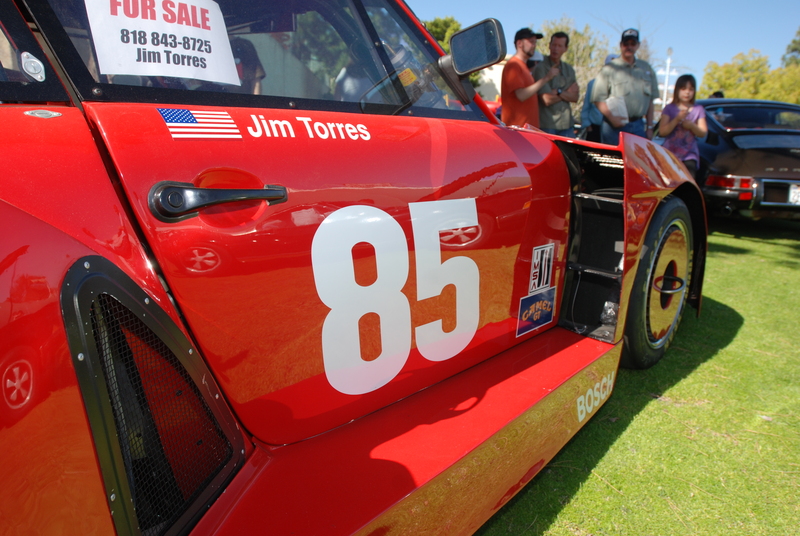 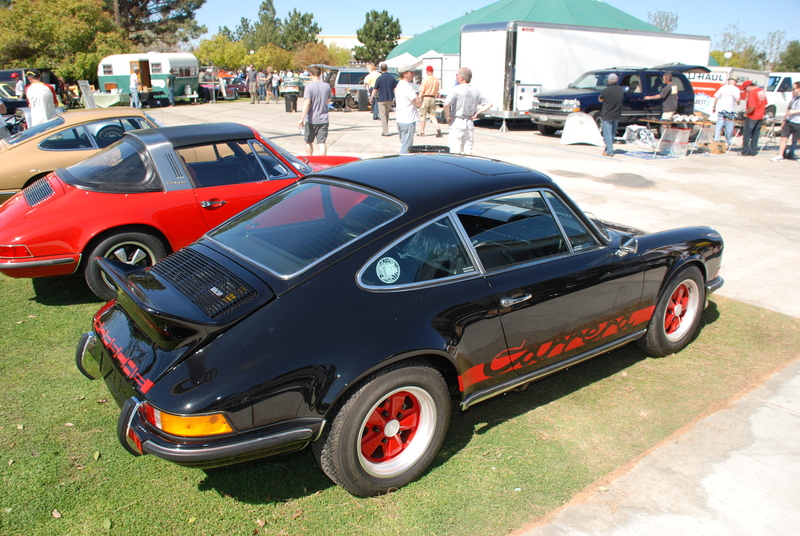 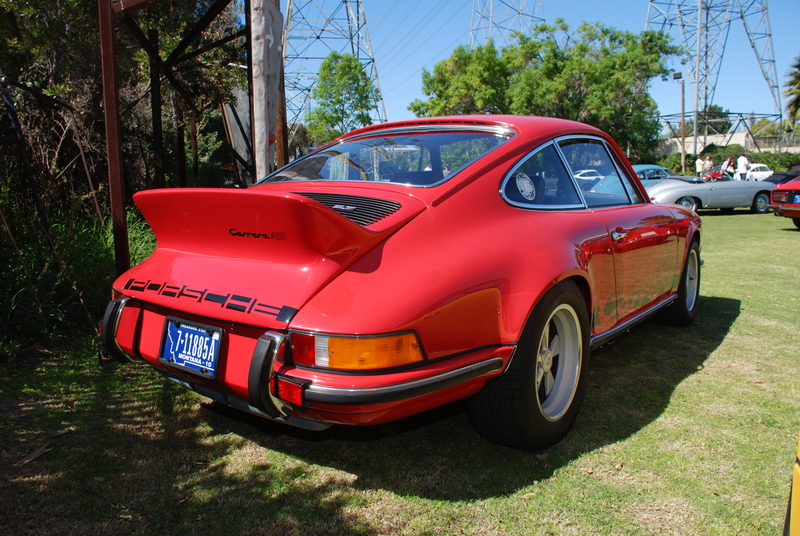 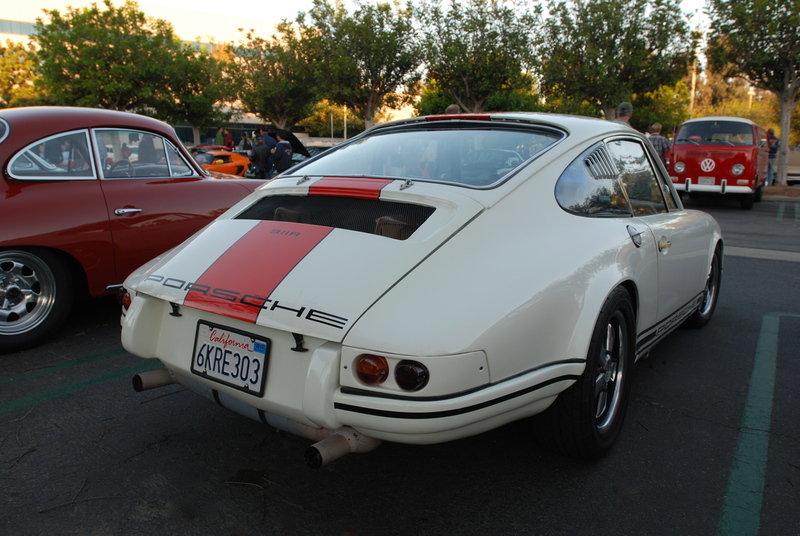 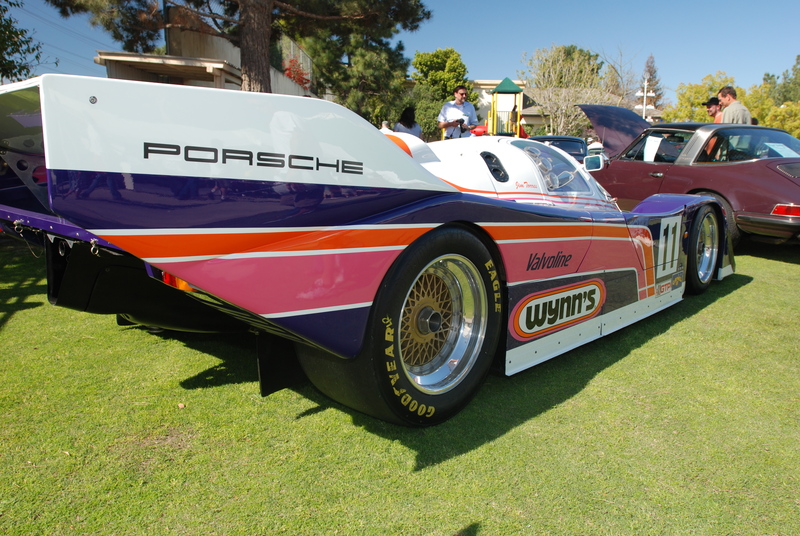 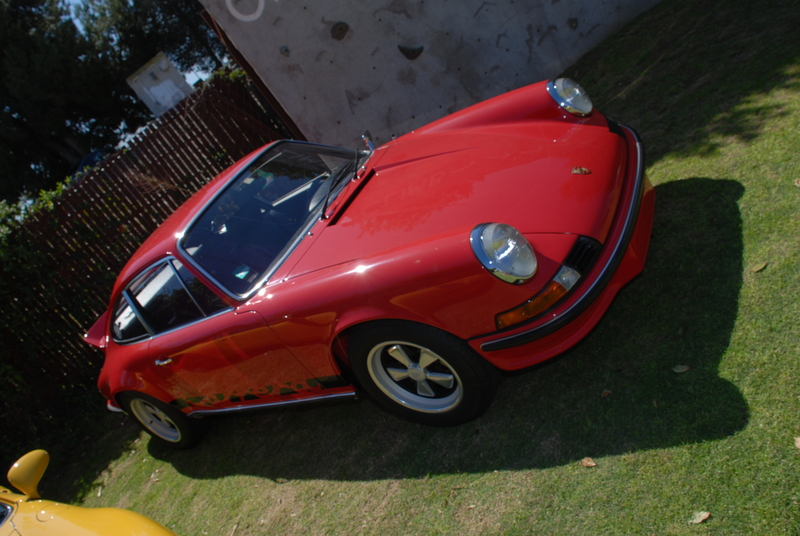 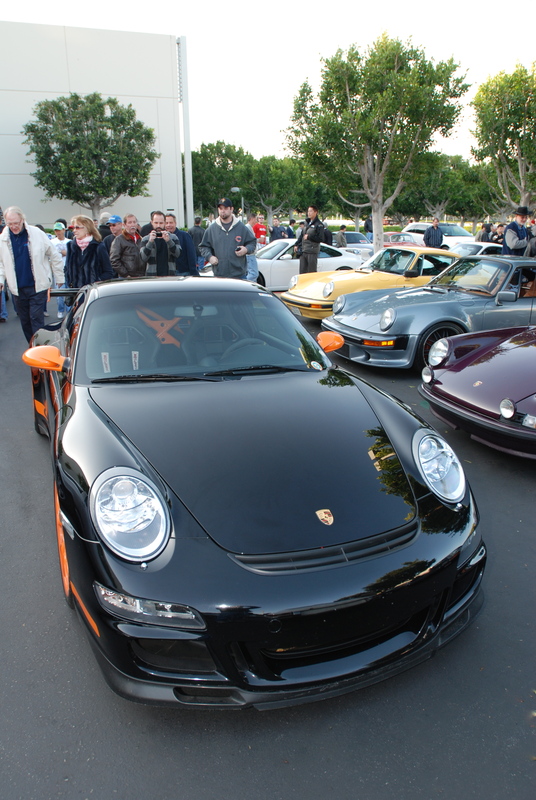 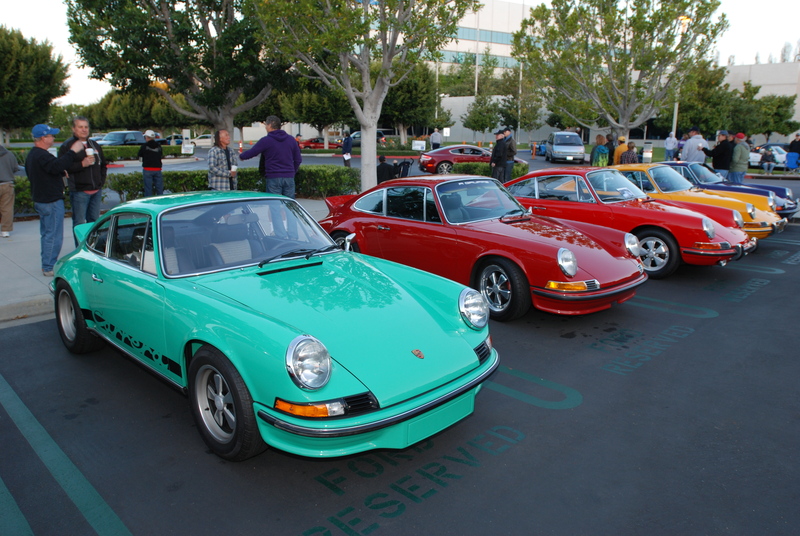 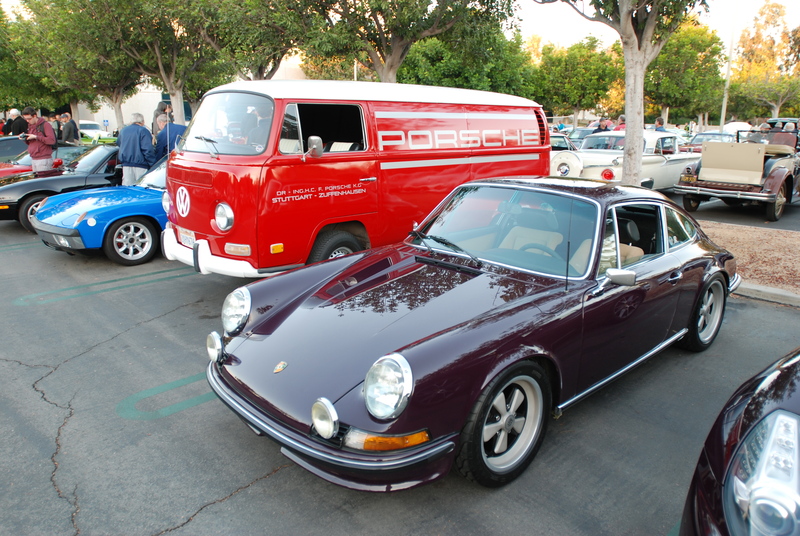 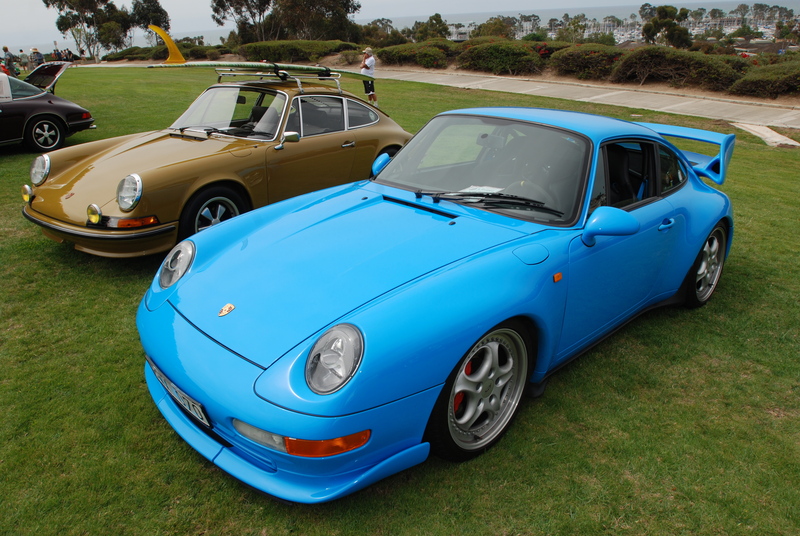 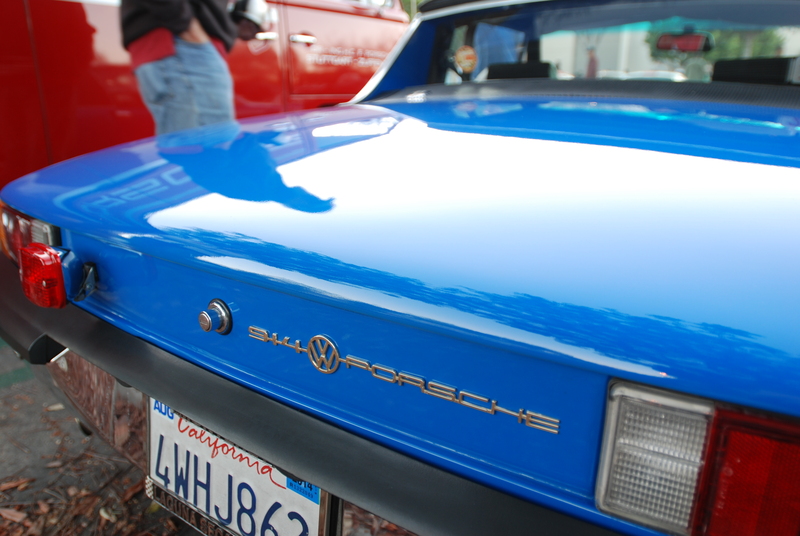 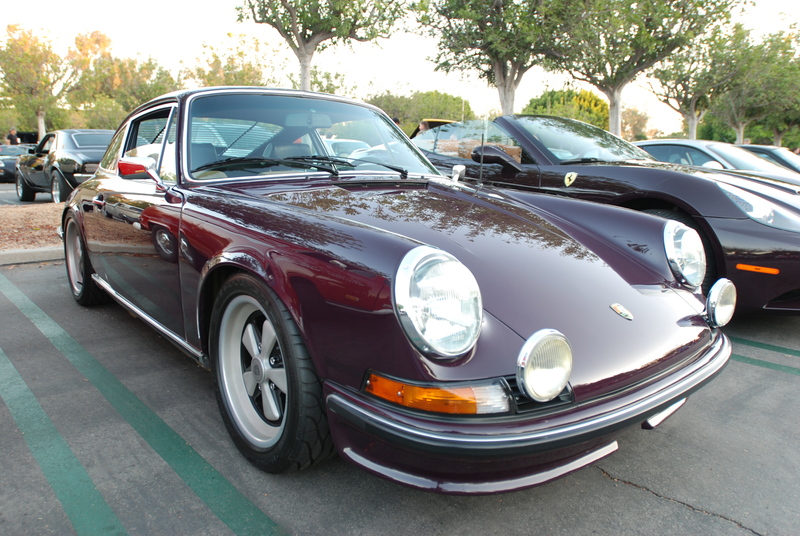 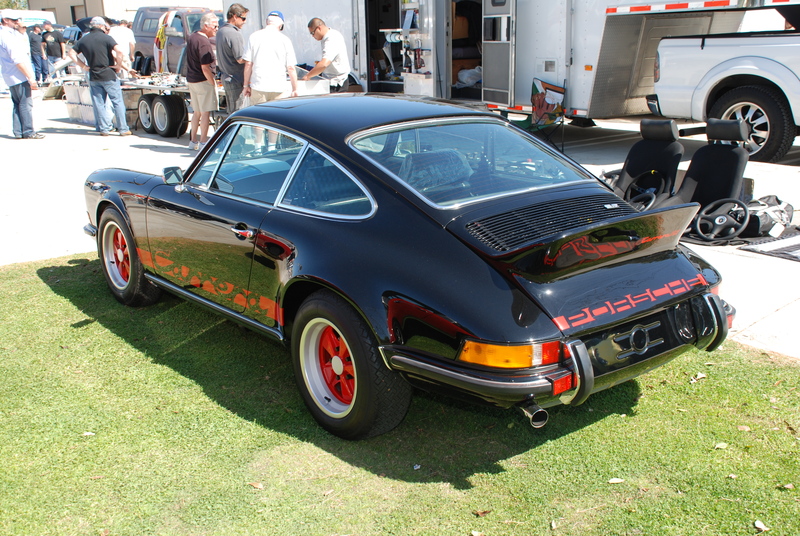 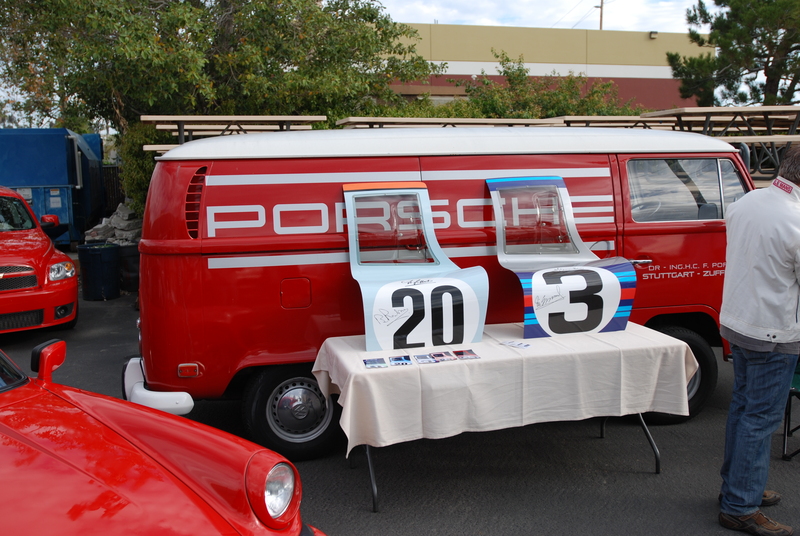 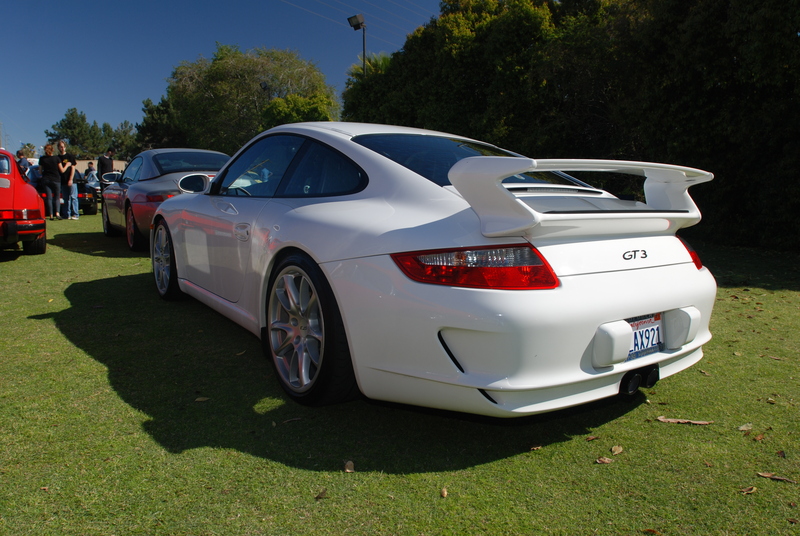 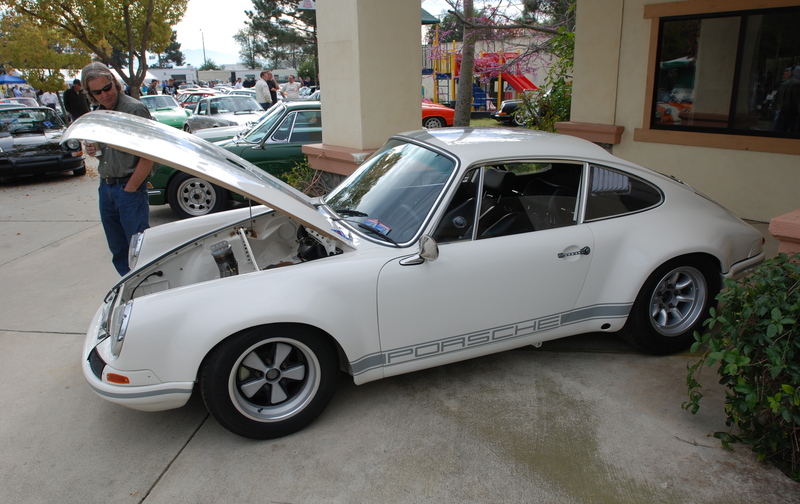 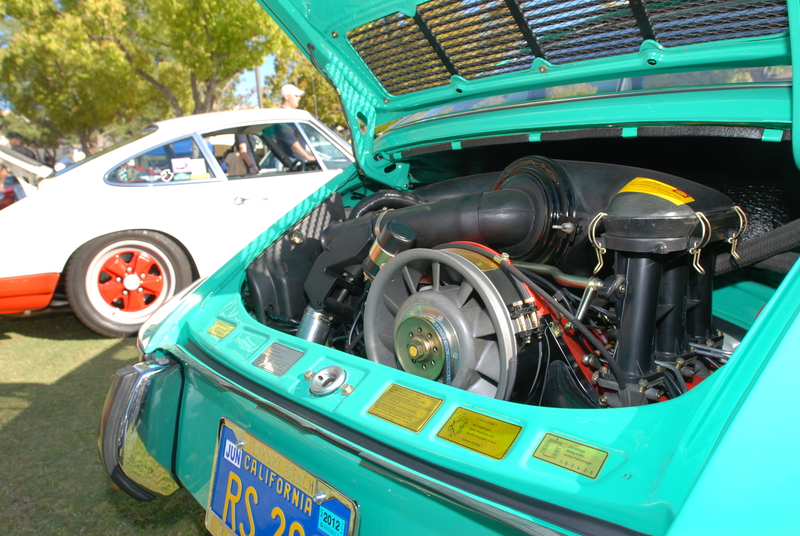 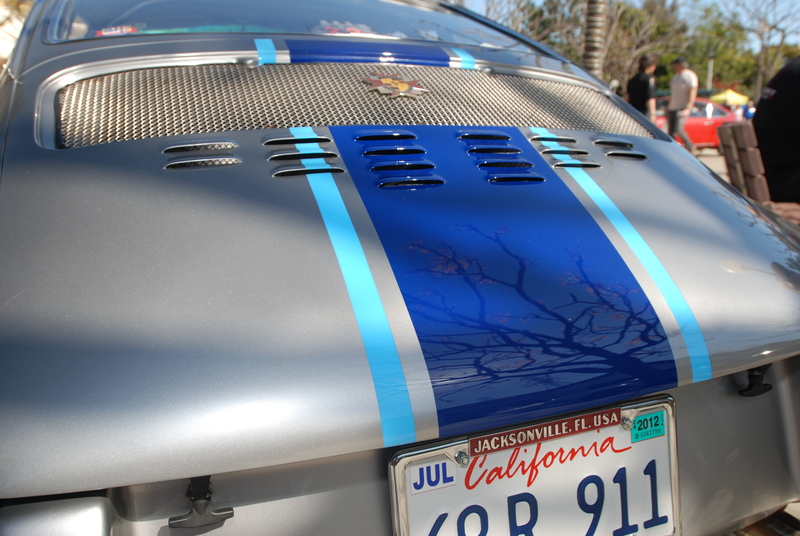 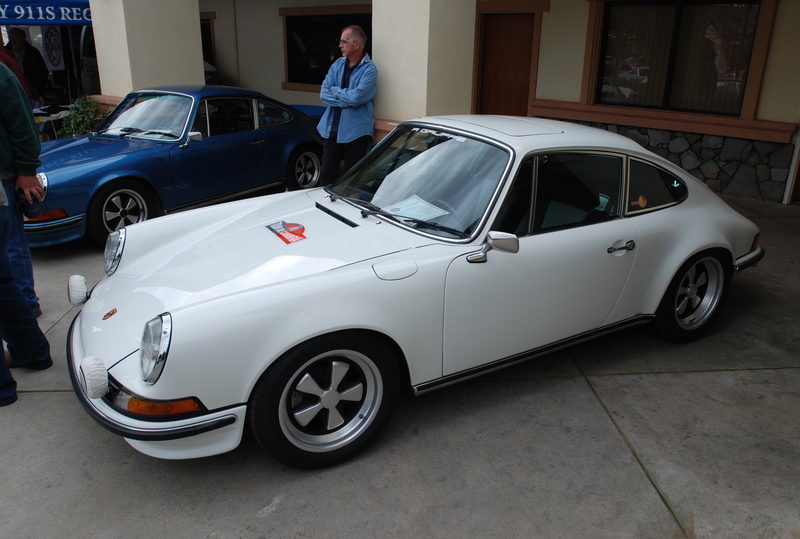 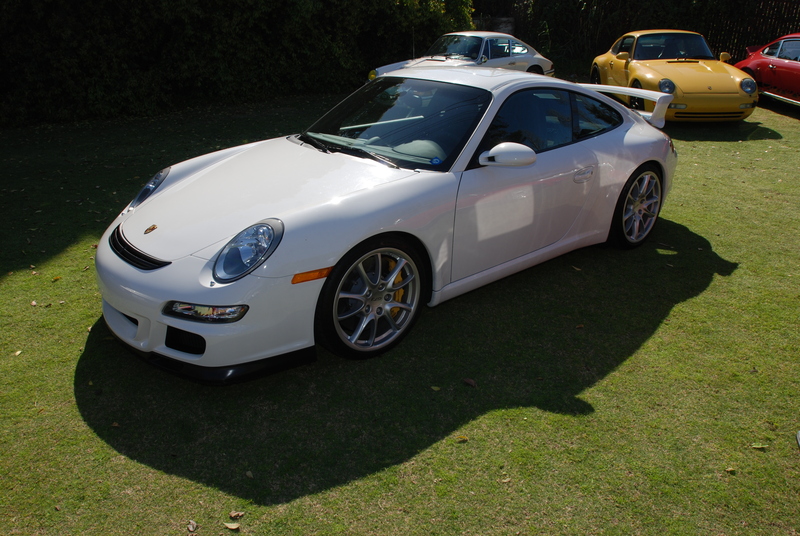 Once a year, the “Porsche literature, toy/model and memorabilia meet for Porsche and Vintage VW’s” comes to town, and is followed up by the all Porsche Swap and Car display on Sunday, held at the Phoenix Club located in Anaheim, California. 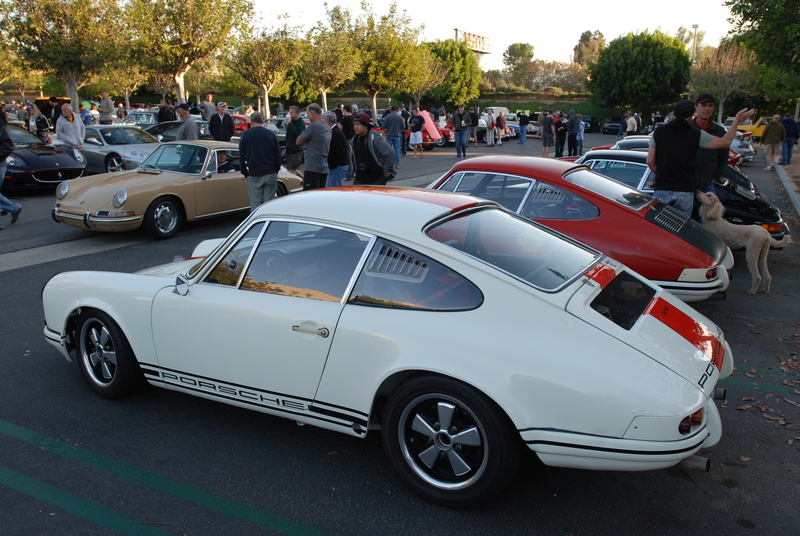 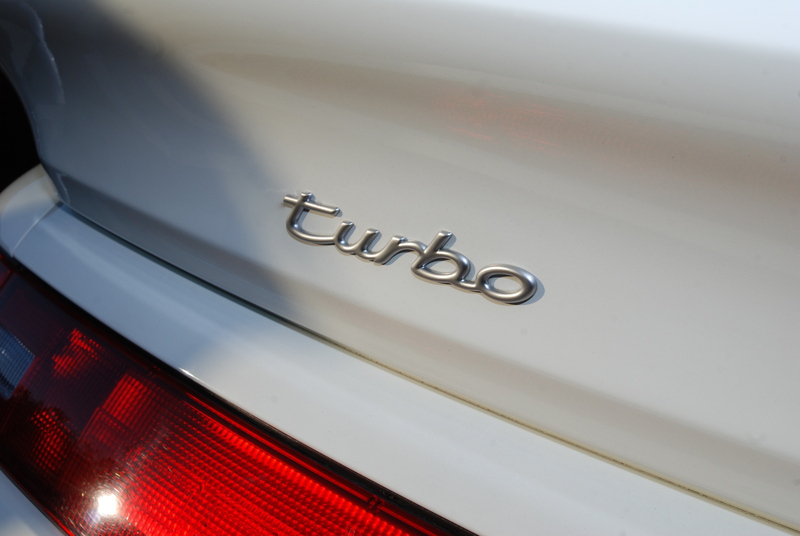 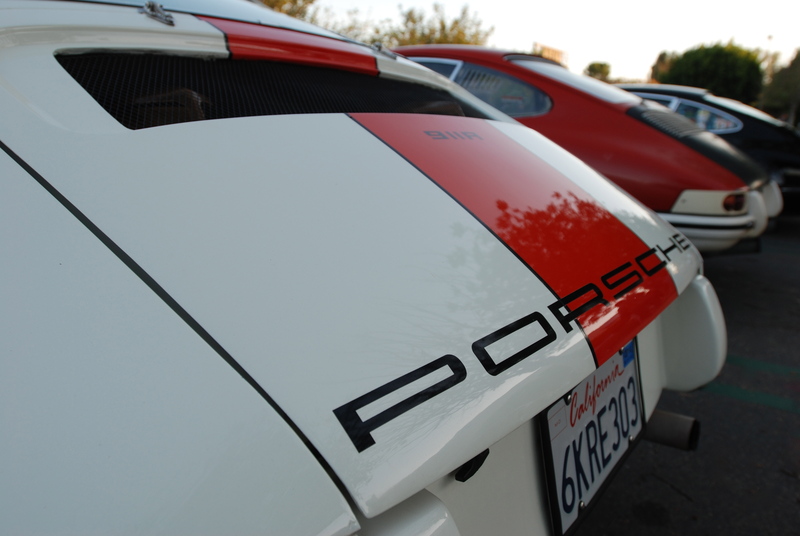 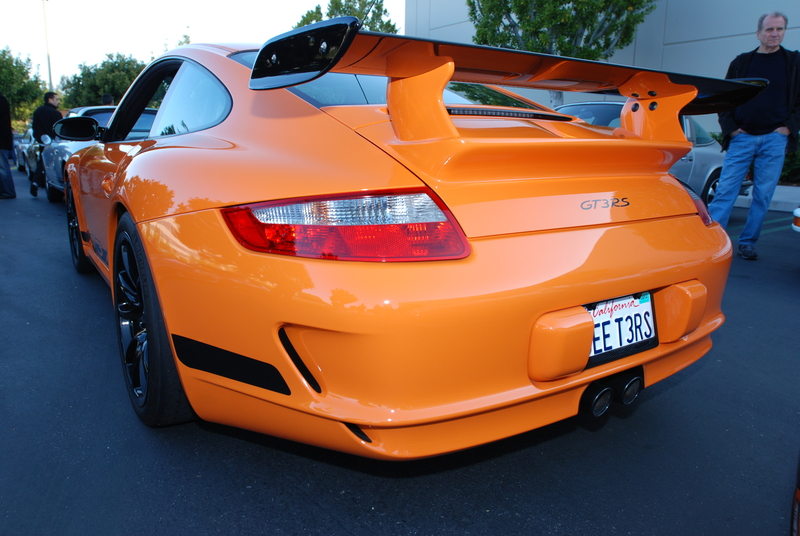 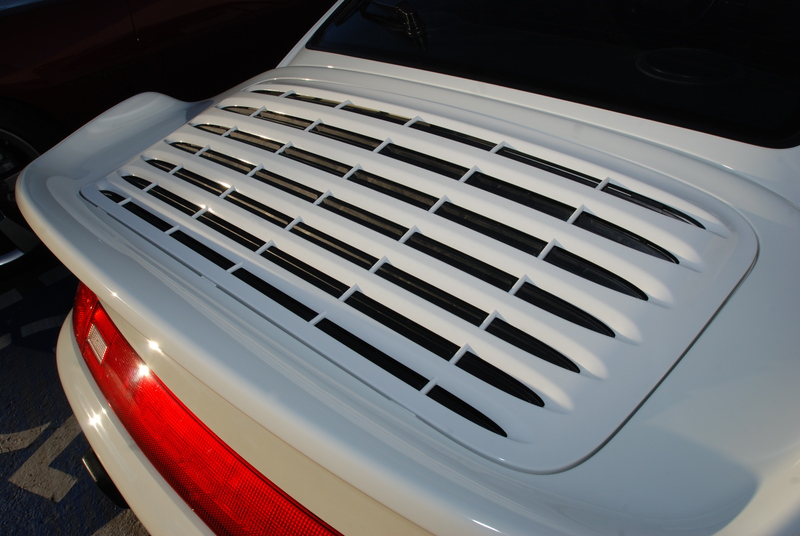 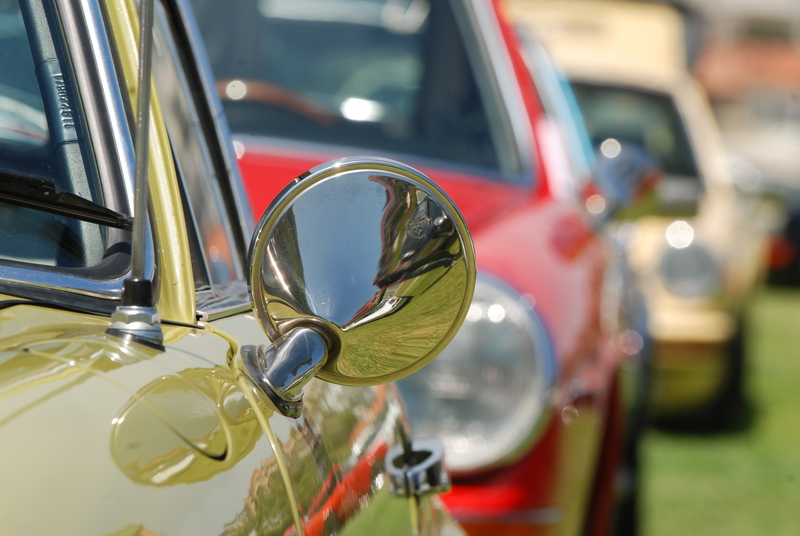 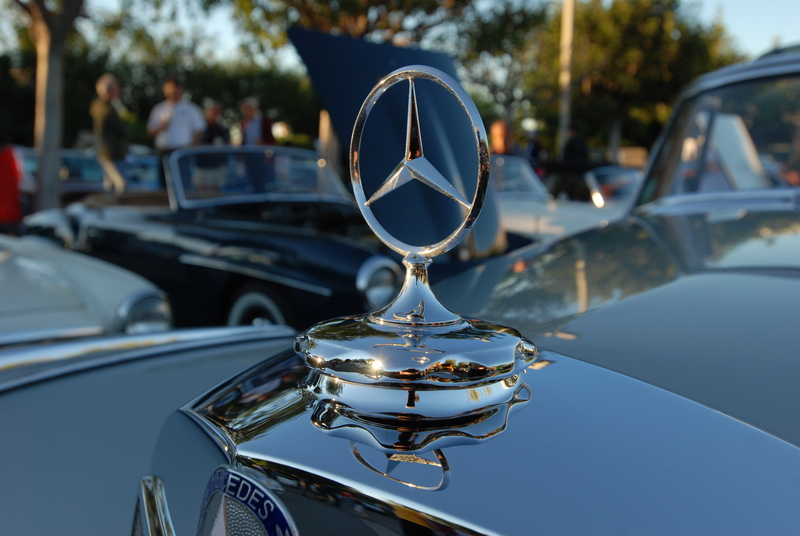 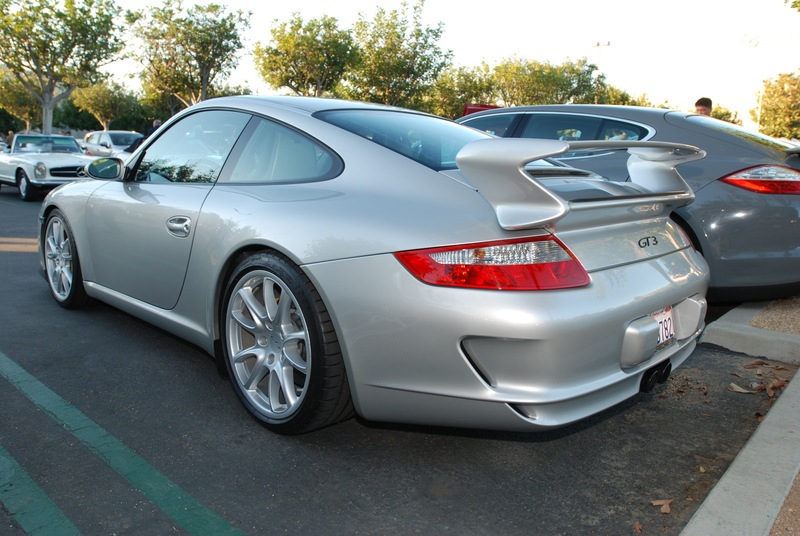 By the time I arrived at the Phoenix Club (at 7:30 AM), I was greeted by one very long, single file line of Porsches, queued up nose to tail, awaiting entry into the event to be part of the car display. 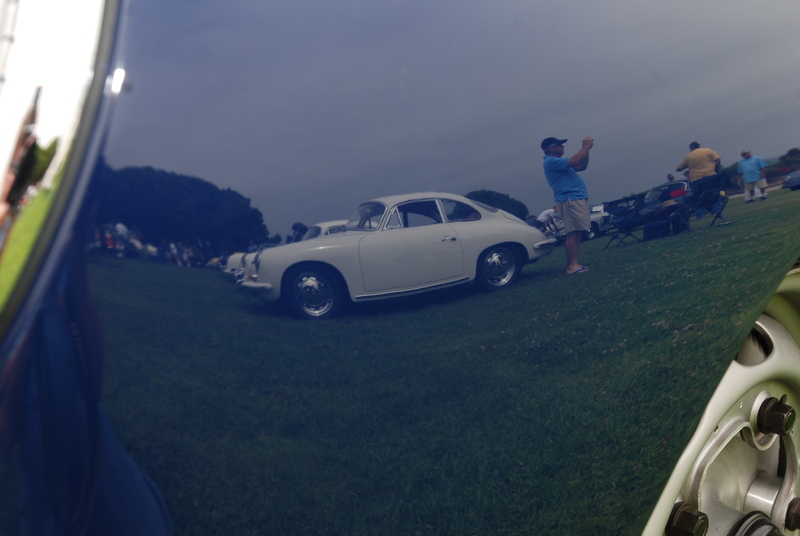 So I tucked in line, to wait with the rest of the assembled masses. 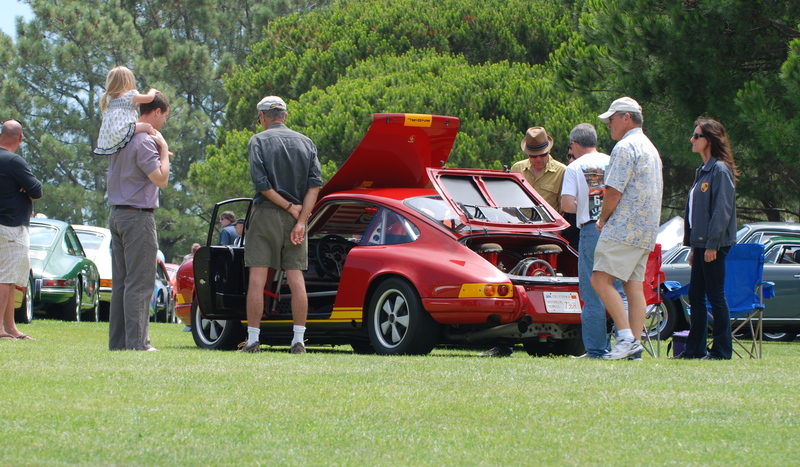 As soon as the gate opened, we were routed through the aisles of the already active swap meet, with our final destination being the grassy field at the back, selected for the days display parking. 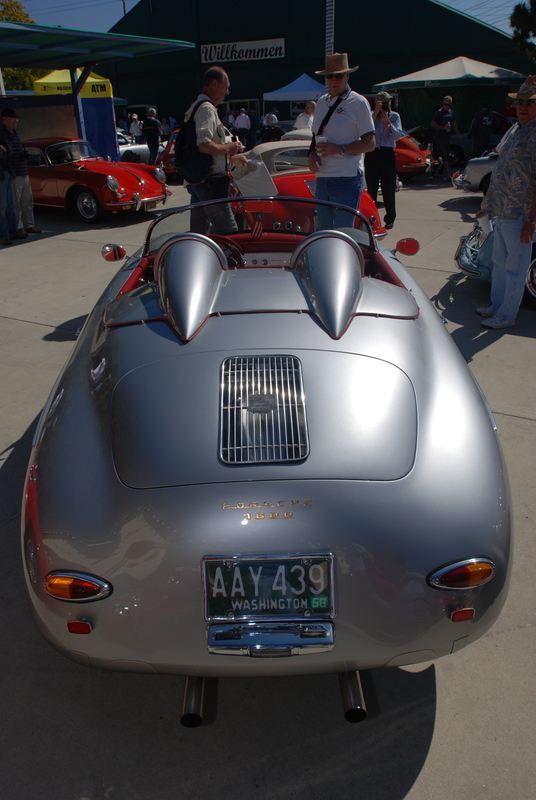 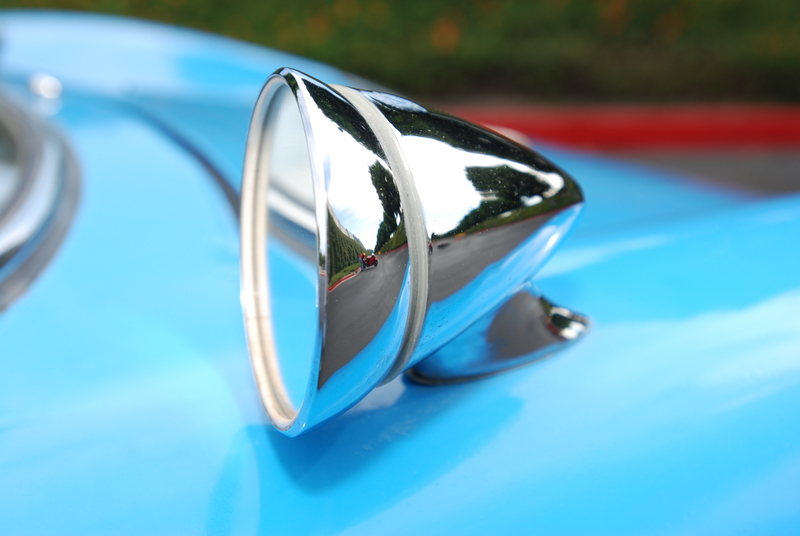 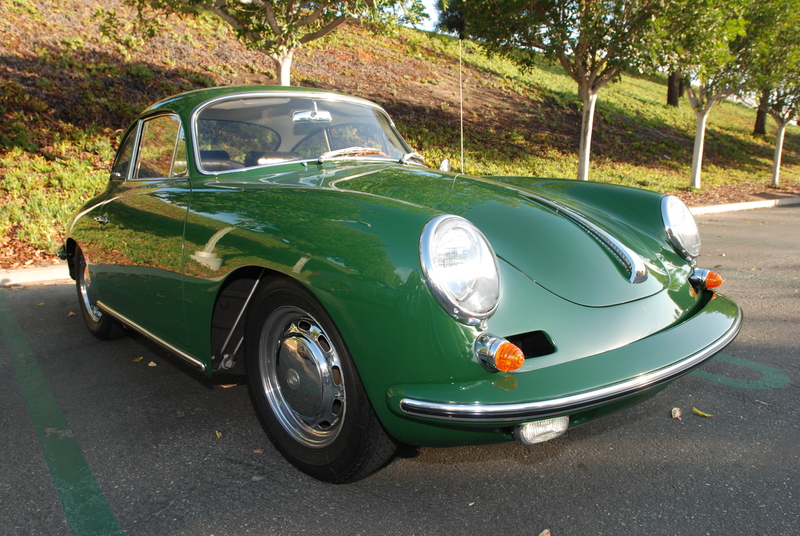 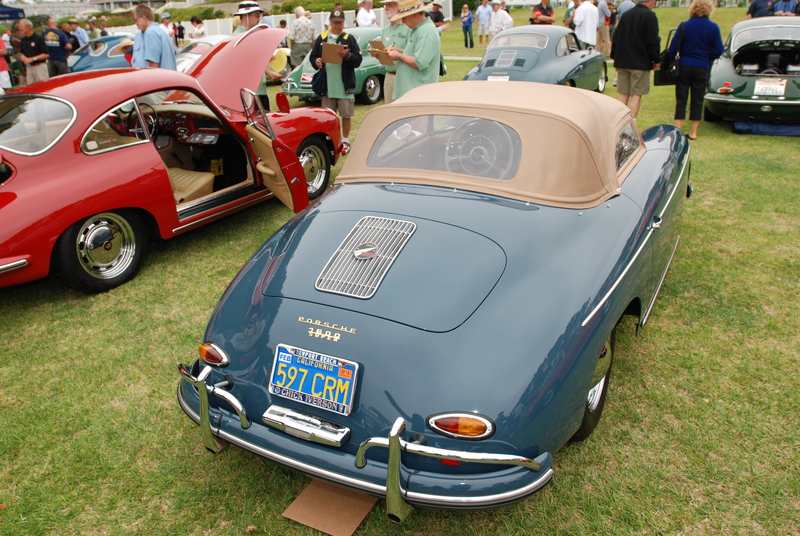 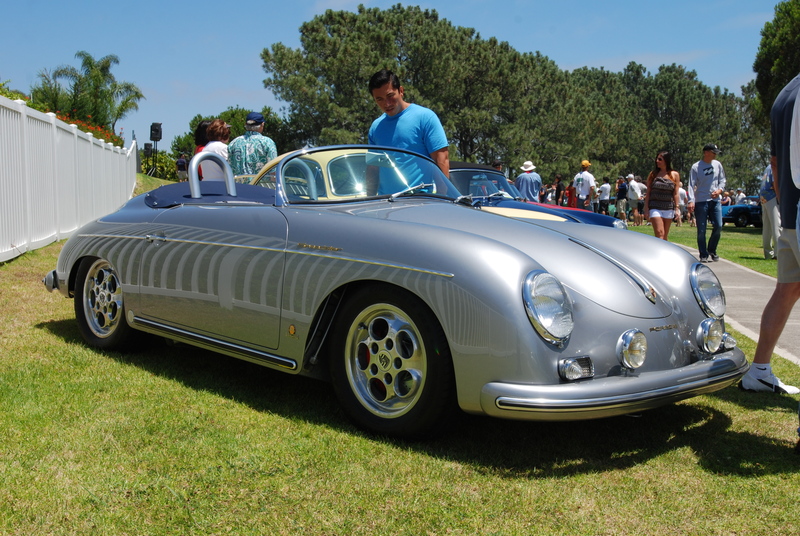 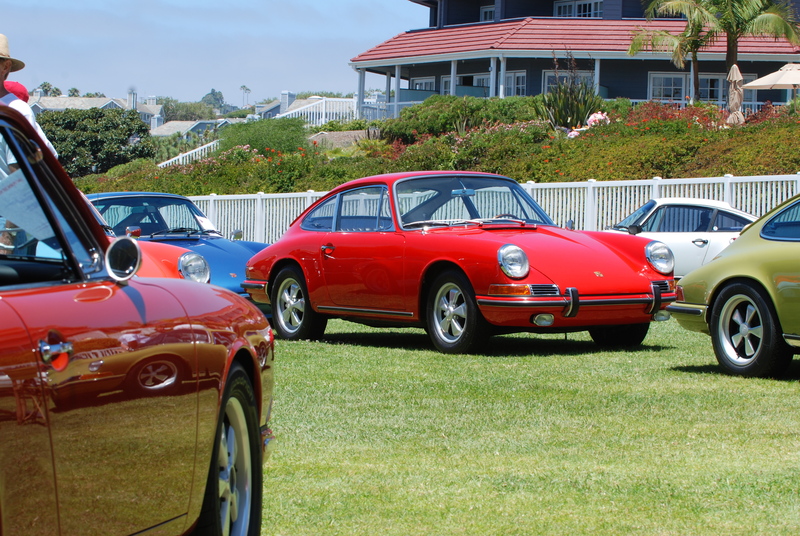 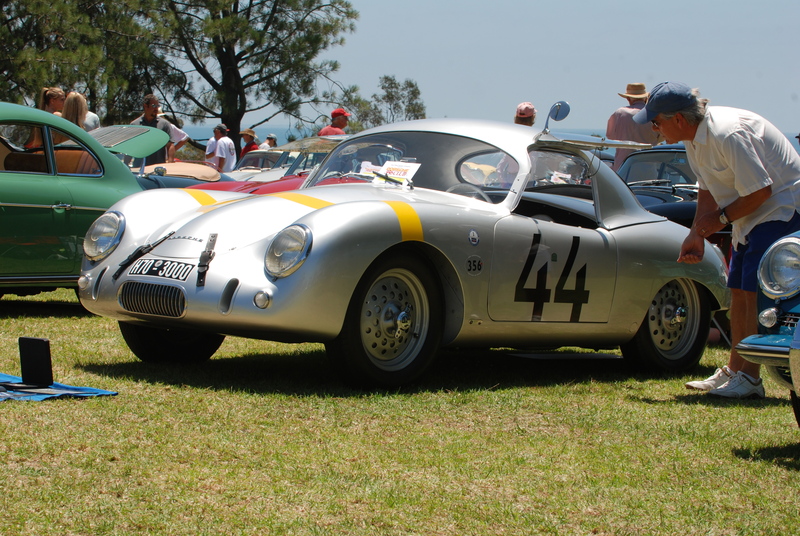 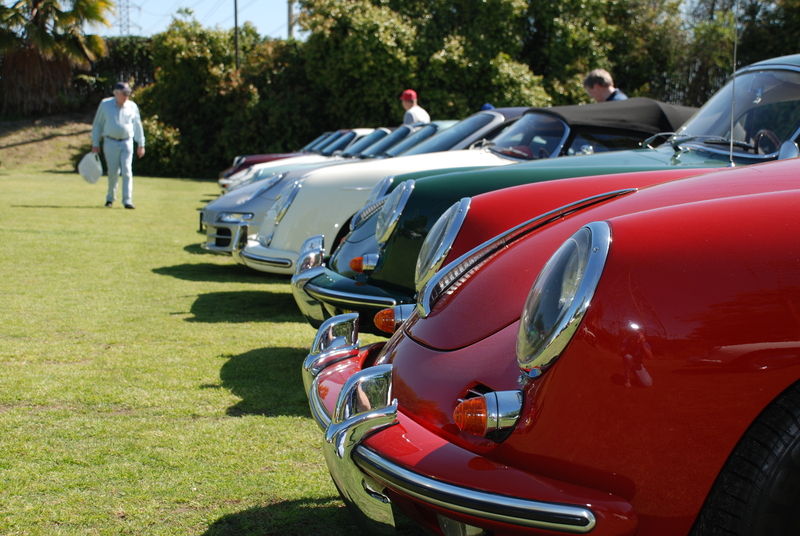 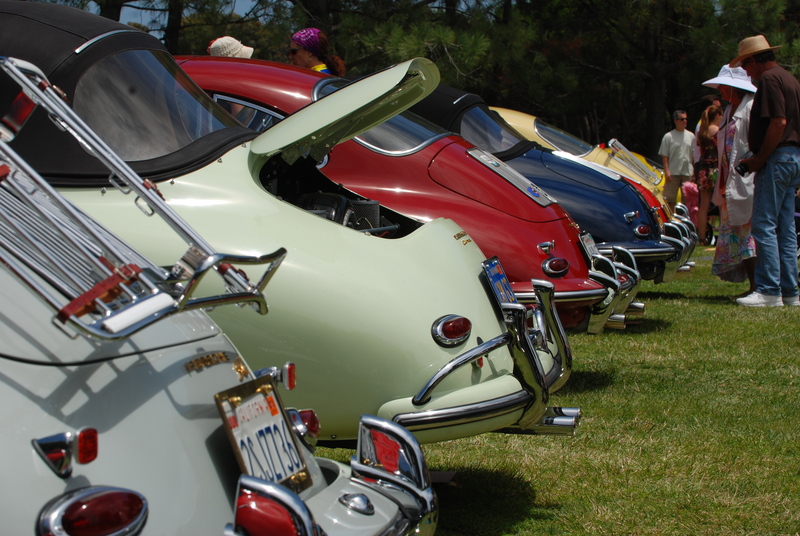 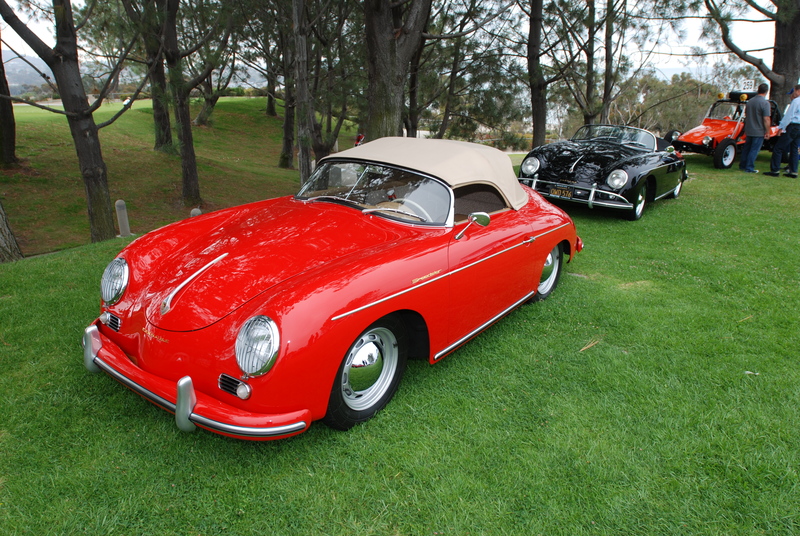 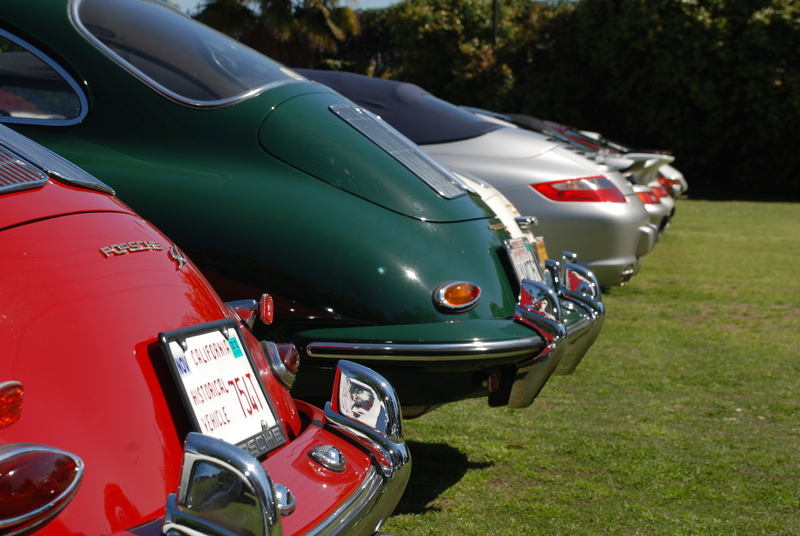 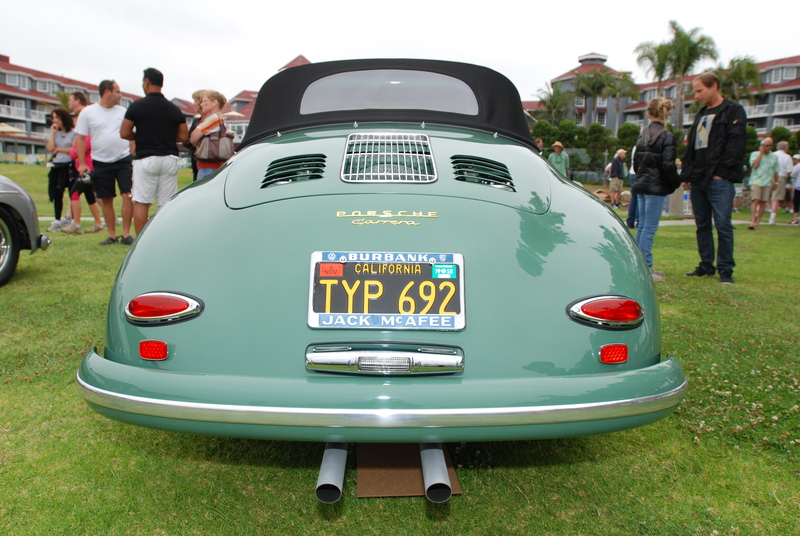 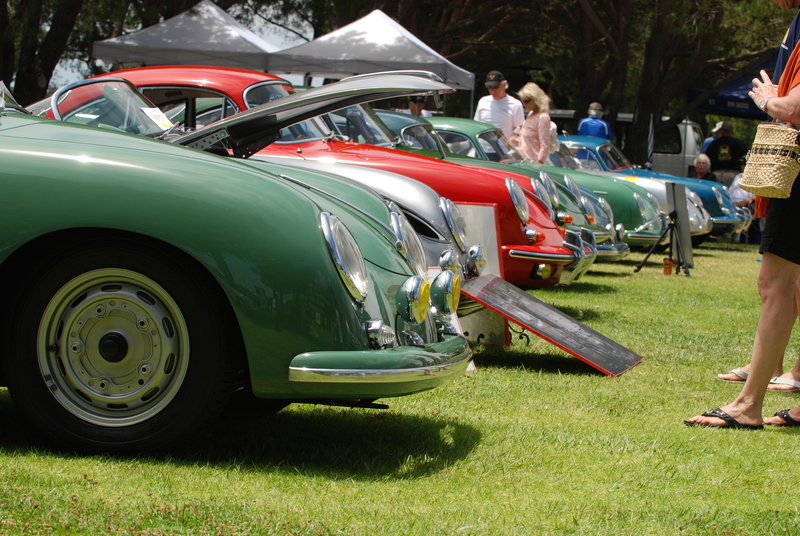 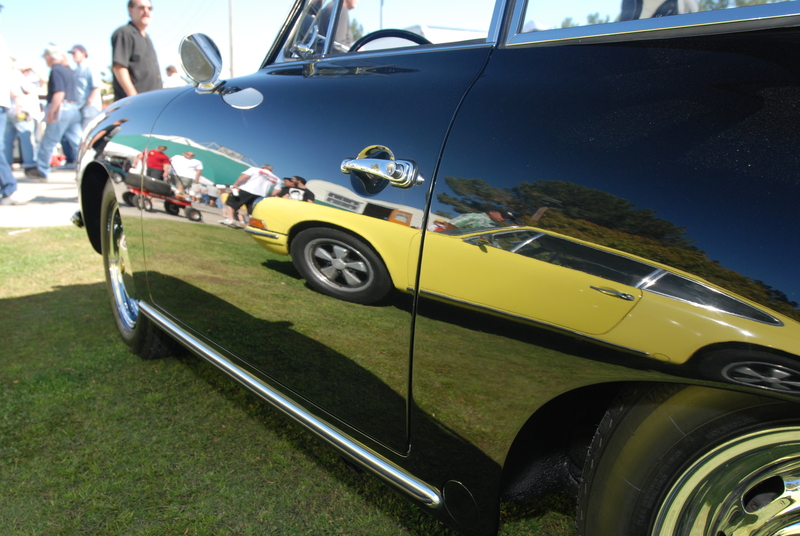 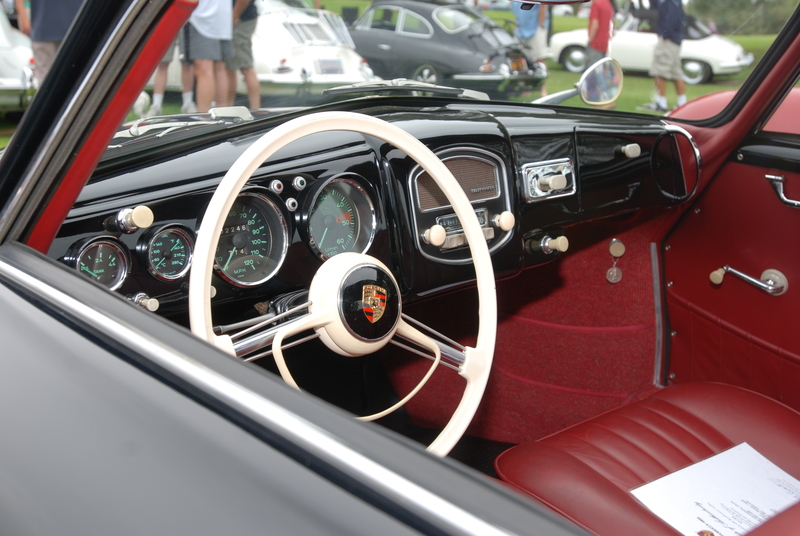 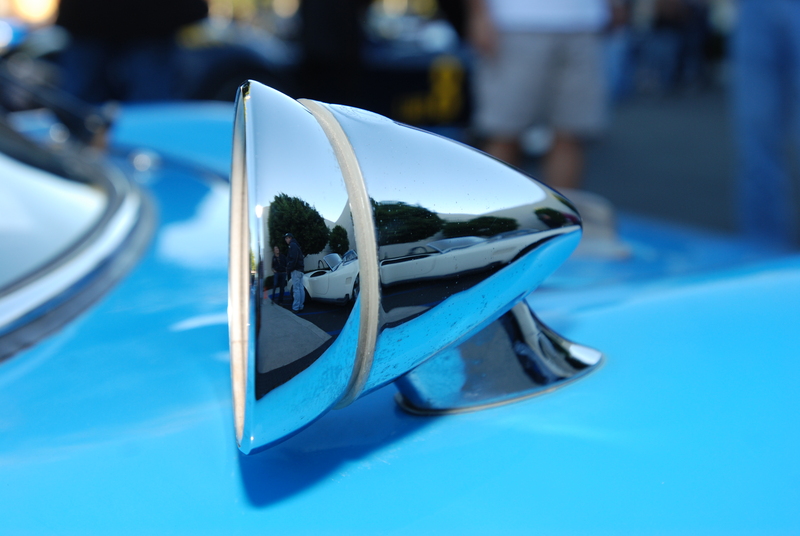 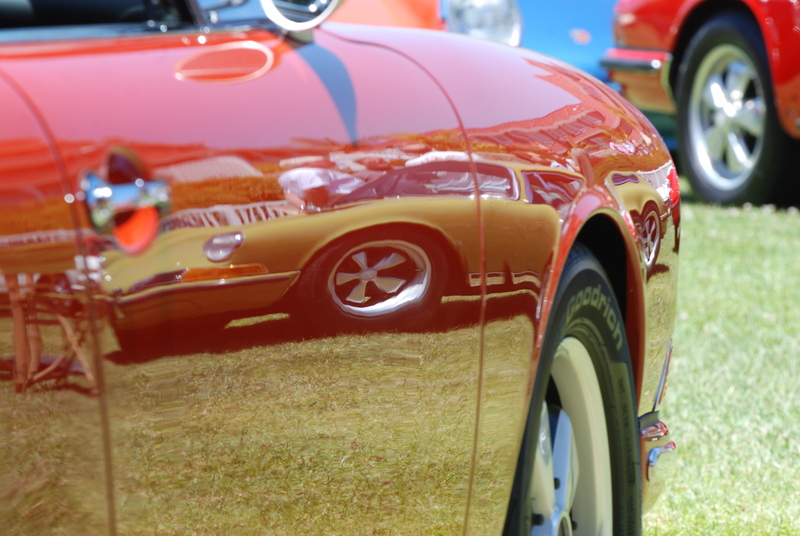 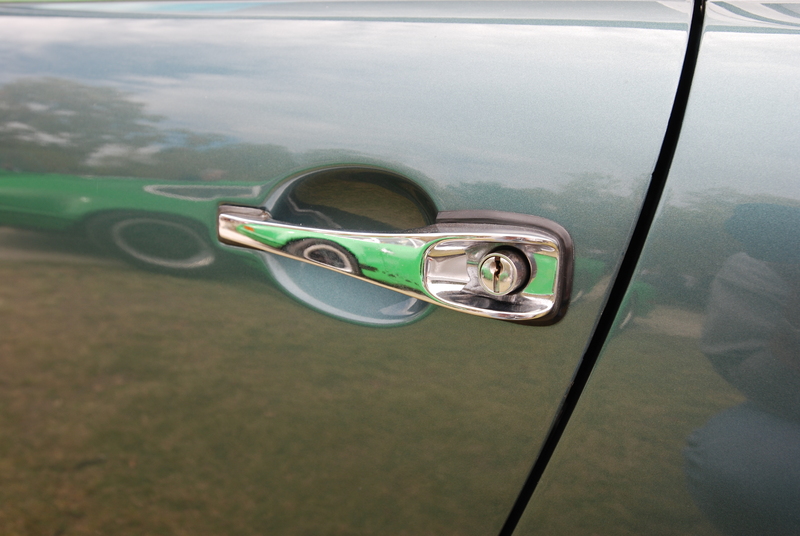 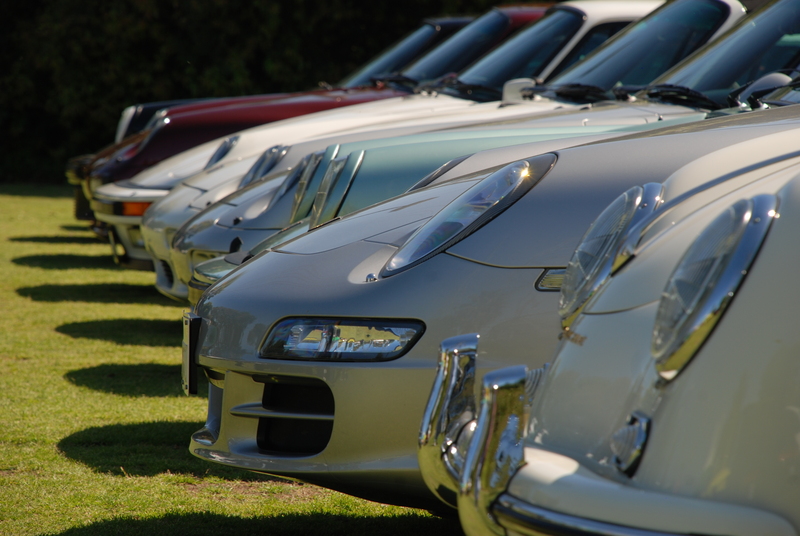 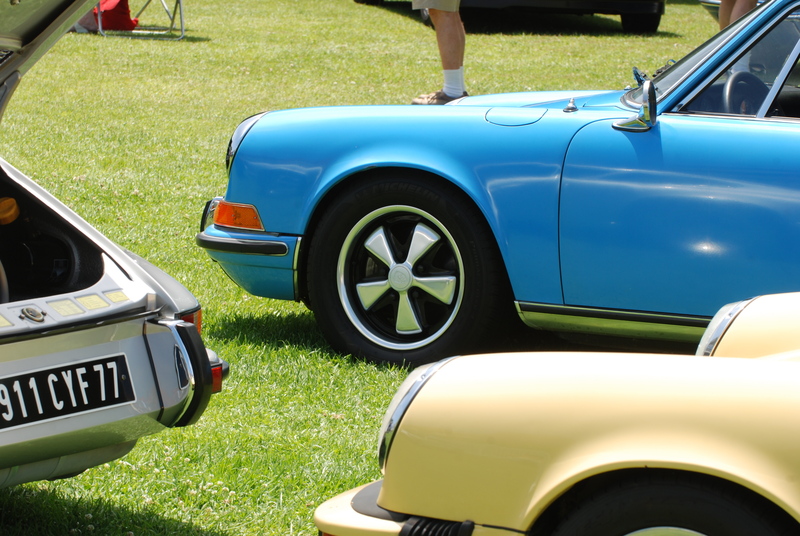 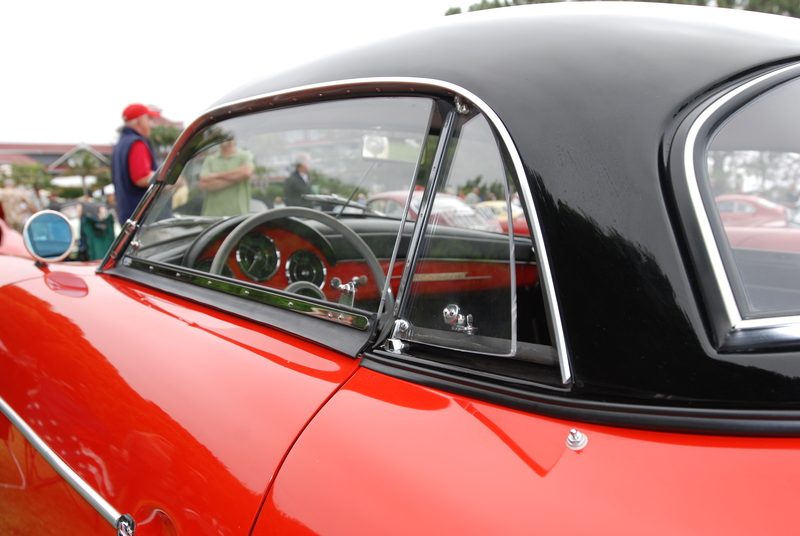 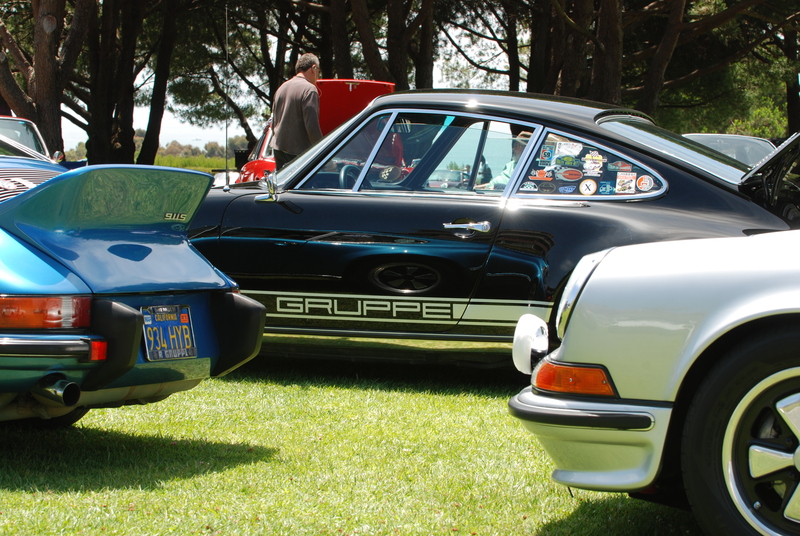 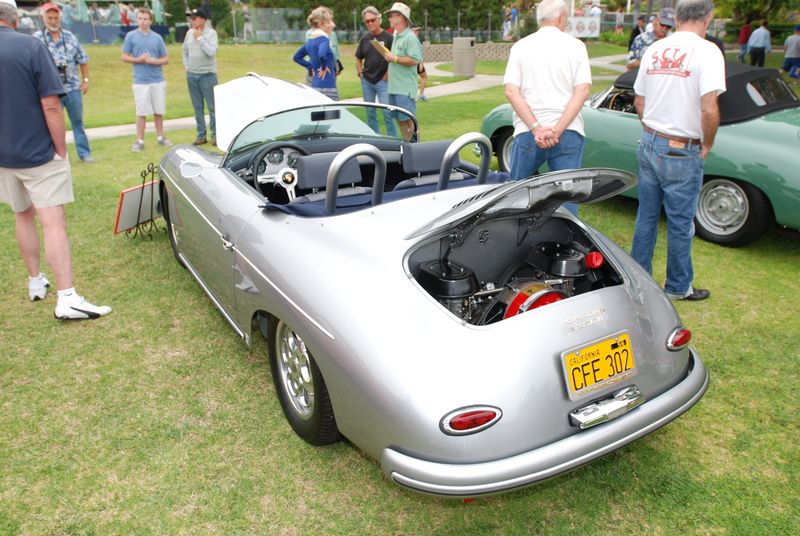 Various car clubs and their members (the 356 Registry, Early S Registry, POC, and the RGruppe just to name a few), had been granted priority parking, and were already staged about the grounds. 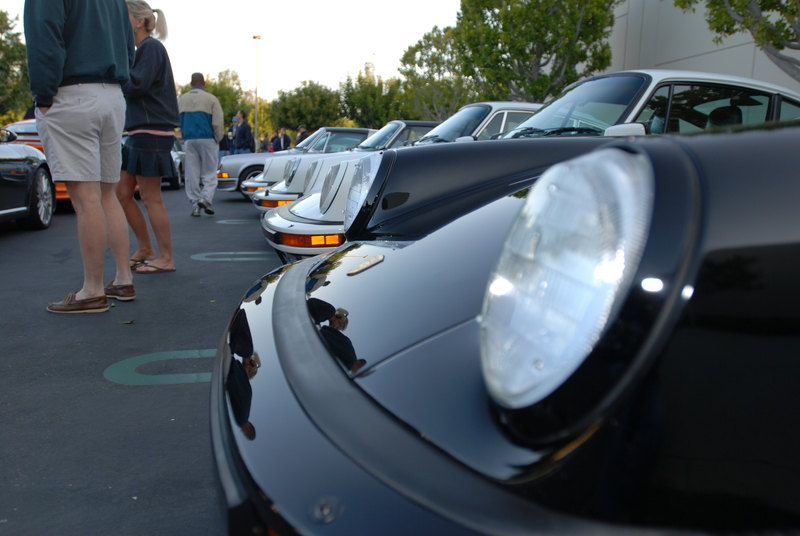 (I found out later that they had all arrived at 6 AM for positioning). 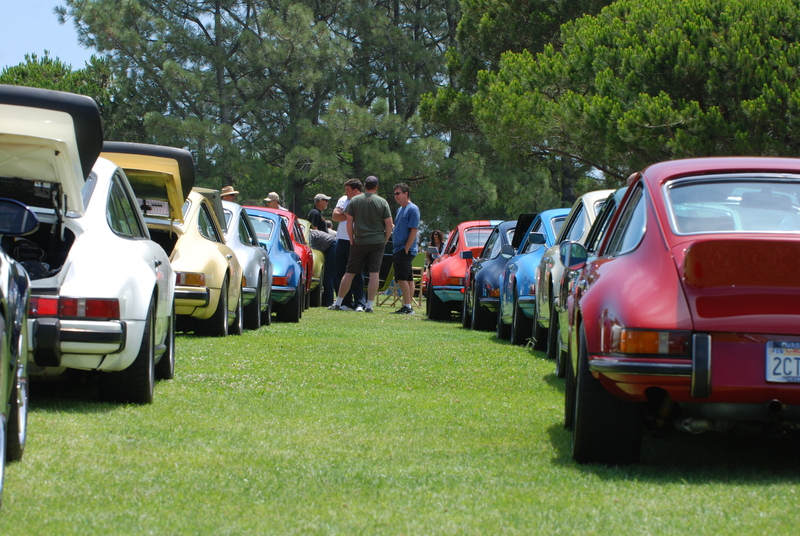 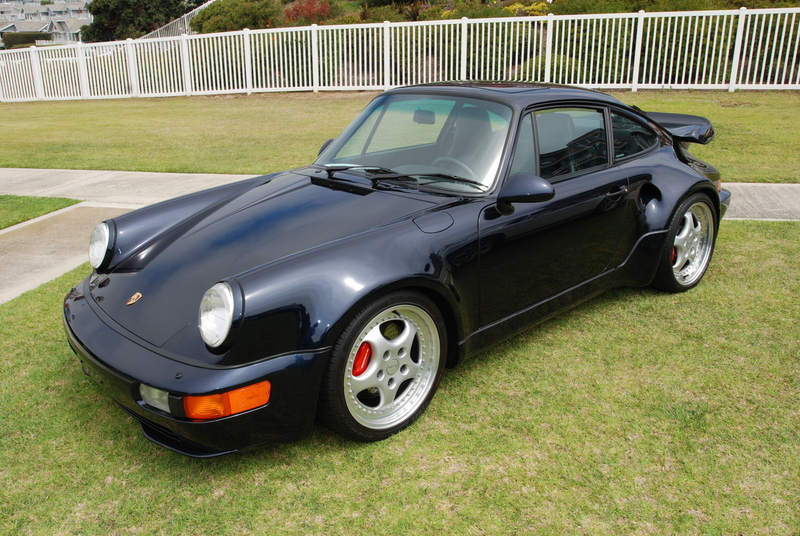 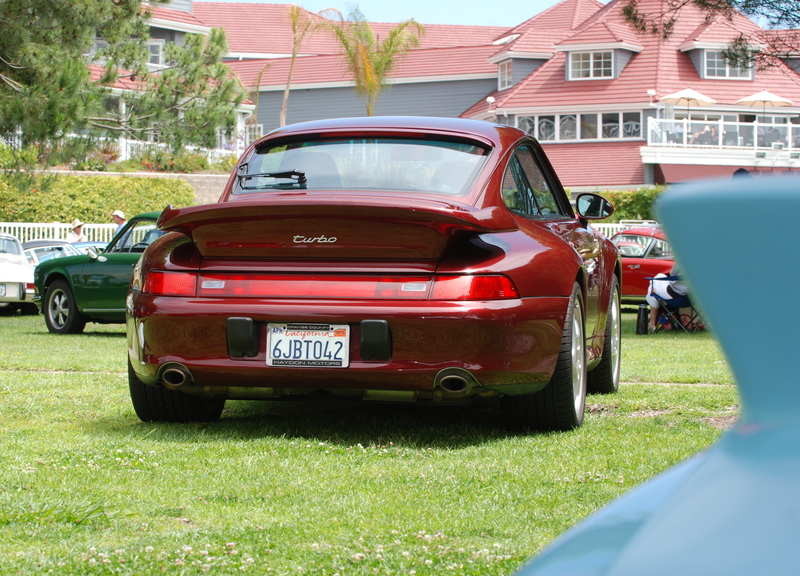 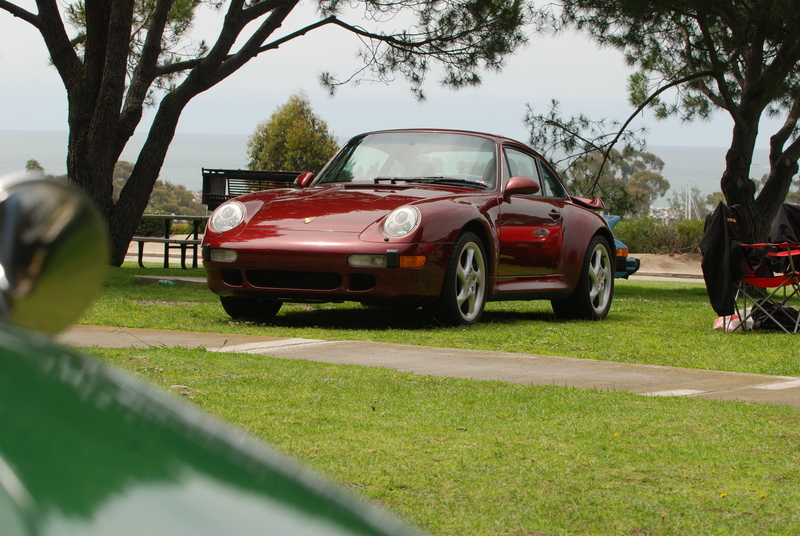 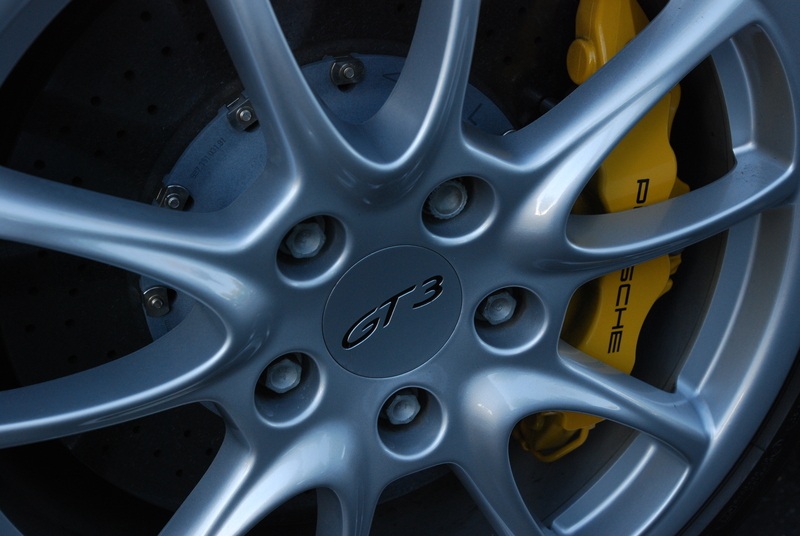 Once parked on the lawn, and after a quick scan of the surrounding cars, it was time to grab my camera and head off to check out the undiscovered Porsches. 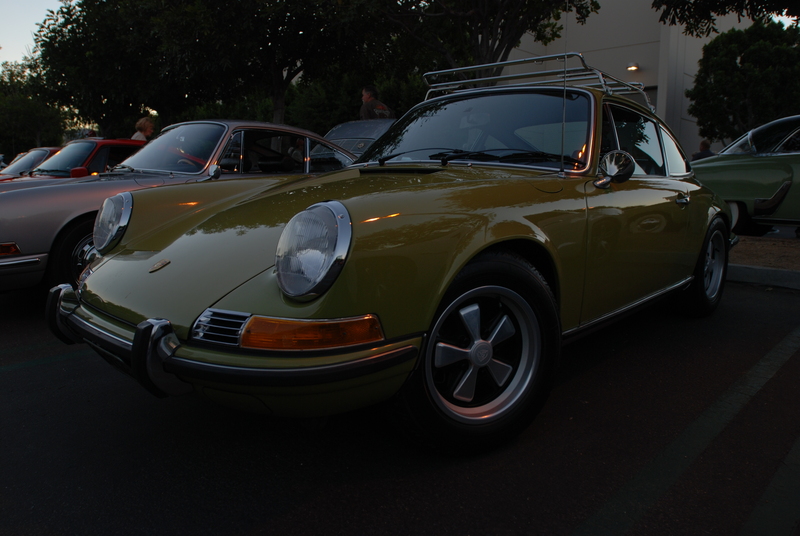 And with one last Carrera RS sighting, it was time to head home.